The longest word I’ve used in actual conversation is: boustrophedonically. However, I just learned another one: floccinaucinihilipilification. 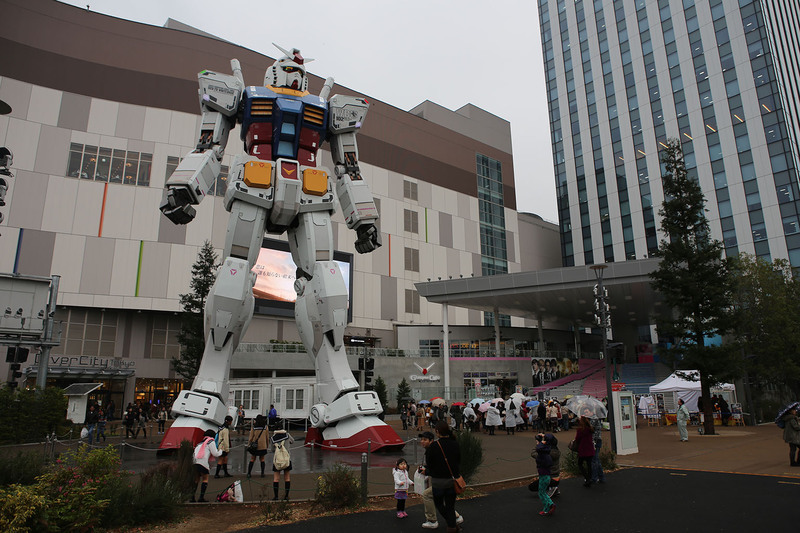 Japan Day 4 – Odiaba, a giant Gundam, and the Statue of Liberty? Odiaba island is a large, artificial island in Tokyo bay. Starting as a military defensive base in the 1800’s, it grew dramatically as a port hub in the 1900’s. 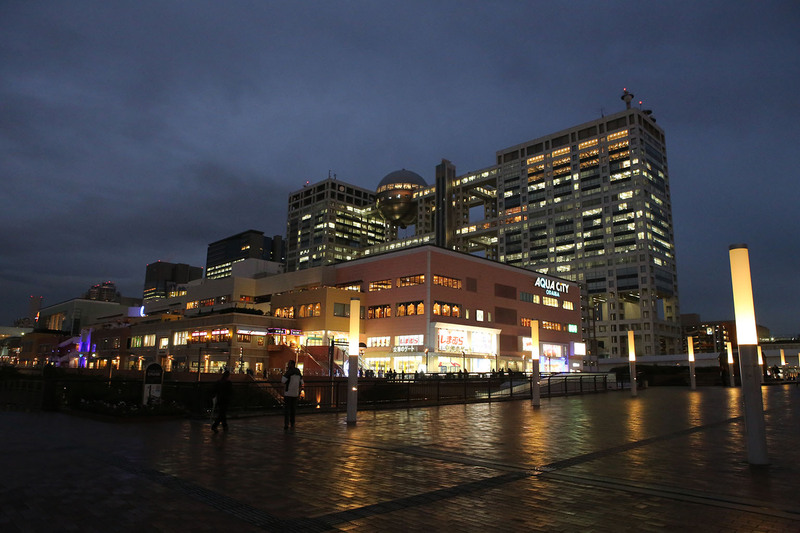 In the 90’s it got targeted during the the Japanese real estate boom as a commercial and ‘future showcase’ development area. The mayor of Tokyo began a major development plan for the island called Tokyo Teleport Town and was designed to showcase futuristic living. It had residential and commercial development for about 100,000 people. 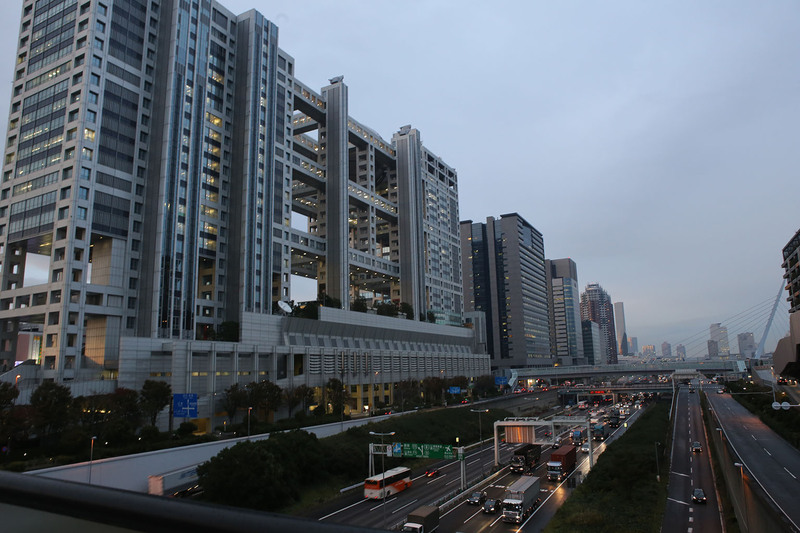 However, the mayor’s successor halted the plan in 1995 as the Japanese asset bubble popped after a great number of the lots were still vacant and the area underpopulated. 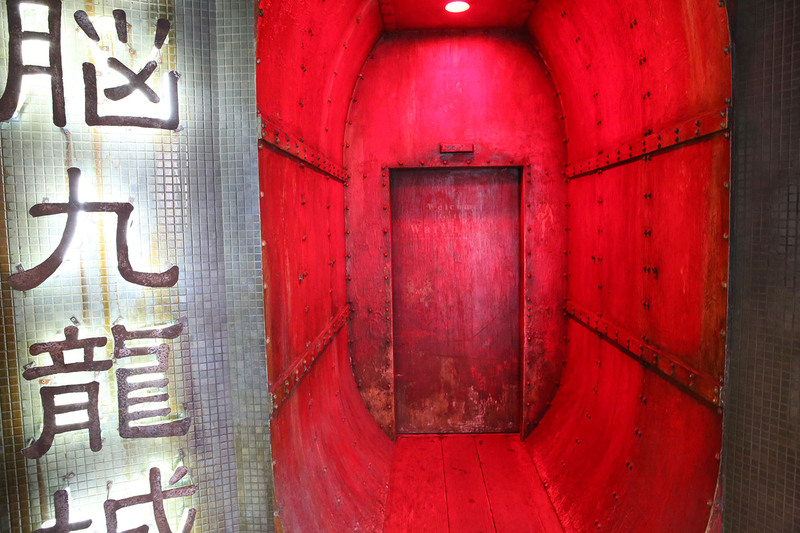 Unfortunately, over 1 trillion yen (~$10 billion USD) had been poured into it by that point. 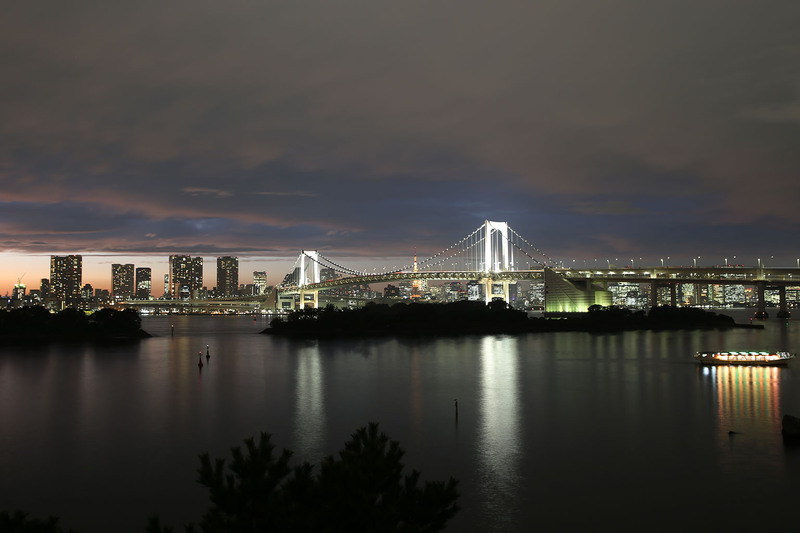 Many of the special companies that developed the island quickly went bankrupt as Japan went through their ‘lost decade‘ during the late 90’s as the overvalued asset bubble unwound. Since then, it’s languished – and it shows. 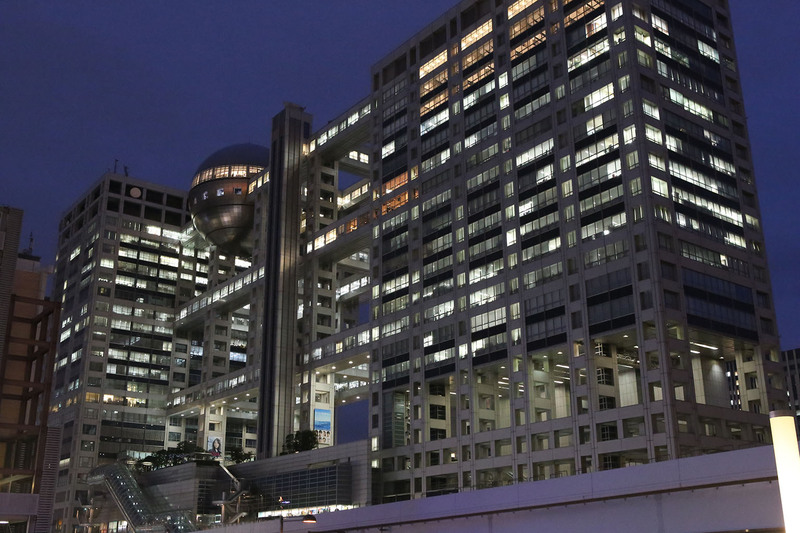 It has absolutely enormous buildings in a large-scale city-planning style. Capturing the scale of this complex is very difficult due to the huge buildings and the gigantic open spaces between them. 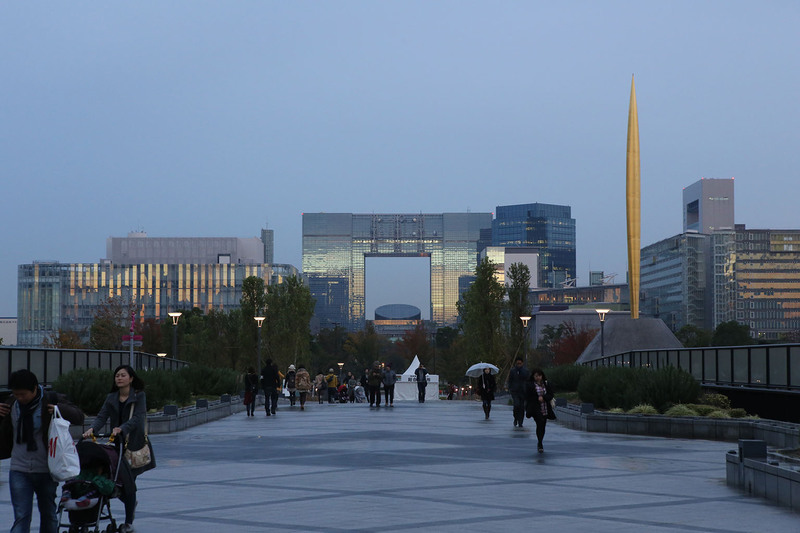 The whole place feels like a bit like those images of Chinese ghost cities but with odd futuristic buildings that look nearly empty and few people walking around. It was actually kinda creepy. I could easily have spent a day walking around the humongous city/island. The buildings were nearly miles apart. But I was looking for Diver City. 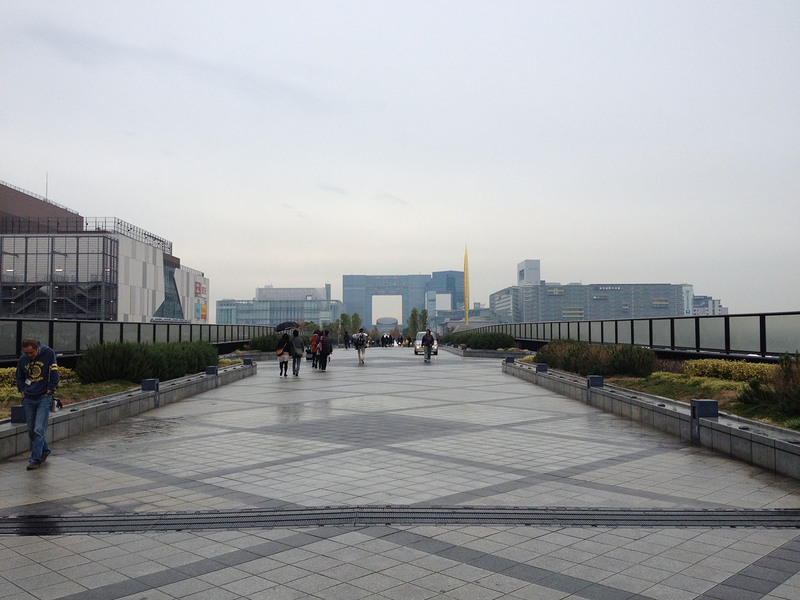 Diver City is a large and very nice modern mall. I found it just a short walk off the rail line. It’s about 5 floors of shops – and reminded me very much of any modern mall you’d see in the US. Almost all the same stores were there too: Old Navy, H&M, Diesel, American Eagle, etc. The food court also had a lot of mall-style chains like McDonalds, Starbucks along with lots of local chains I didn’t recognize. They had some higher-end shops and gourmet chocolate stores as well. So, overall, on the flashier end of mall stylings. But this wasn’t what I was looking for. I was quickly trying to find a certain recent addition before the afternoon show. 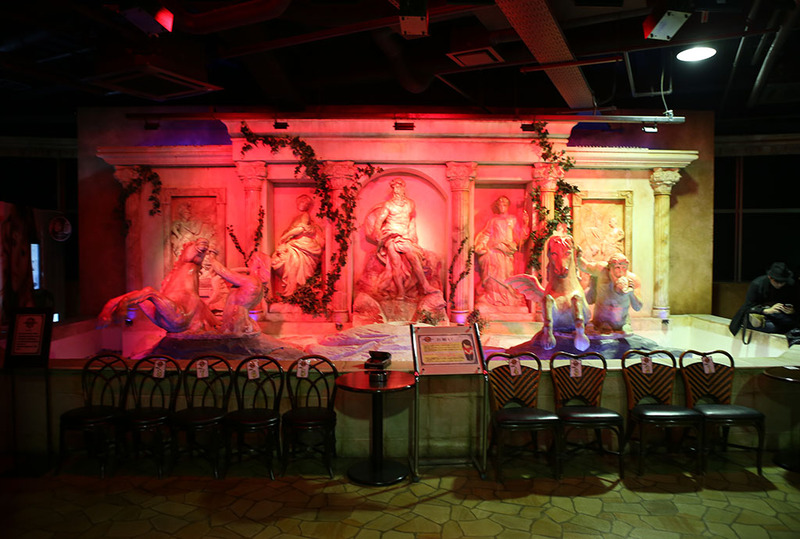 The night-time shows have lights and video accompanying them. I had a few minutes before the afternoon show, so I looked around the foot of the giant statue. The detail was just fantastic. Usually, with things this big, the closer you look the shoddier it is up close. You look in between the joints and see hollow forms. The section edges/connectors are actually just paint on a solid plastic form/etc. 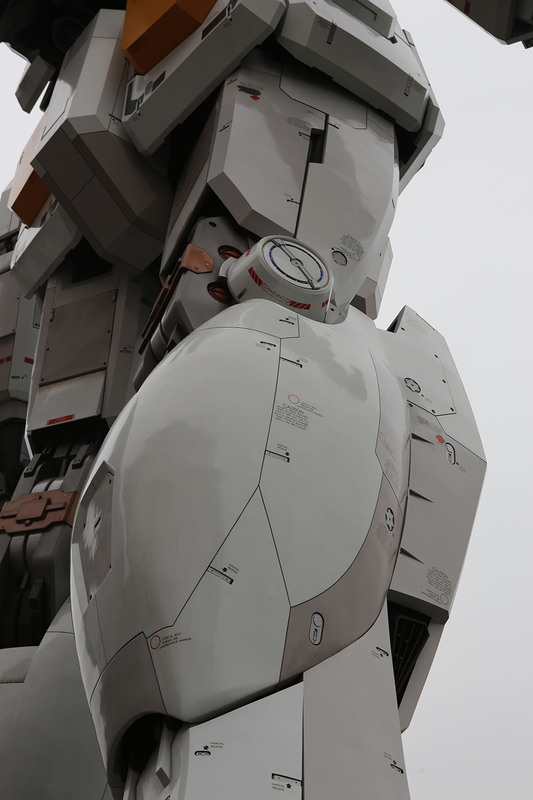 Not with this thing – it was fantastically detailed even inside the less-visible areas. Some serious love and care went into this statue. Amazing amounts of detail were everywhere on it. 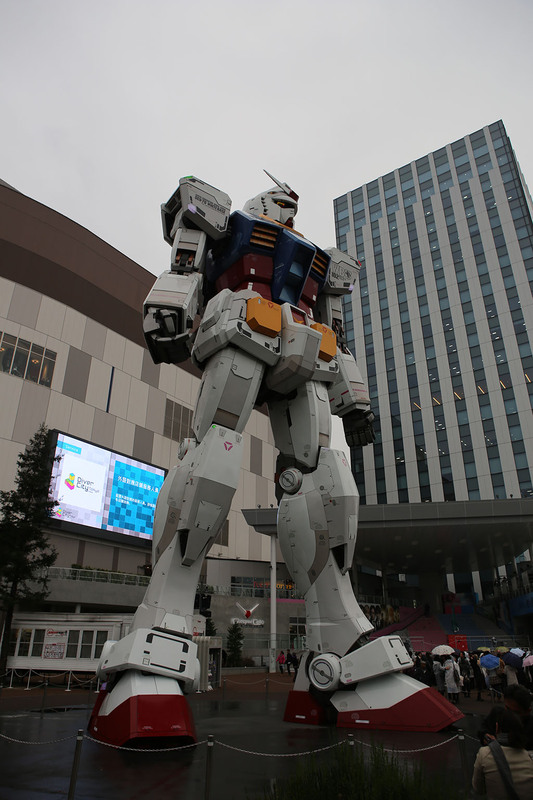 It was kind of interesting, because just to the right of the Gundam, was a small stage with HORDES of teen girls waiting in the sprinkling rain. 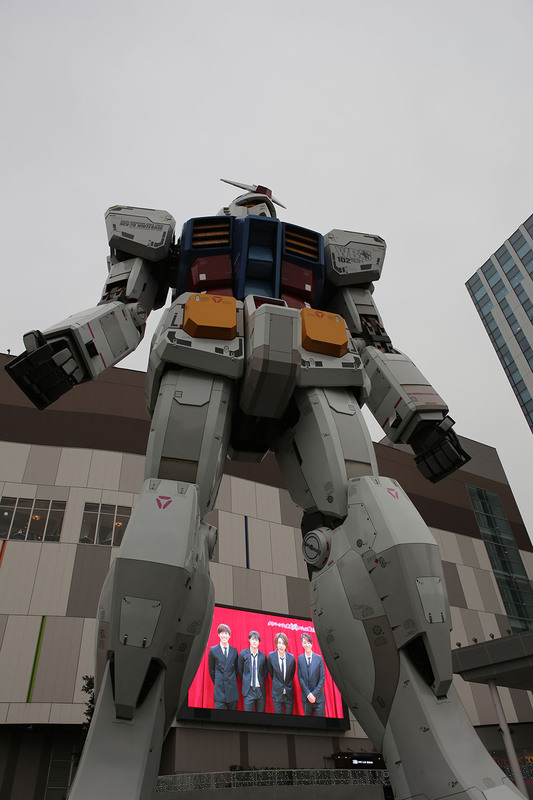 I couldn’t quite figure out what was going on until the Gundam show finished. All of a sudden, the girls start yelling as a 4-teen boy band popped out of their tent and started singing on the makeshift stage. 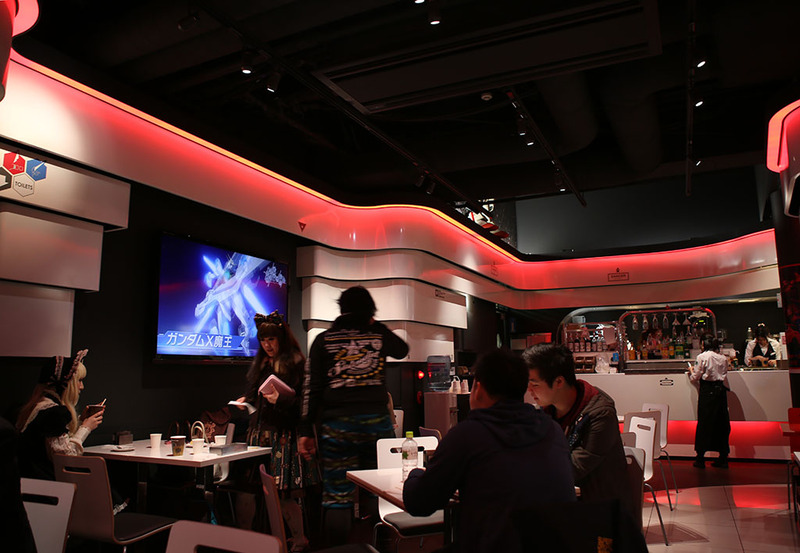 It was kinda surreal to watch all these young ladies singing along with this 4-guy boy band next to a giant Gundam. 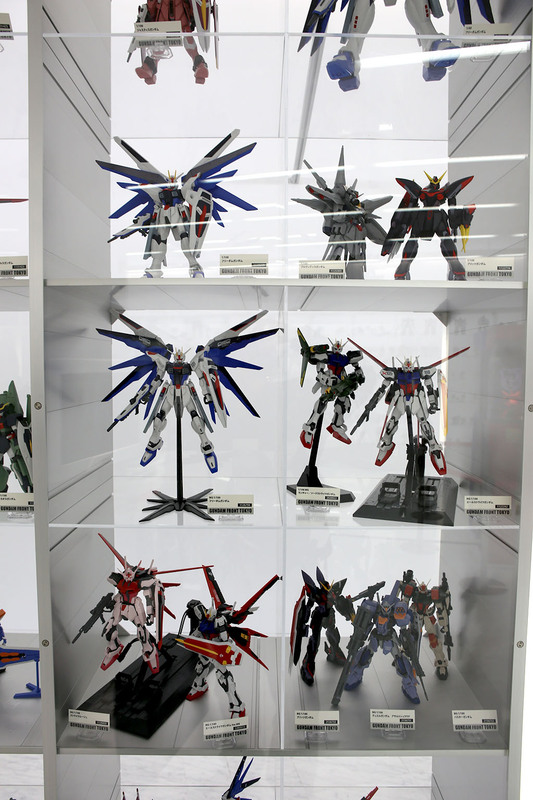 I went over to the Gundam’s temporary shelter area where they had a store selling a lot of their current Gundam line toys. 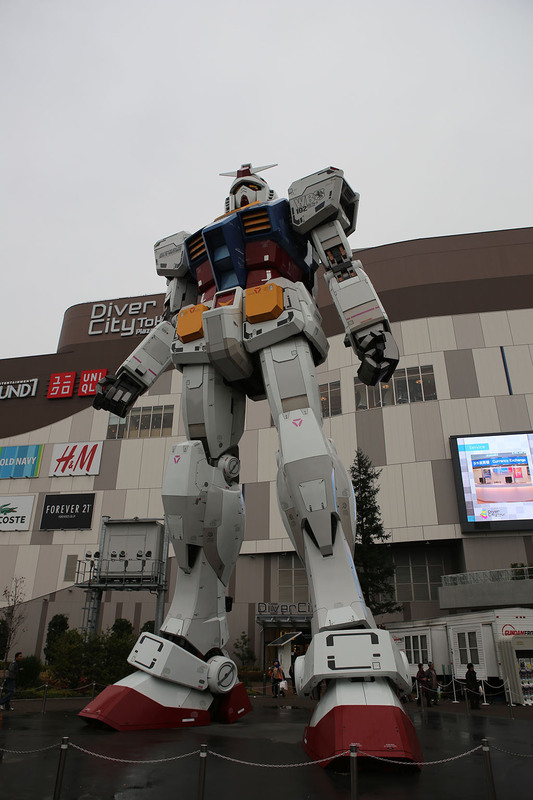 But that’s not all that’s Gundam at Diver City. 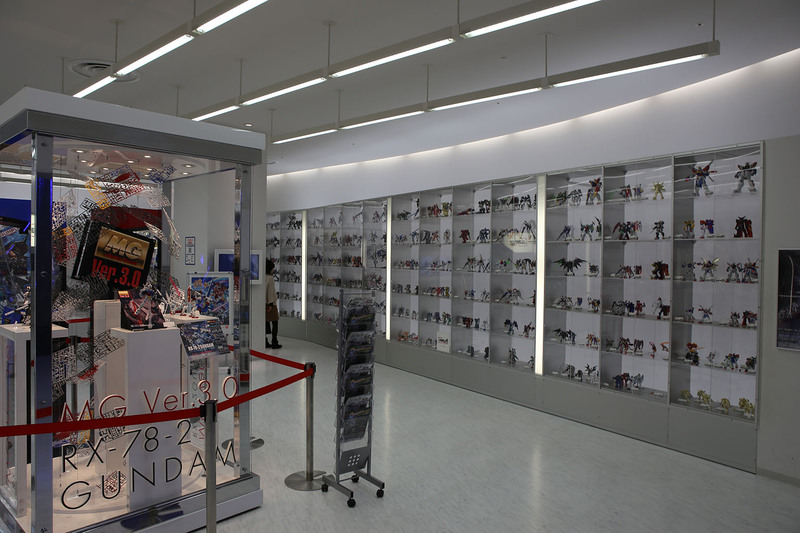 They have a whole museum area inside the mall on the top floor/north end called Gundam Front. 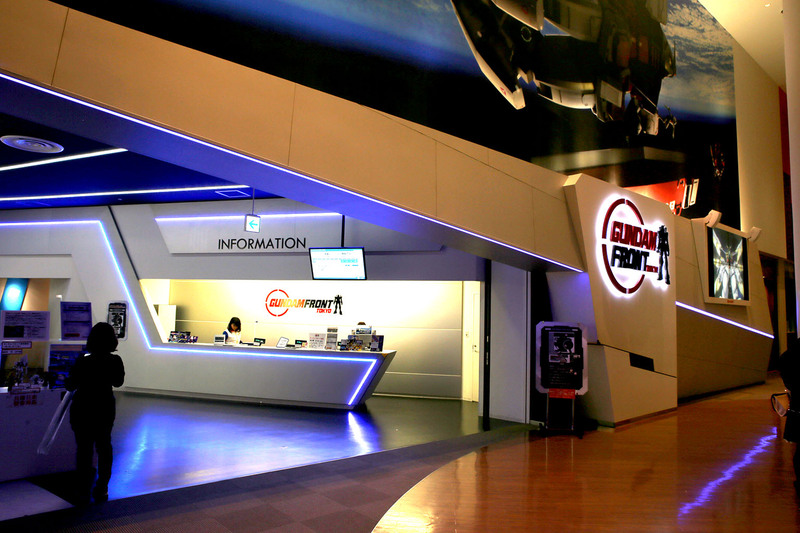 Gundam Front is a store/showcase/museum for the Gundam series. 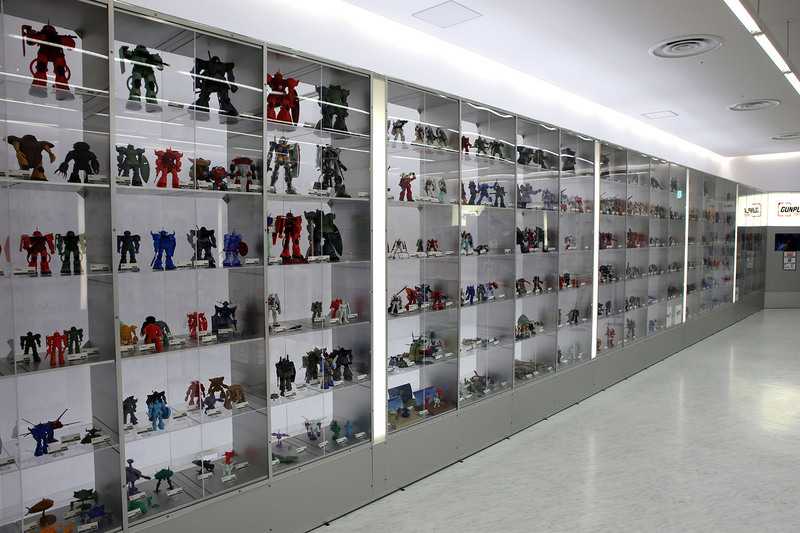 On your left as you enter is a museum are with just about all the Gundam toys ever made. 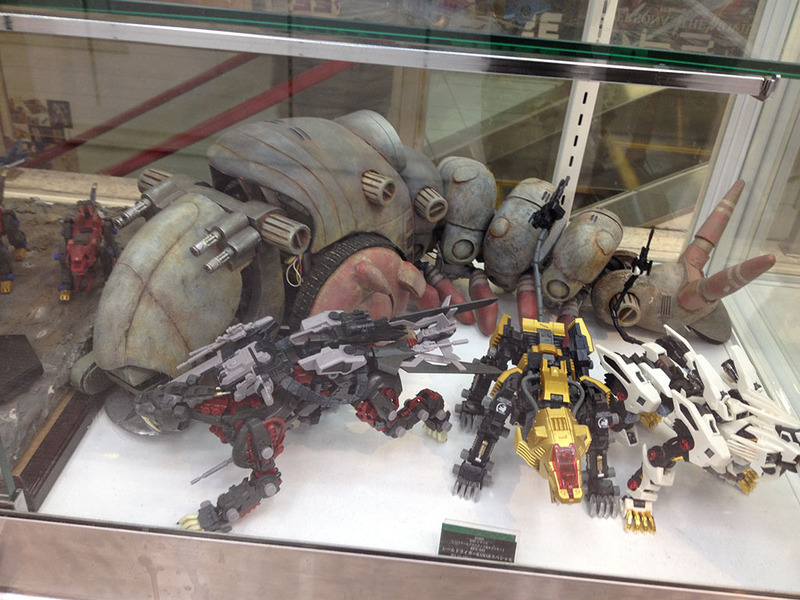 Two giant rows with special display cases in the middle. 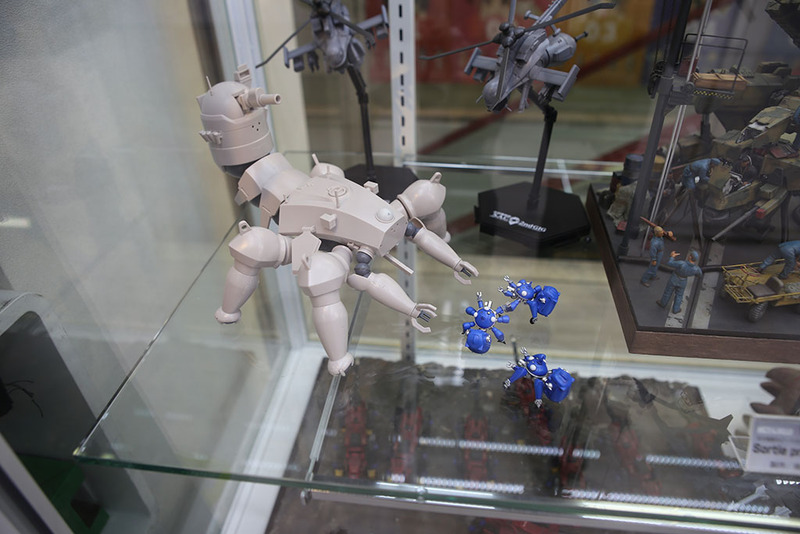 You can see how they’ve evolved from very simple beginning to massive and complex models as time went on. They went through a lot of different style changes too. But it was pretty amazing to say the least. One could easily geek out of the whole line. But it wasn’t all just toys. They had a shop with clothing too. I found the prices to be pretty amazingly high, but probably not an issue for true fans. 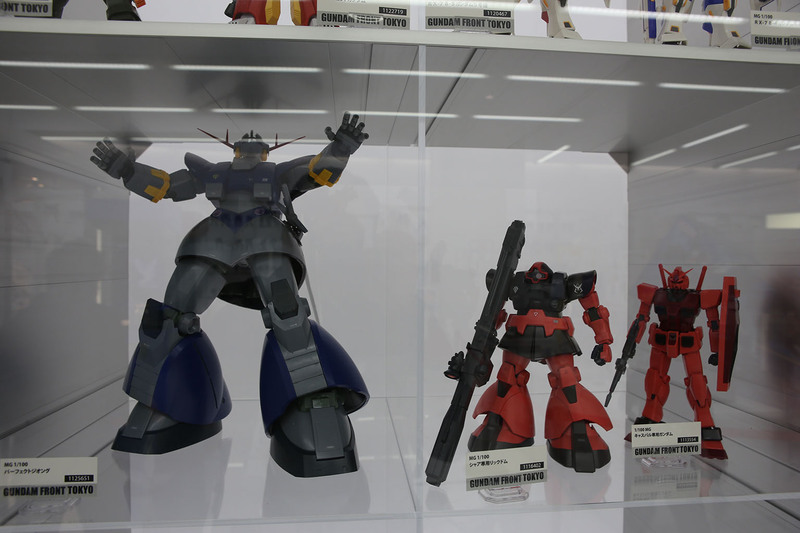 There was also a whole pay area to Gundam Front with life and scale-model sized Gundam suits along with many of their more famous enemies as well. 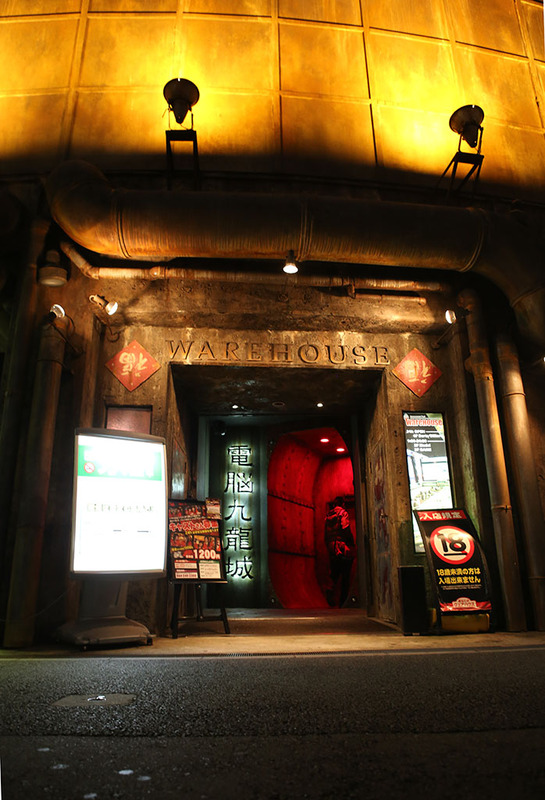 I decide not to pay the money to go in – and I believe they had assigned time slots as well. 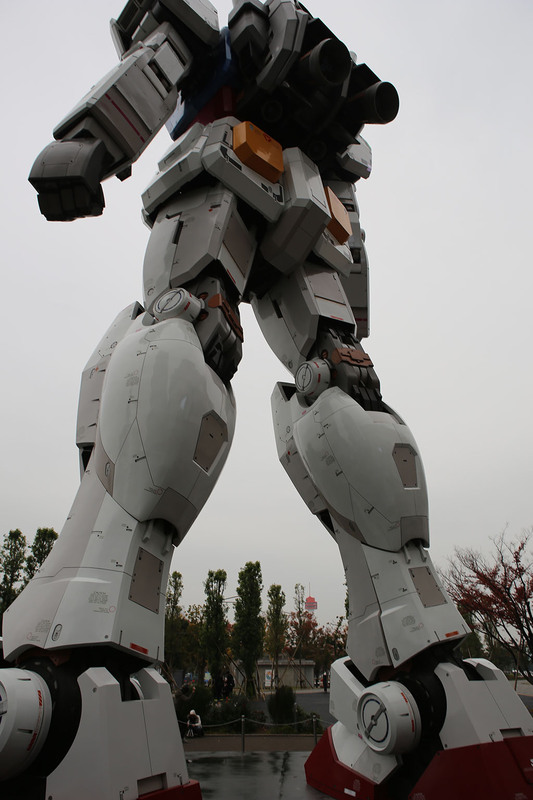 I enjoy a good robot as much as the next guy – but I don’t think I was ‘hard Otaku’ enough to warrant it. 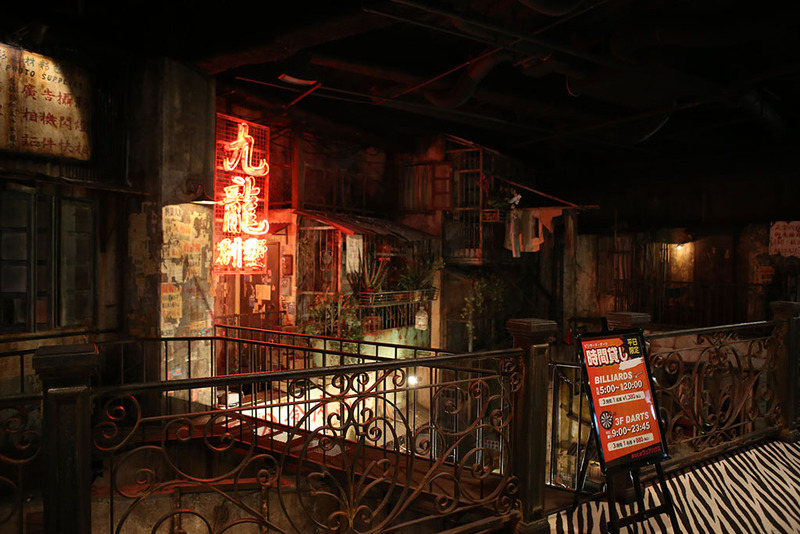 I grabbed a bite to eat at the food court and walked around the high-end shops of the mall a bit to get a feel for things. I especially enjoyed the gourmet chocolate shops that had all kinds of interesting brands and styles. Strange styles of Pokey and candies I’ve never heard of before. But, nothing too noteworthy as this mall was much like other malls, so I called it a day. As I left, however, I was treated to one last gift from Tokyo. Sunset. Being fall, sunset comes early. The buildings on the way over to the train station already had their lights start coming on. This particular building was intriguing, it reminded me of some kind of cross between a Sierpinski carpet (in this case a Sierpinski cube). As I rounded the building, I was greeted by a few sights simultaneously. First off – the Statue of Liberty!?! 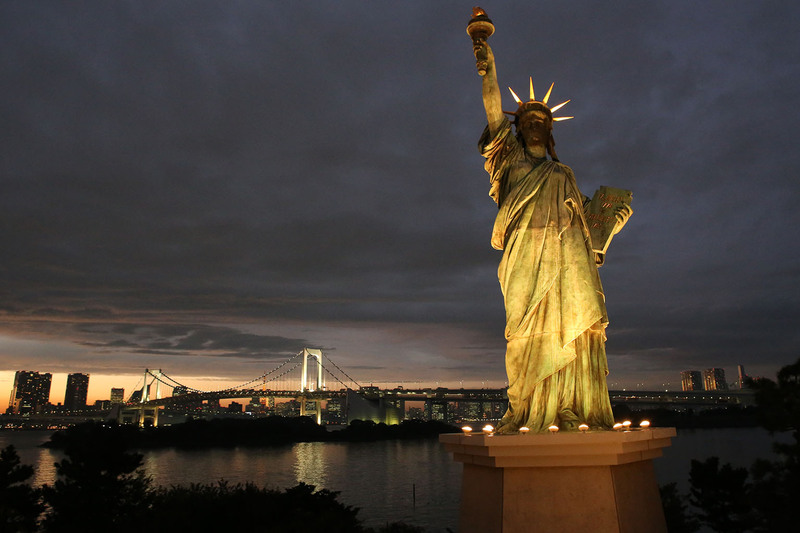 I had no idea there were so many Statues of Liberty around the world – let alone one in Japan. This version was only about 30-40 feet tall, but there it was. There was also a small area set up with a large Christmas wreath to stand in for folks to get their picture in front of the statue. While taking this shot, a group of orange robed Buddist monks came up and started snapping shots too. Kind of surreal to have the Statue of Liberty against the Tokyo skyline, a couple of Buddists monks in their orange regalia with cameras, English Christmas music playing with local tourists getting shots standing in a giant Christmas wreath. My, what globalization has wrought. 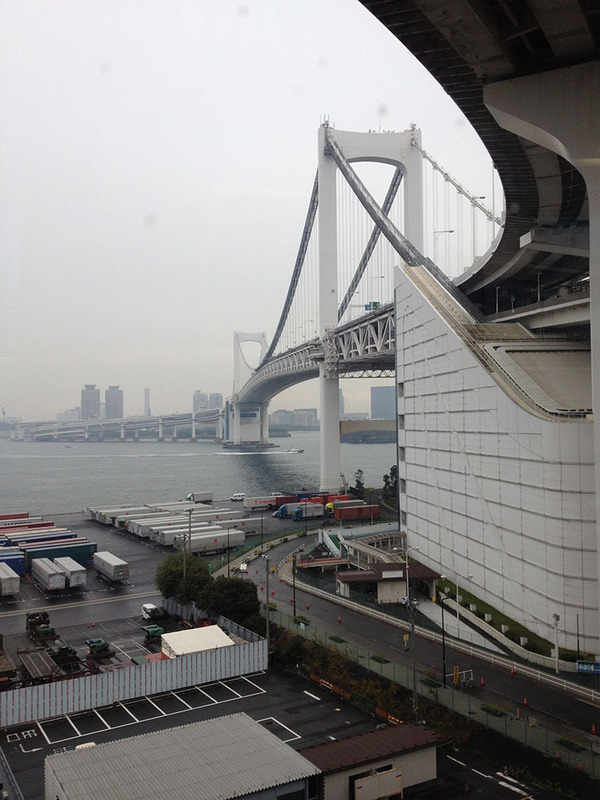 Next amazing sight, the Rainbow bridge across Tokyo bay. This night it was lit up white, but has been rainbow colored in other times. 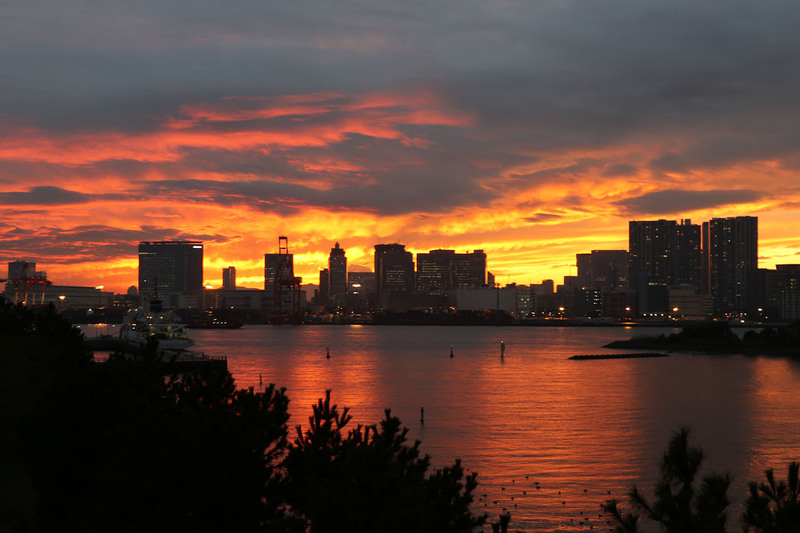 However, it was very beautiful. Finally, the sunset itself. Wow – firey! Amazing colors as the setting sun found its way over the horizon. I sat and enjoyed the setting, shifting colors. So much so that I decided to take a nice wide panorama. It came out beautifully. As I just sat and watched, I realized that I hadn’t stopped running and seeing things since I got there. I think when we travel that we often get too wrapped up in the process of traveling itself, seeing things, doing things, being on a schedule. We often don’t make space in our schedules, nor place ourselves in the right places, to enjoy moments like this. To smell the ocean breeze blowing across a bay. Watch the sunset go down. To see the changing colors of the sky. Watch the lights slowly coming on in the buildings as the city moves into evening. Life is a beautiful thing – and all too fleeting to spend it wrapped up in constant doing. It’s in the quiet moments that you actual realize what life is about and see just how amazing and precious are the things you’ve been holding in your hands all along. I awaken in the morning still feeling the light effects of the Fugu. I decide to rest in a bit since it’s been a couple of big days. I watch some TV shows that I brought over on my laptop and also get my Netflix working by using the awesome Firefox plugin called MediaHint. It’s nice to be able to have a taste of home after a few days in a completely different country. I’ll admit one thing I watched was Adventure Time. 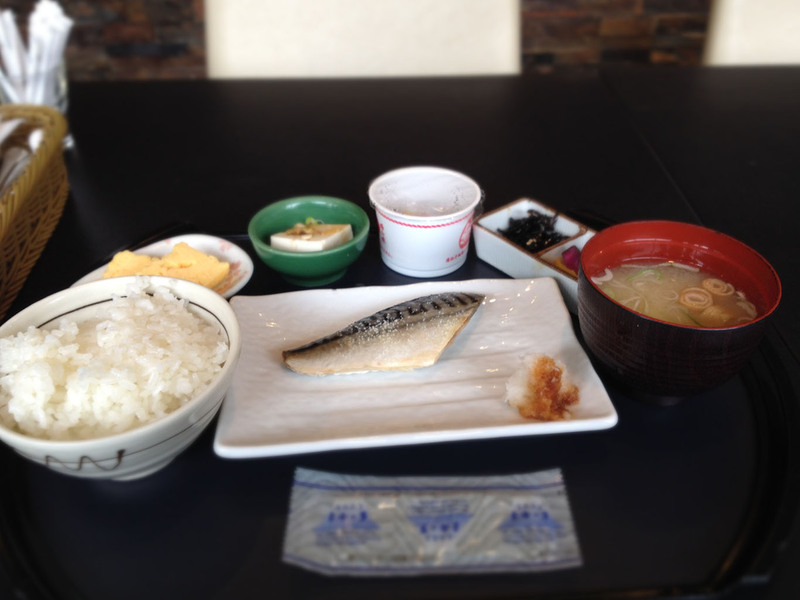 Still a bit disconcerted from the odd fugu feelings, I head down for breakfast at the hotel restaurant. I get the traditional Japanese breakfast, and am then off to get my first big errand done – a shipping box and packing materials. They’re some kind of news/interview folks from some show called ‘Zip!’ TV. My guess was it was kind of like the local cable-access channel. They asked me if they could interview me about my purchase at Tokyu Hands. After tentative agreement, signing a waver, and getting a tip or two from their translator – the camera guy switched on. They asked me a lot of questions about my box. What I bought it for, what I was going to send home. They had a young 20’s-ish kid from Vancouver, BC doing their translation and he admitted he kind of fell into the gig of translator for them. Anyway, it was kind of awkward to admit that most of what I was sending home was Otaku stuff: some models, a few action figures, a DVD or two, and a nice tea set and some pottery. Yes, pottery and tea set – that’s what I was sending home – and didn’t mention the otaku stuff. My goodness, I guess I now know what it’s like to be Bill Murray in Lost in Translation! But onwards, I had a meeting to get to! 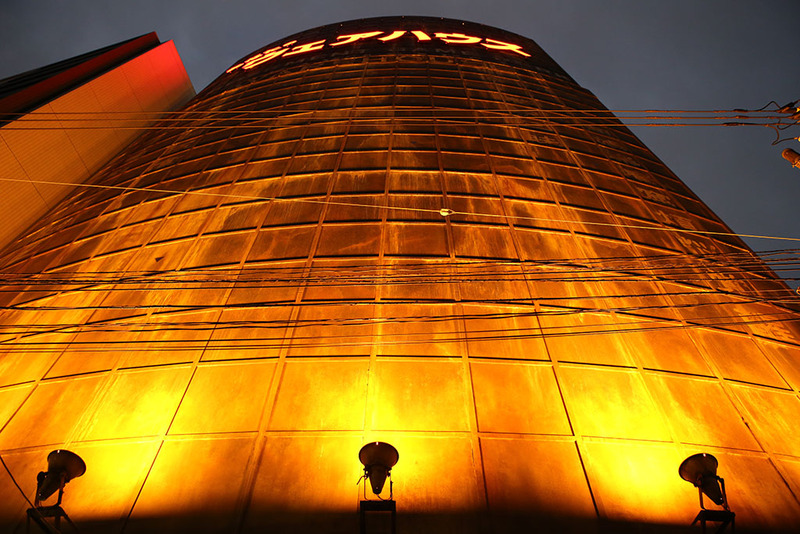 At about 11 o’clock, I run over to the Shibuya Hikarie building to meet up with some friends-of-a-friend. What a fabulous building. 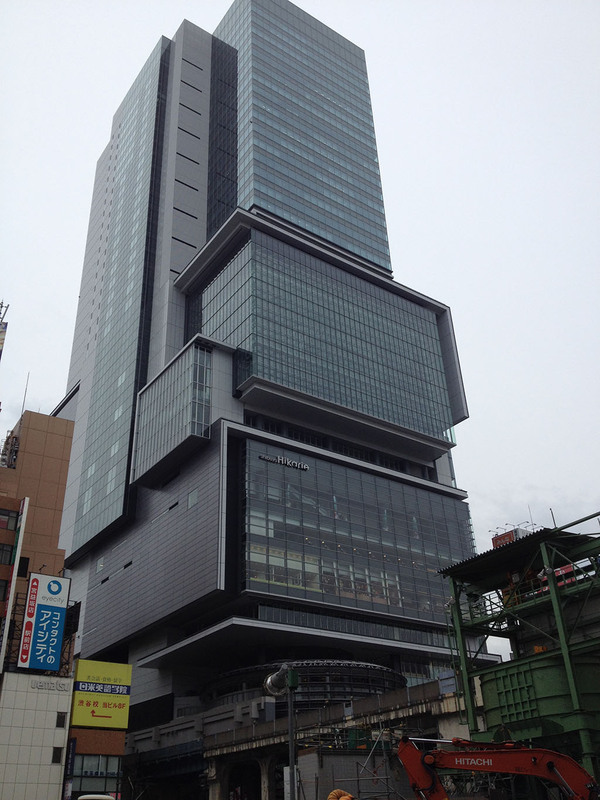 It sits right behind the Shibuya station and is connected to it. 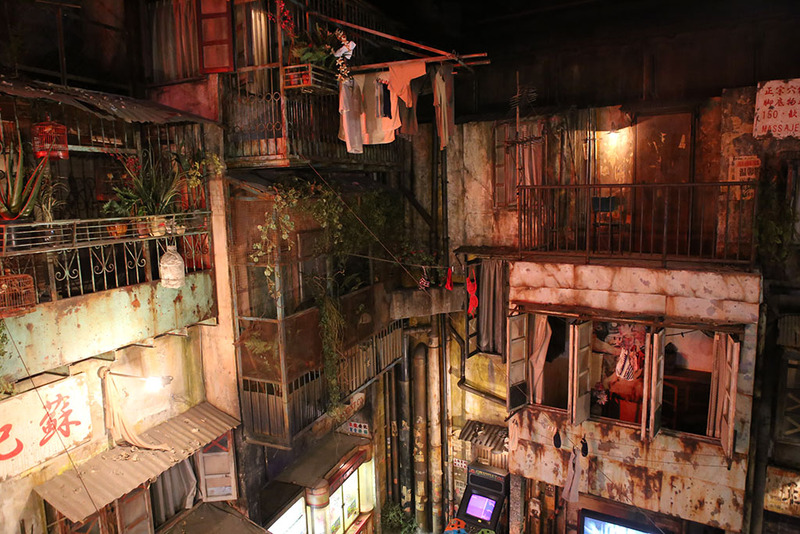 But the connection was described as “Hikarie is part of Shibuya station the way a tree is part of your house when it falls on it.” Love it. Before we went to lunch, however, one of the guys I was about to meet was super-helpful and we ran over to the post office. He helped me get my box of otaku wares shipped – so thanks Howard! I still have yet to see it about a month later, but they did tell me that sending it via surface ship could take 2-3 months. No hurry thankfully. 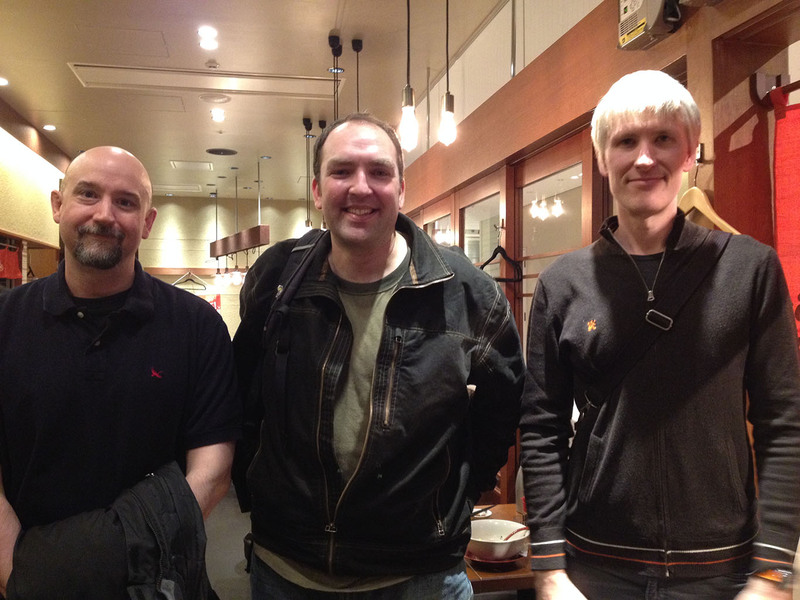 We had a great lunch and we chatted about much geekery. Great success. Thanks Tanya for setting us up. But after lunch, it was time to get to touring again! On my way back to the hotel, I take a little different route, and what do I find? A pet store! 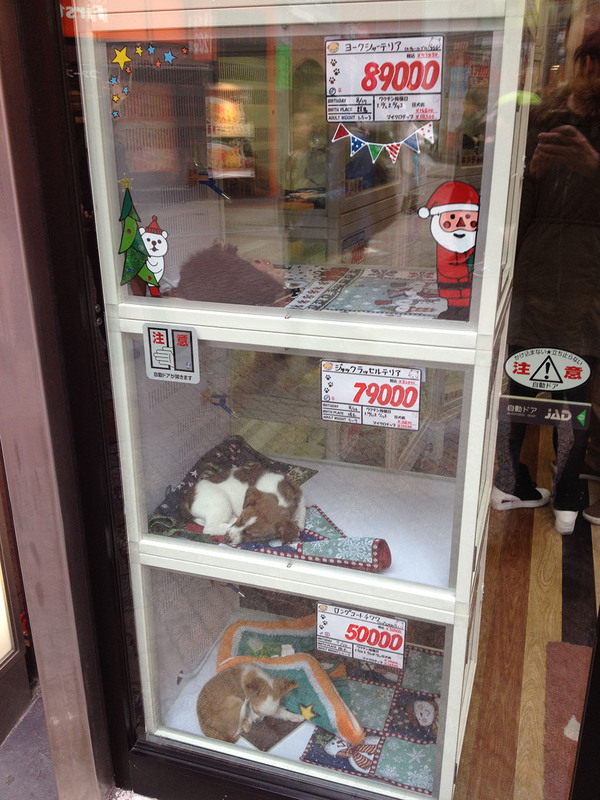 So, how much does a cat in Japan cost? 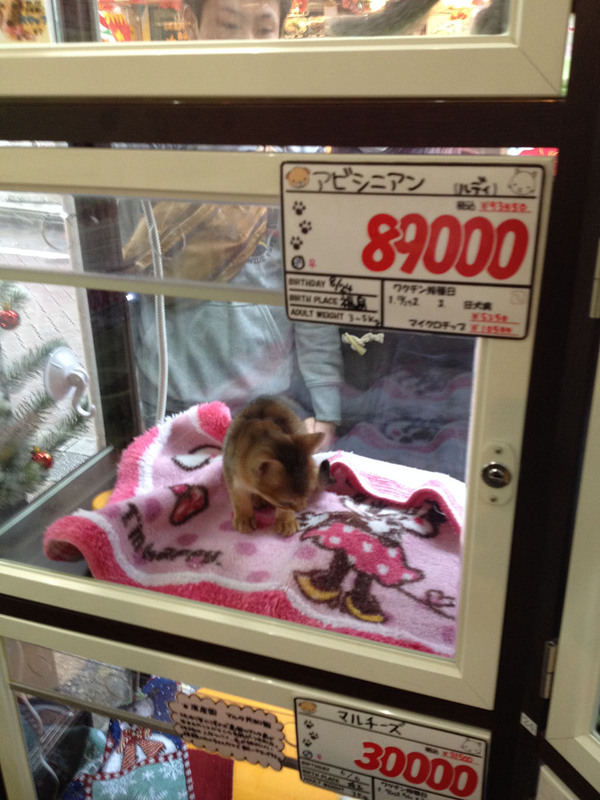 89,000 yen is roughly $900. How much is the little black and white doggie in the window? 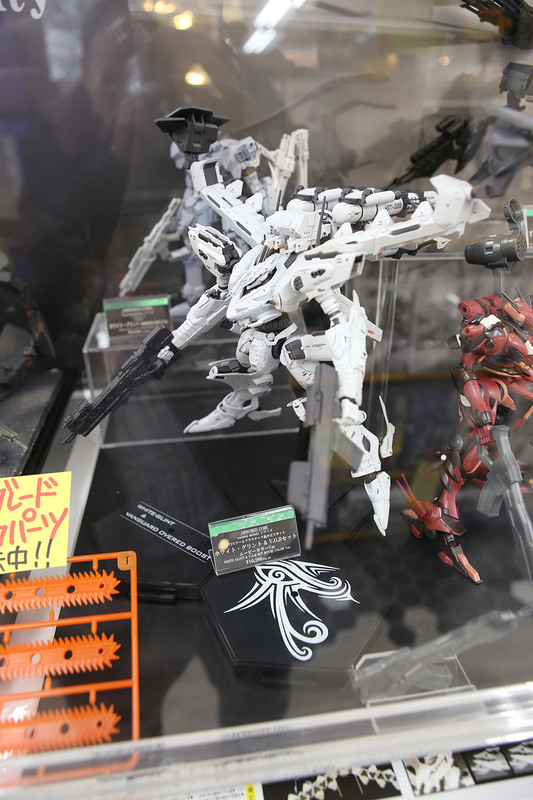 139,000 yen is about $1400. 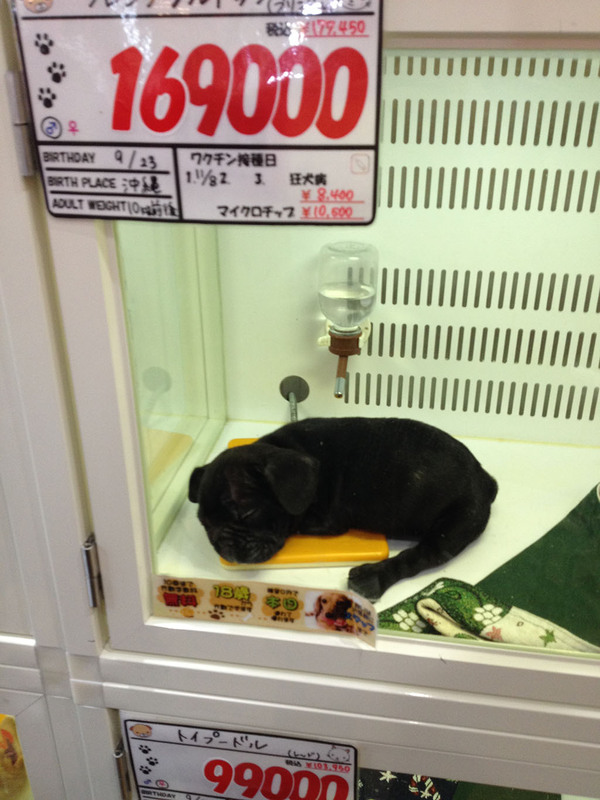 The little black pug was even more at almost $1700 USD. 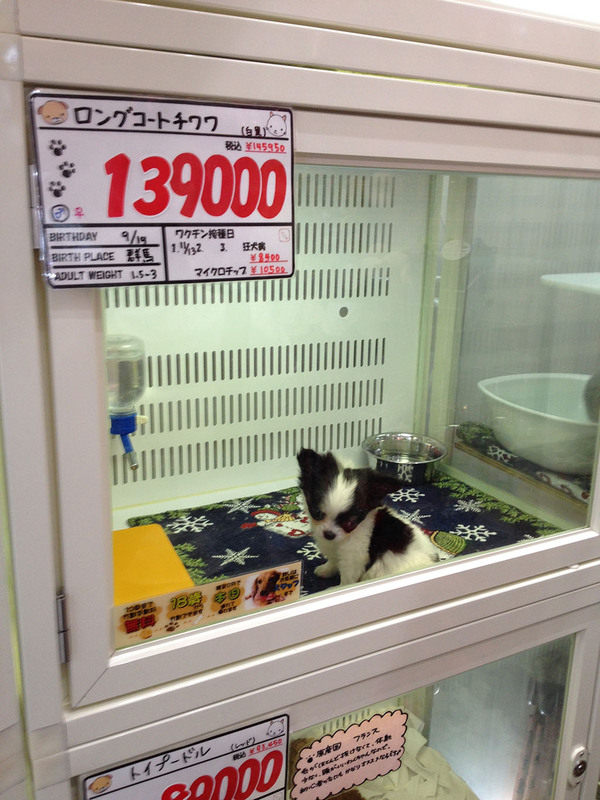 They were all adorable little animals – but it definitely showed that pets were a terribly expensive luxury item. If you see a person with a pet of any kind – they likely spent almost a $1000 on even an average looking animal. But onward. 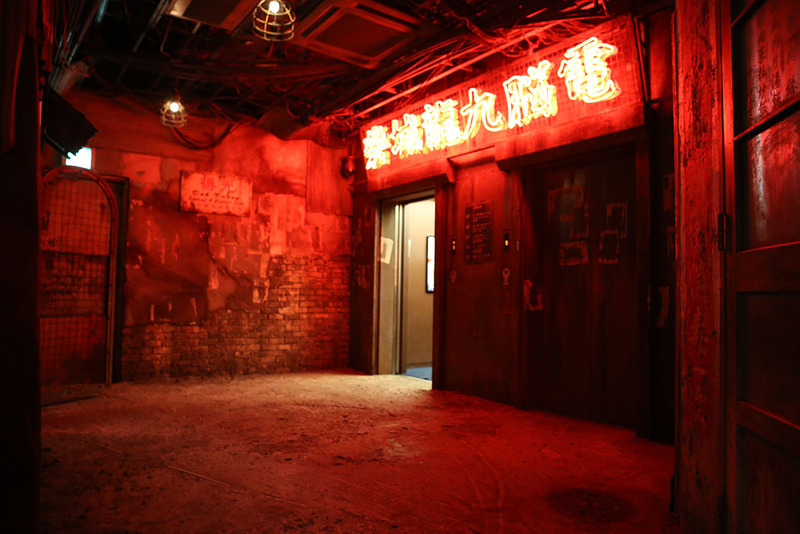 I was going to take a trip through the heart of downtown Tokyo, and visit something I was very keen to see. 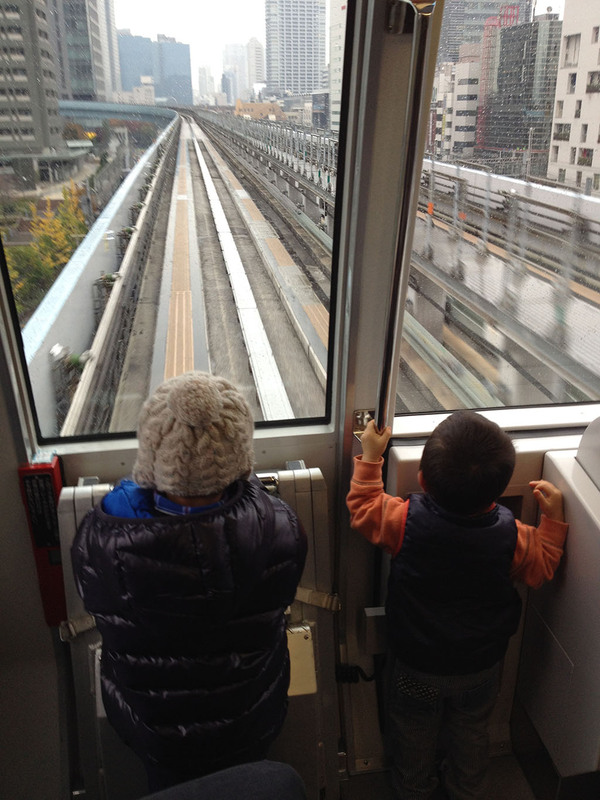 It involved, however, an interesting train ride out to Odaiba island in Tokyo bay. 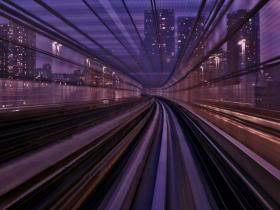 I take the subway all the way to the waterfront, and then switch to the Odiaba loop rail. 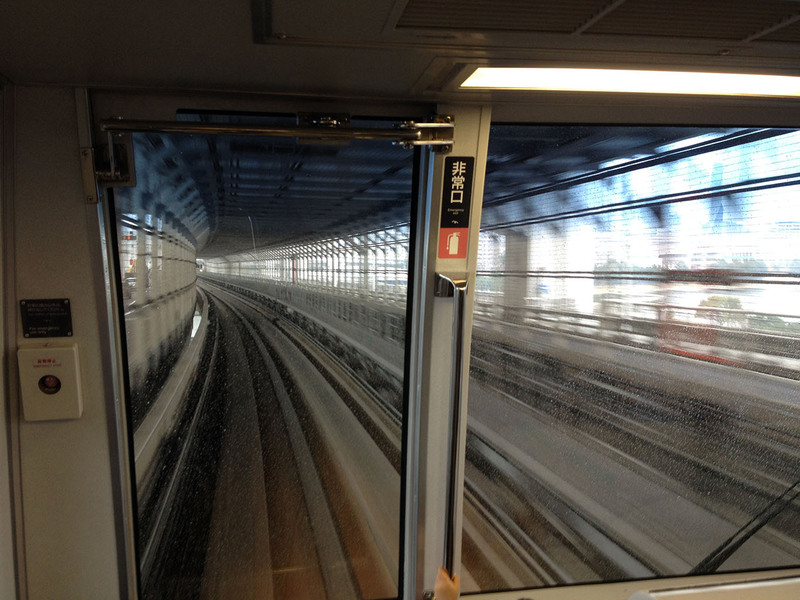 It’s much like airport trains you see in that it’s really a train with car wheels that runs on a monorail track. It goes over the Rainbow bridge to the island itself. Does this picture look familiar? For those using Windows 8 – it should. The left shot is the exact same train line as the one on the Windows 8 desktop. 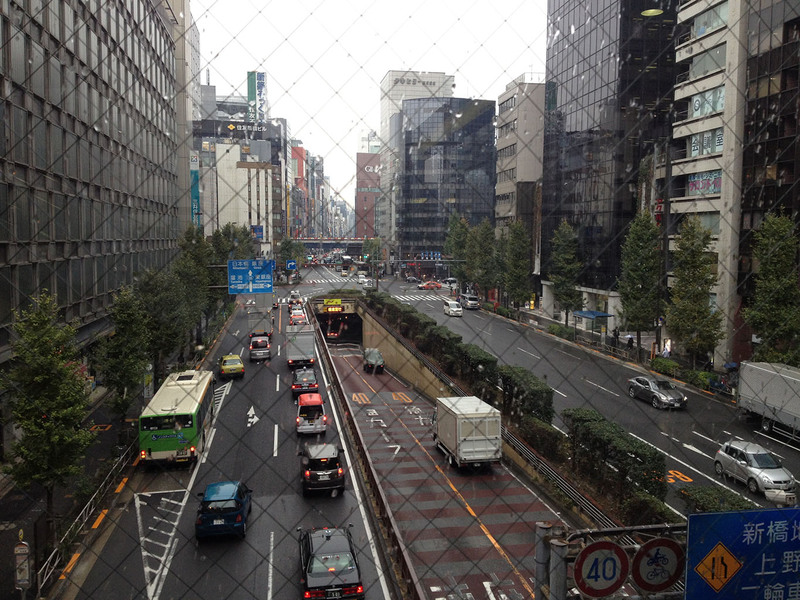 In fact, it is the same rail line, just taken in the opposite direction off the bridge heading back into Tokyo. I thought of setting up my tripod/camera, but the train was full and so I just hand-held it. Nifty. 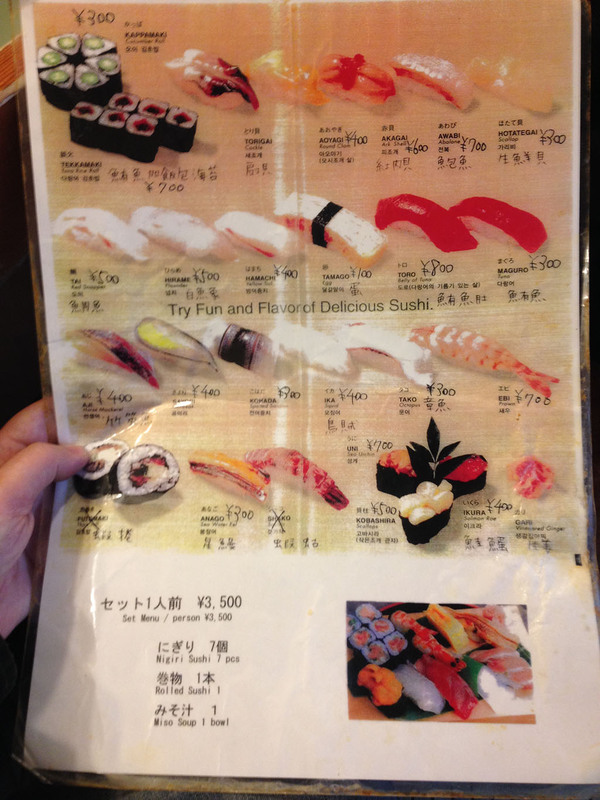 Japan Day 3 – Fugu me! I take the train from the arcade in Kawasaki back up to Shibuya for one last adventure of the day. I stop by my hotel and pick up all my medical information and insurance cards and put them in my wallet. Why? Because they might just save my life. But we’ll get to that in a minute. 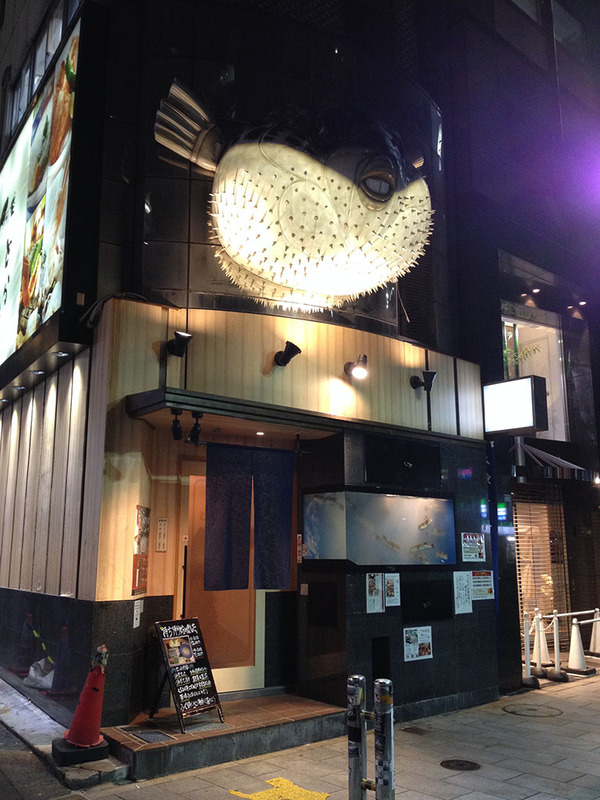 A local Tokyo friend of a friend recommended a chain called Toro Fugu for being very highly respected (and highly priced) place to eat fugu. When your life literally could be on the line, I figured it was best not to go for the cheapest route and go with an established location. 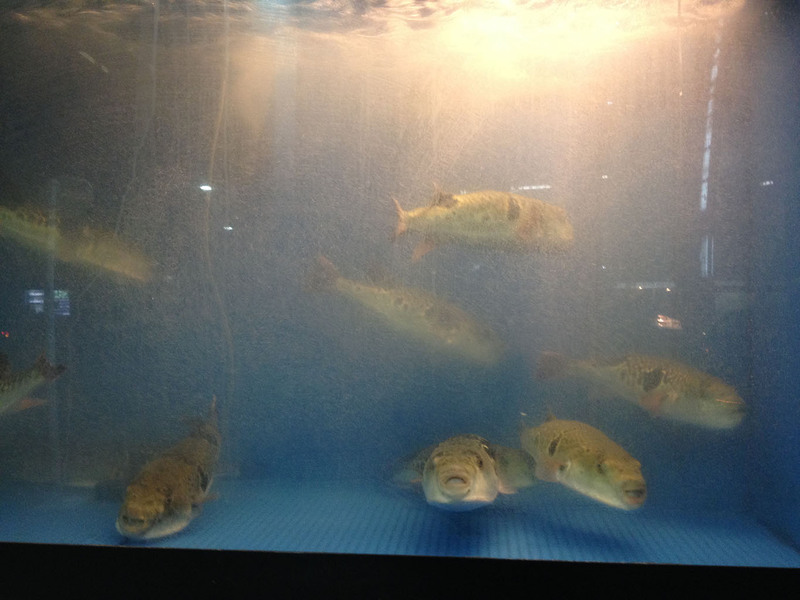 The fugu in this restaurant are prepared to order – and this is the tank of fish that greets you as you enter. Before we go on, a little bit about fugu. 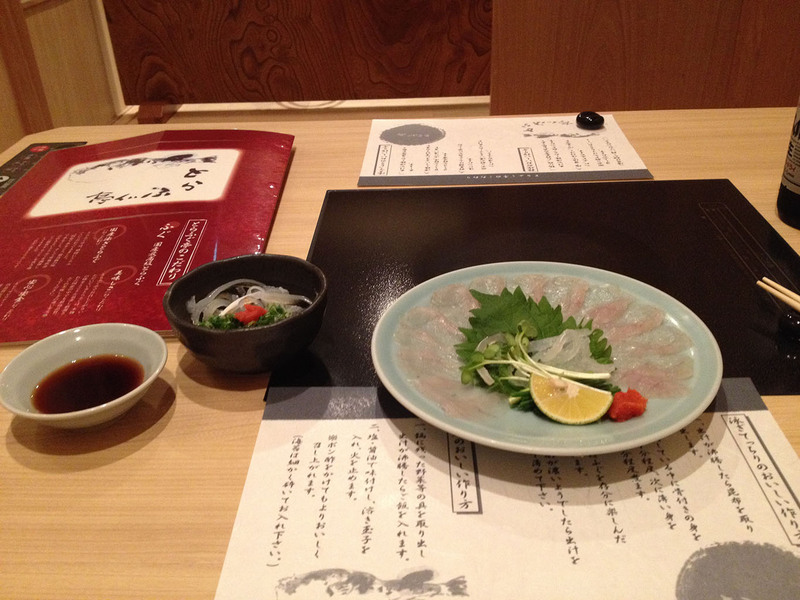 Fugu, or pufferfish, is one of the most celebrated and notorious dishes in Japanese cuisine. 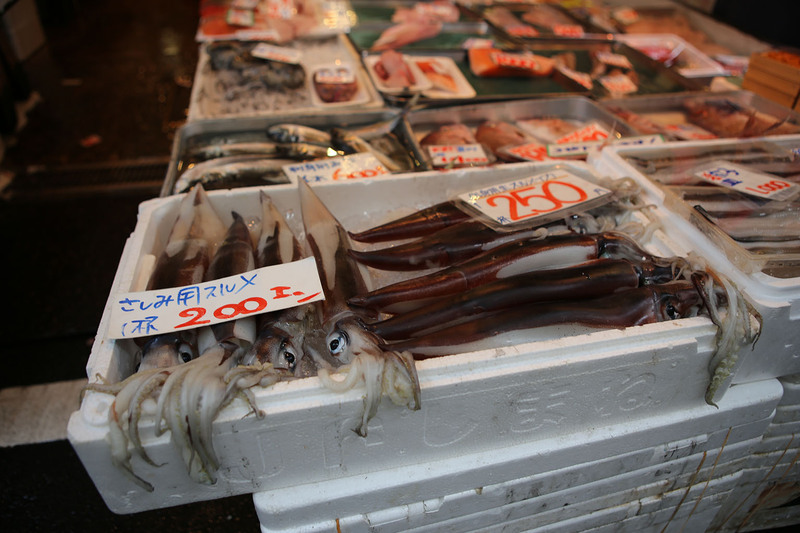 It is a dangerously poisonous fish that requires extremely careful preparation. Mistakes in preparation are often fatal. 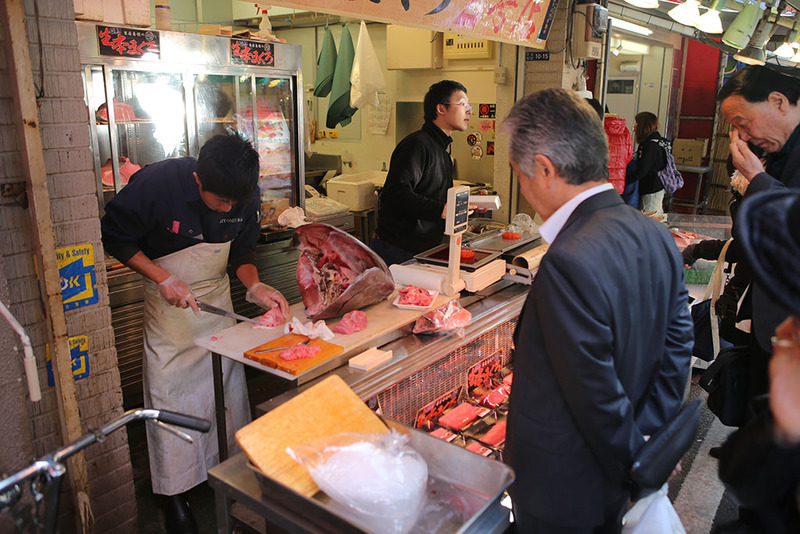 Its preparation is strictly controlled by law in Japan. Only chefs who have qualified through rigorous multi-year training programs are allowed to deal with the fish for public consumption. Apparently only about 30% of chefs pass the first time they take the certification test. For reference, only 17 restaurants in the United States are legally cleared by the FDA to serve fugu and it was illegal up until only a few years ago. 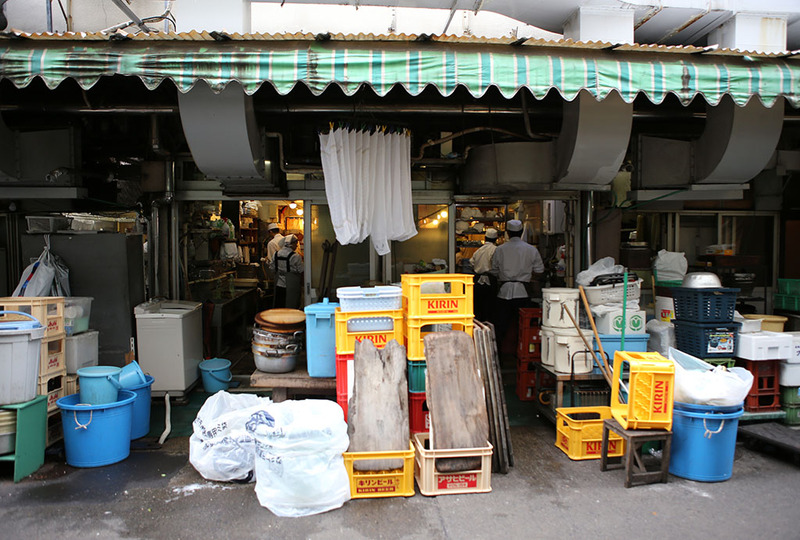 Even with that, all domestic US restaurants have the fish properly cleaned and prepared in Japan before being flown over. So how many people do get poisoned? In Japan from 1996 to 2006, between 34 and 64 victims a year end up hospitalized from fugu poisoning and anywhere from 0 to 6 persons die each year. The majority of these poisonings, however, involved fishermen eating their own catch. 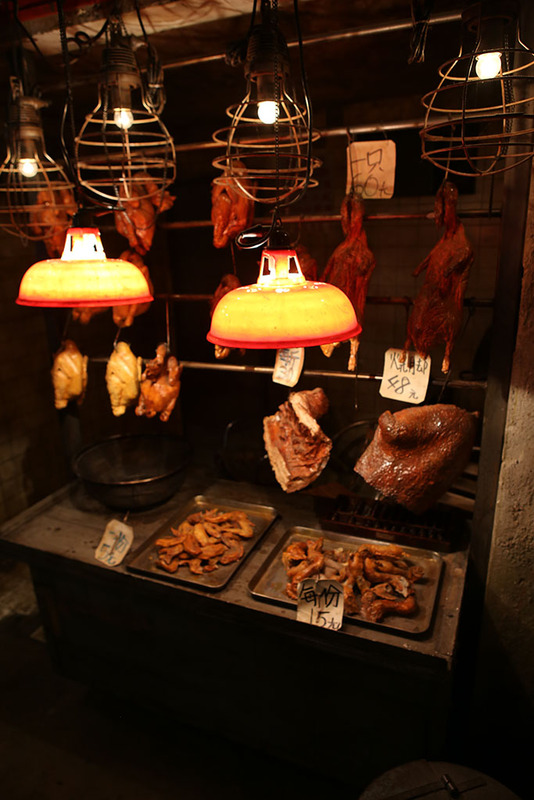 Many cases also involve folks who eat the internal organs such as the liver and ovaries, which are considered delicacies, but are also the most poisonous. Bandō Mitsugorō VIII, a famous kabuki actor, deliberately ordered four fugu livers to feel the rush and claimed to be immune. He died seven hours later. So, I’d say the danger is very real. What is the story with the poison? It’s called tetrodotoxin (TTX). Tetrodotoxin is a potent neurotoxin which shuts down electrical signals in the nerves. Lethal doses are usually 8μg / kg of body weight. So a 170lb person would be killed by the miniscule amount of 0.62 milligrams. This is 1200 times more deadly than cyanide. On average, a single fish has enough poison to kill 13 people. Further, the potency is not affected by cooking so it doesn’t matter how much you did or didn’t cook it. What are the symptoms? In light (or heavy doses), one usually immediately feels a bit of burning in the mouth or lips as soon as they eat it. This passes and they start feeling numbness in their extremities (fingers/toes/nose/etc) and a light airy feeling in their chest This is actually the feeling most people that eat fugu strive for. Many restaurants allow a miniscule amount of the toxin to remain on their portions so that diners get that feeling. One scientist, who had been bitten by a snake with neurotoxic venom, described it as the kind of peaceful light-headed feeling that people are supposed to get in the last few moments before they drown. 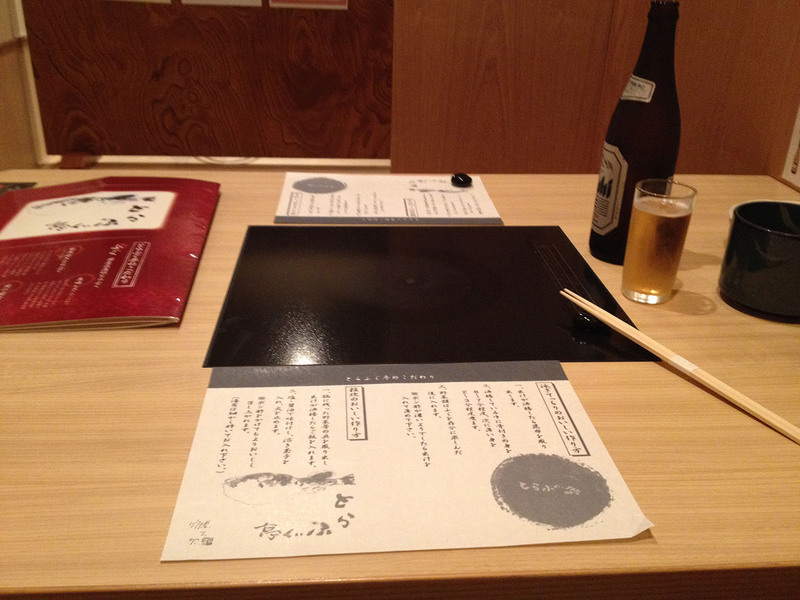 That, combined with a tingling body, is the experience many desire and expect from their fugu dining experience. More than that amount and…well… it becomes not pleasant quickly. There are many harrowing stories of folks who have been poisoned. The lightness progresses to dizziness, exhaustion, headache, and gradual loss of muscle control. More severe doses cause nausea and difficulty breathing as the poison works itself inward to core organs. Ultimately, loss of all muscle control results. This includes the respiratory system. Breathing then stops and asphyxiation follows – which is the ultimate cause of death from tetrodotoxin. Since the neurotoxin does not cross the brain-blood barrier, victims are fully conscious while their bodies shut down. 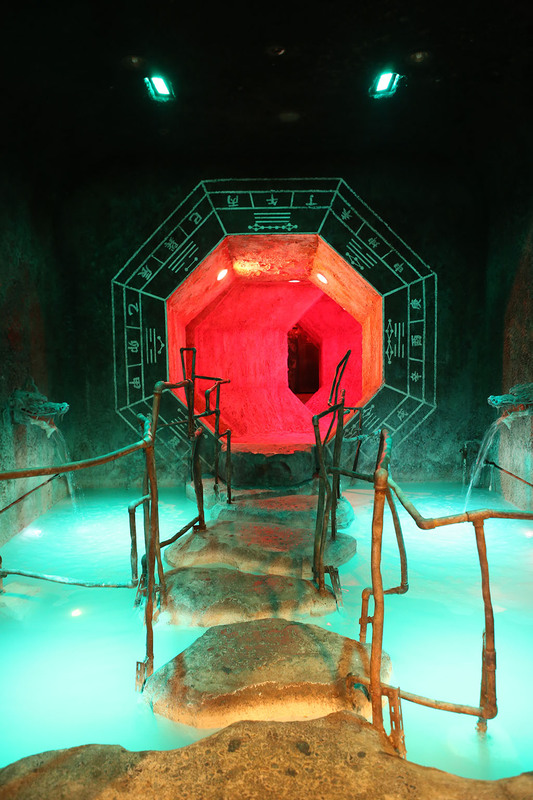 Some have described it as sinking feeling, or being ‘entombed’ in your own paralyzed body. Near fatal poisonings often put people in a coma, sometimes even a waking coma. The time from consumption to collapse can be anywhere from a 4 hours to only minutes. There is no known antidote and treatment consists of emptying the stomach, feeding them active charcoal to bind the toxin, and putting the victim on life support until the poison wears off while keeping their fingers crossed. It’s probably best I didn’t know all of this before I ate it. Shortly, my order arrives. The sashimi is sliced razor thin – as I had read. You could literally see through it. I say a little prayer, and take a bite of my first (and hopefully not last) piece. Fugu is a white fish, and as such, does not have a heavy fishy taste. In fact, it’s quite light. It almost has a smoked taste to it. Closest I could think of is a cross between yellowtail and cod. The texture, however, is unique. It’s somewhat rubbery like octopus; but lumpy – not smooth. The lumpier spots were rubbery and the bits between were soft and yellow-tail like. 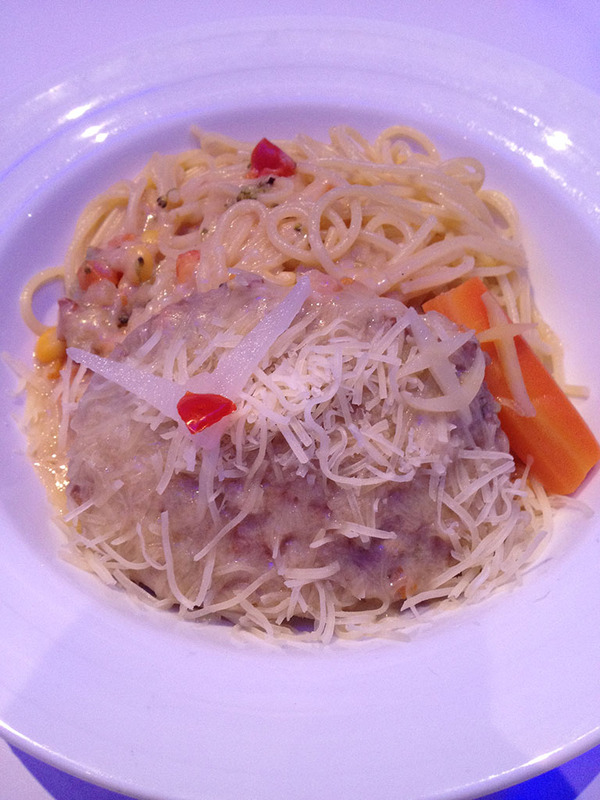 Overall, it was very good flavor – but not a knock your socks off experience (IMHO). The spine soup was also very good. The long, white strips are fugu skin and spines. This was mixed with radishes and other bitey-flavored strong vegetable cuttings in a light vinegar soup. 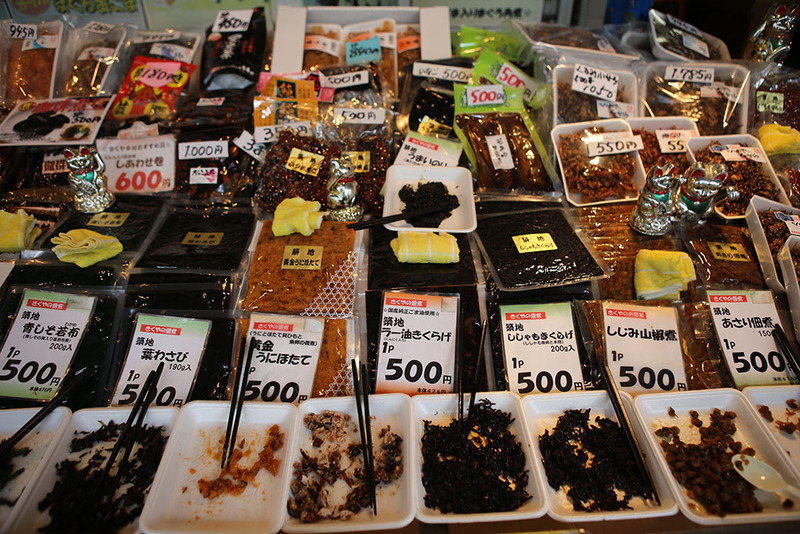 Again, the fugu bits were very mild flavored and a bit chewy. Mixed with the radishes and other strong vegetables – it made a great combination of flavors. 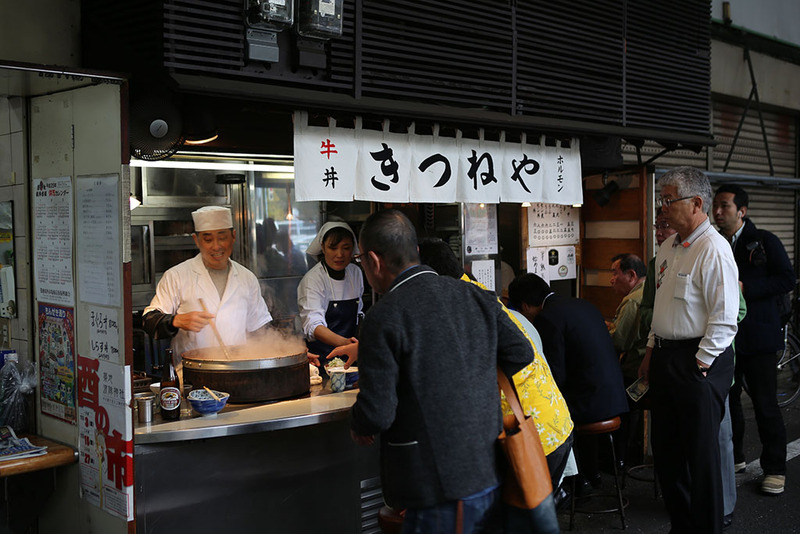 A final round came – the fried fugu. This turned out to be a bit much for me as the fish came STILL TWITCHING. The charcoal grill was great and cooking up the pieces was really awesome. I will however, say I did not finish my fried fugu. In truth, I was starting to feel a bit strange. While eating the bowl of spines, I did get a little burn on my lips. It was the same kind of burn that hot BBQ sauce would leave on your lips. This passed within a minute or two, but I did in fact notice my fingertips get a tingly sensation to them and my chest felt ‘airy’ and light. I found it to be a disconcerting feeling. I decided a plate of fugu sashimi and a bowl of spines and skin was enough tempting of fate and called it a night. On my way home, I did feel the ‘light/airy’ feeling that is associated with eating fugu. Personally, I wasn’t really digging it. You felt your body acting a bit strange. For me, I felt my fingertips be a bit numb, then it would move to a light/airy feeling in my chest, then my legs, then repeated the cycle. I never got the nausea or dizziness of the next stages – which according to what I read – means I got a very well prepared dish of fugu. I monitoring how I felt for a solid 4 hours while reading and watching tv until I felt like things were not moving on to stronger stages, then tentatively went to bed. When I awoke in the morning, I could certainly feel the same shifting around of the feelings – but much less so. Still, the feeling stuck with me until about noon of that day when I got some good walking in and ate a great lunch. So what did I learn? Was it worth it? I would say yes – for the pure experience factor and only if you go to very high-end, well respected places. 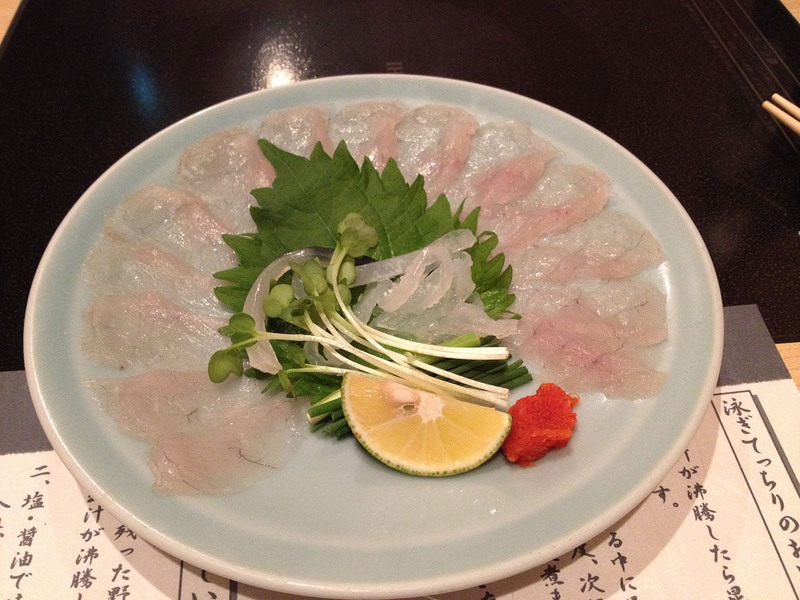 Fugu is simultaneously a nationally celebrated and notorious dish. It’s consistently rated at the top of the most dangerous foods to eat. Even the Simpsons had an episode about it. To say you’ve done it does put you in a small crowd. Is it worth the risk for the flavor of the dish? No, I can’t say it is. While good, it’s not markedly better than most other kinds of sashimi I’ve had. It does have a unique texture and a really pleasant, delicate taste (again, closest I can think of is a chewy yellowtail). 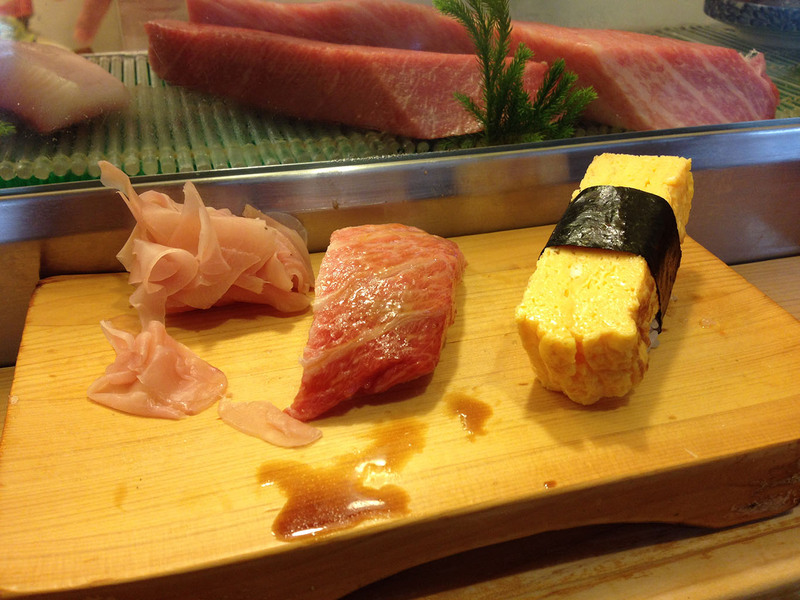 But I had much more enjoyment from the ultra-fresh sushi I enjoyed at Tsujiki. Would I do it again – almost certainly not. After the odd feelings I had for nearly 24 hours afterwards, it certainly isn’t something I would like to repeat. I found that part to be more disconcerting than invigorating. Not having control over what your body is doing is not something I enjoy – but could understand why some would. For me, I tempted fate once and came out fine. I apparently got a very well prepared dish of fugu, got a taste of tetrodotoxin, and lived – but it’s not a flavor I think is worth tempting fate twice for. 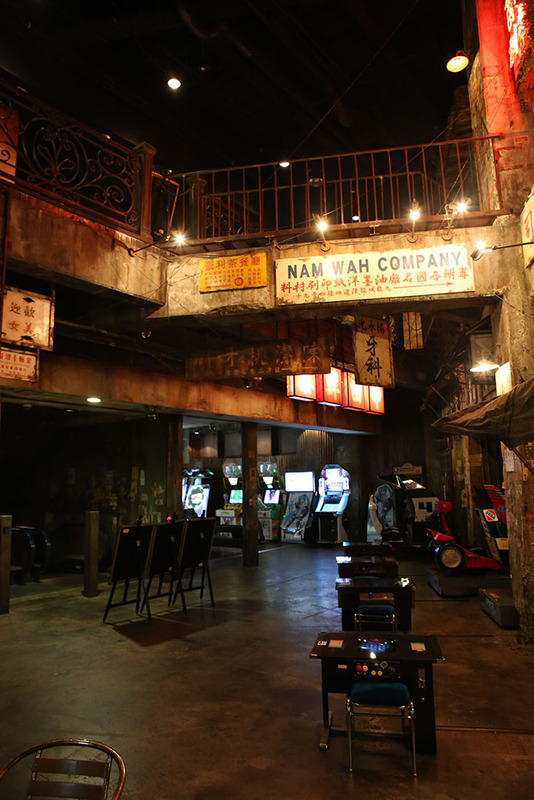 So, I jumped at the chance to visit this arcade that was supposedly inspired by the city. 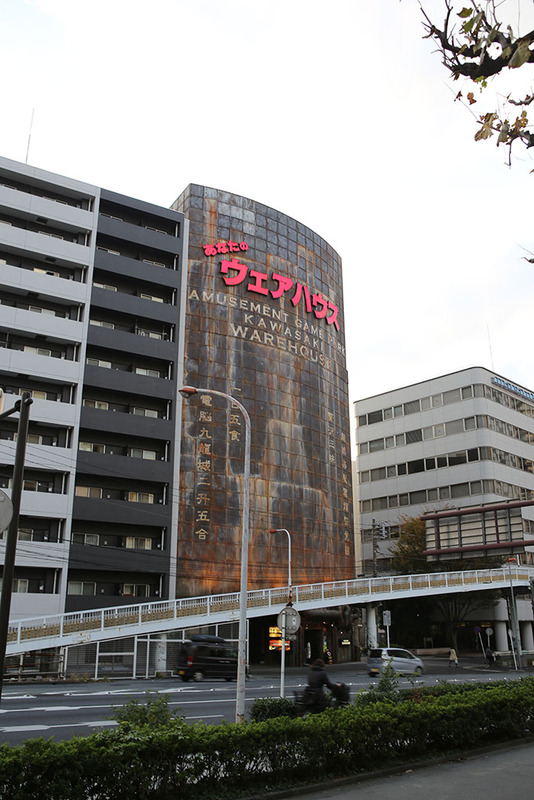 I took the 30 minute train ride down to Kawasaki and took a 5 minute walk south-east of the train station. And there it was nestled between some innocuous looking business towers. This thing was impressive – the closer you got – the more amazing it looked. The front door itself was an amazing little piece of art. The doors opened automatically with a whoosh as you entered. 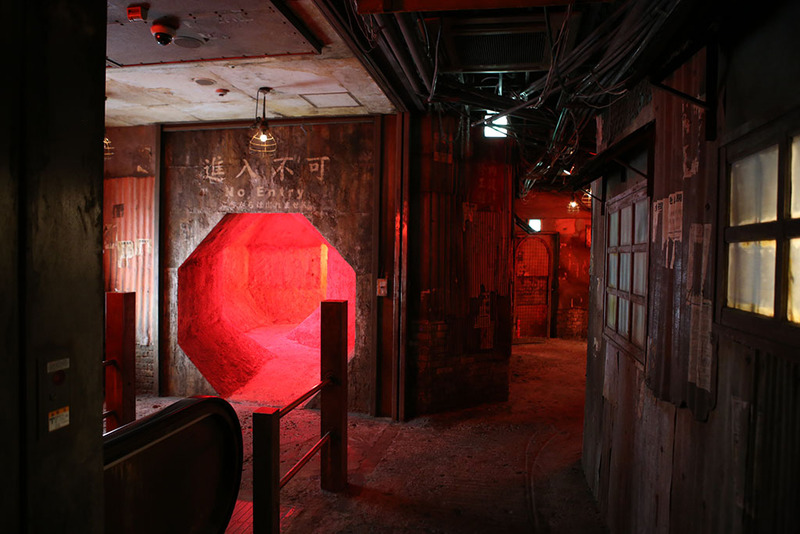 And revealed another passage/airlock within. 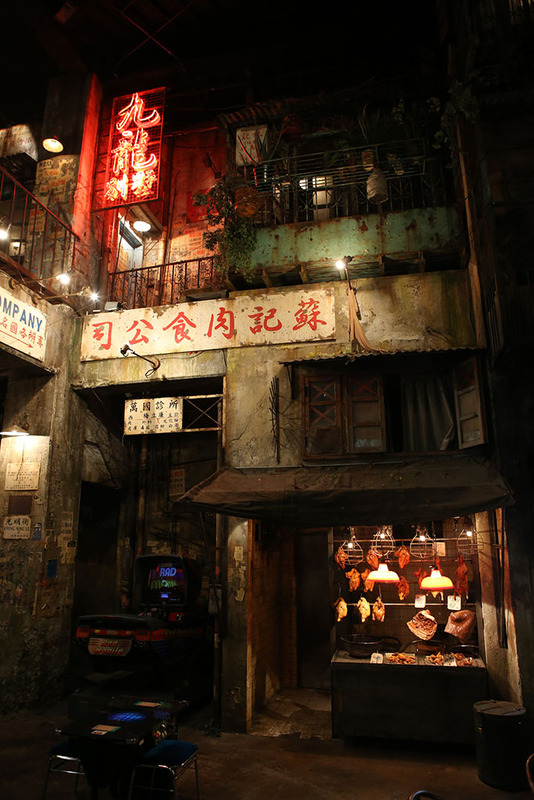 Once you entered the second door, you found yourself in a long hallway that mimics walking down one of Kowloon’s narrow city streets. 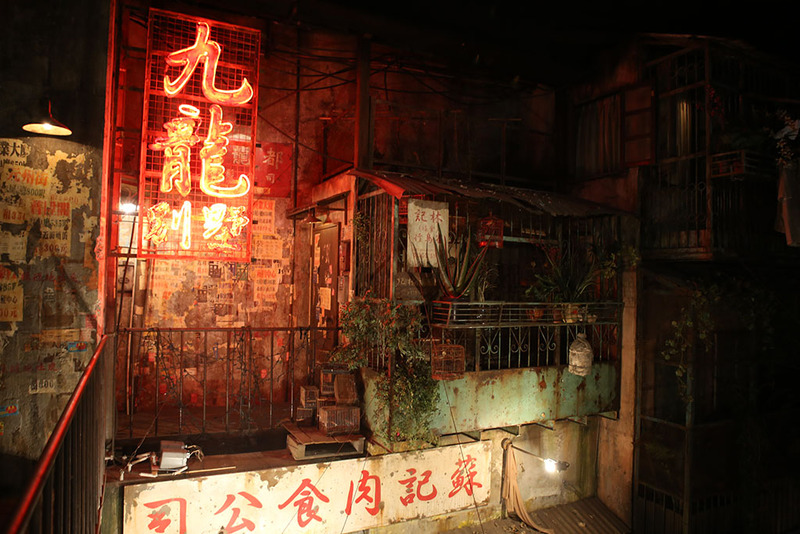 You hear street sounds, and as you walk past the doors/windows you overhear things behind the walls. It sounded like you were hearing bits and pieces of conversations behind the walls in dingy apartments. 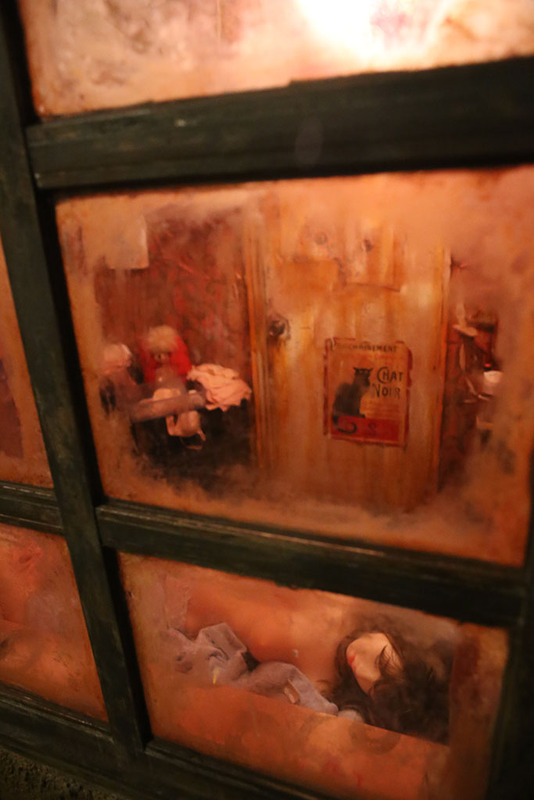 Often you could look through the windows and even see little scenes and apartments. It was all really well done with lots of great details. But the real treat awaited upstairs. Wow! 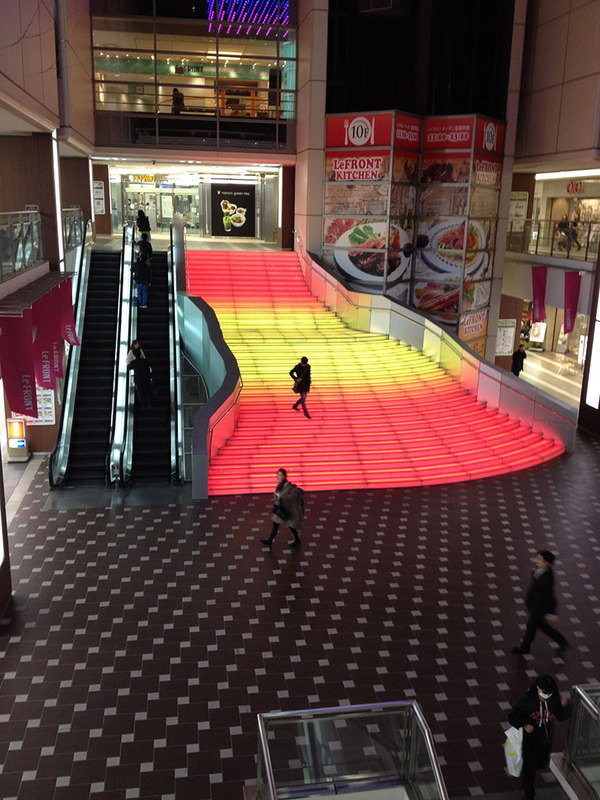 You come up the elevator or escalator and are greeted by this amazing sight. 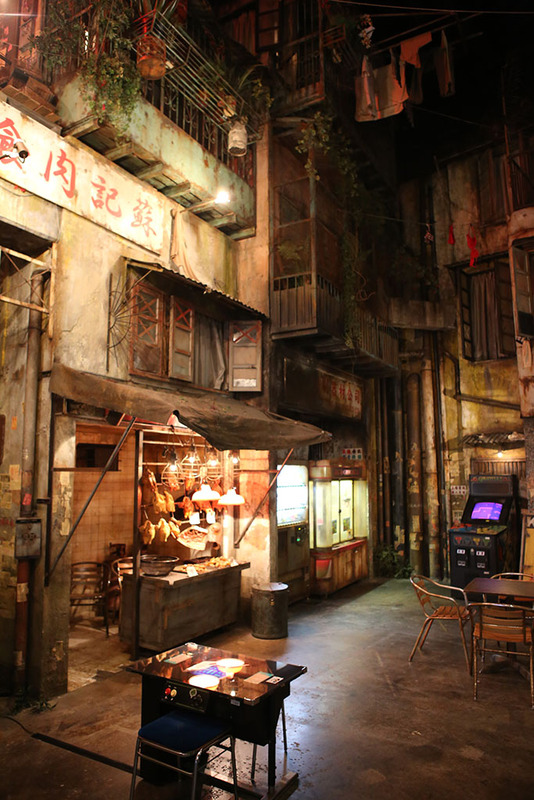 A very intricate re-creation awaited – even down to the street food and dingy vending machines. 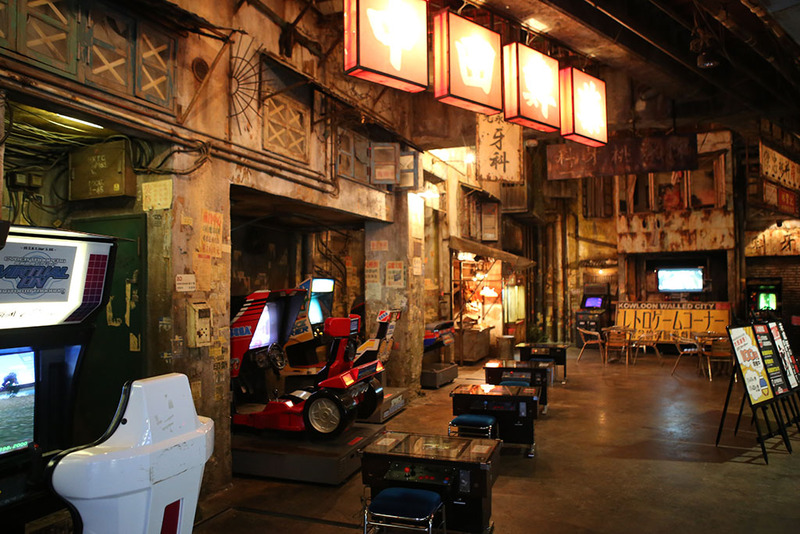 But this place isn’t a museum – it’s an arcade! 5 floors of it in fact. 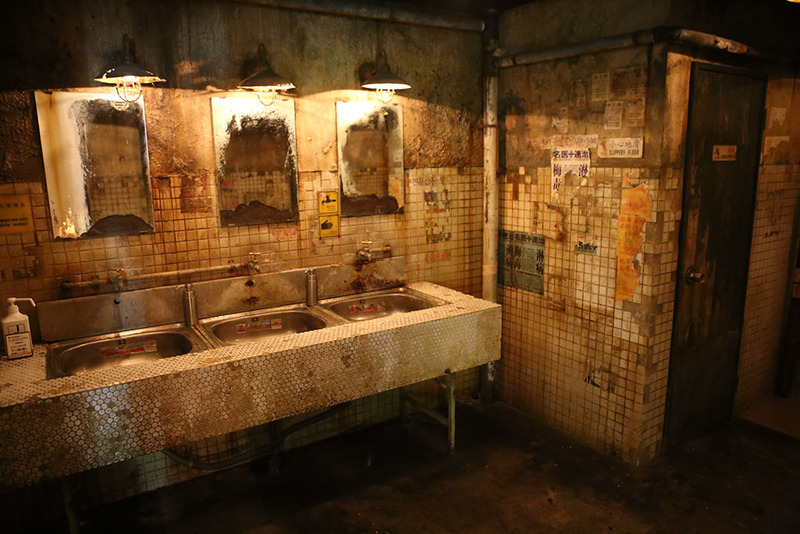 The first three floors were Kowloon themed – even down to the bathrooms. 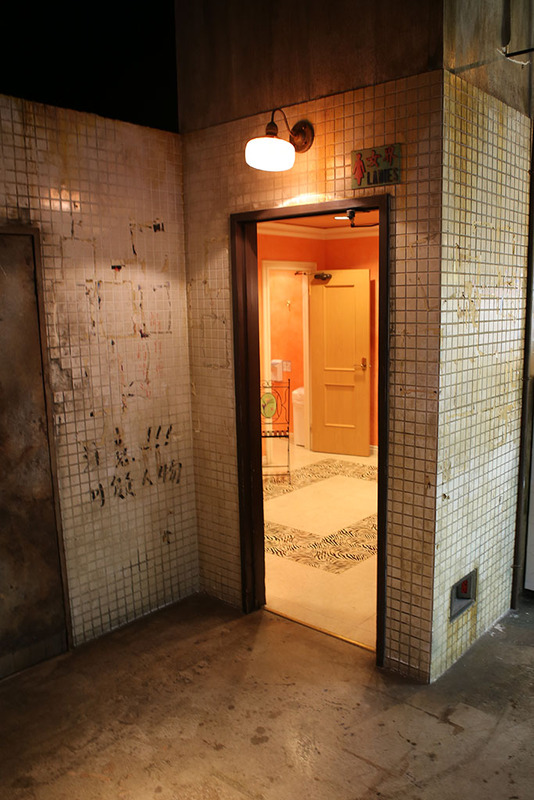 Well, the men’s bathrooms anyway – the women’s were very nice (at least from what I could see from the hallway – thankfully the arcade was almost empty mid-day on a weekday so I could snap this shot of the open door). 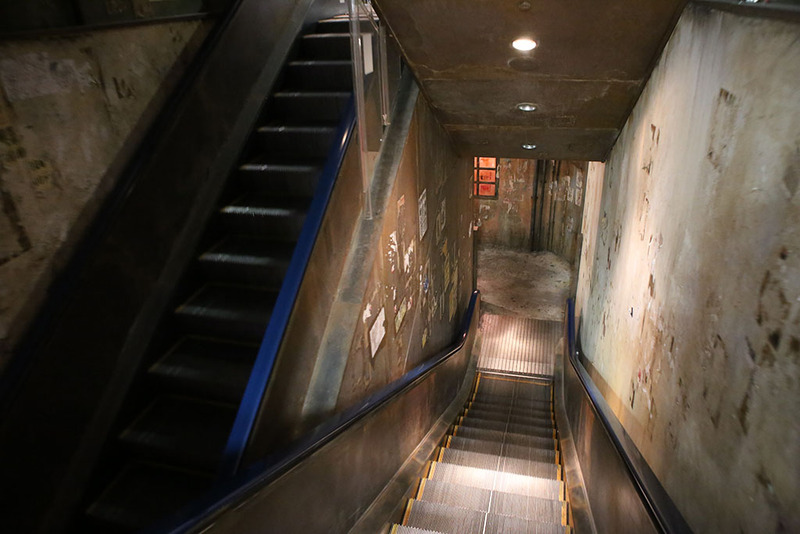 However, it turns out each floor has a theme too! There was a floor done up like Greek/Roman architecture. Yet another that looked kind of like a smokey leather/hardwood bar. There were also lots of different levels of games. 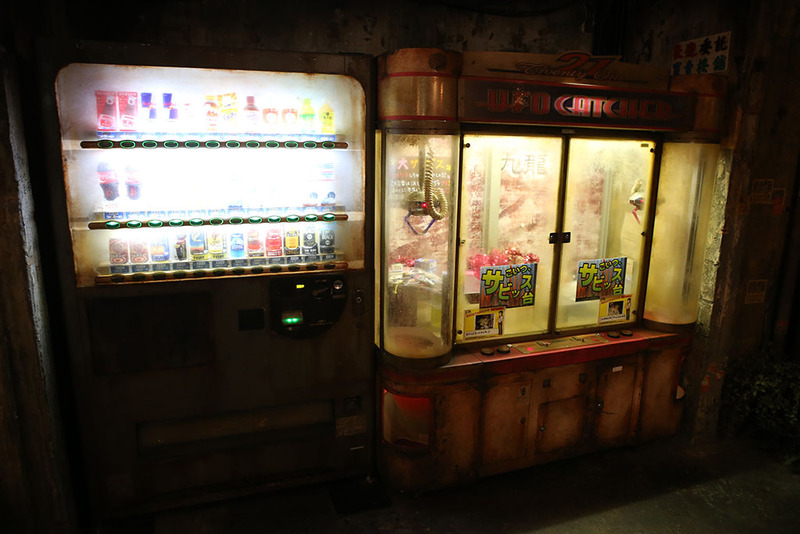 The first arcade level, like many Japanese arcades, were claw prize machines. 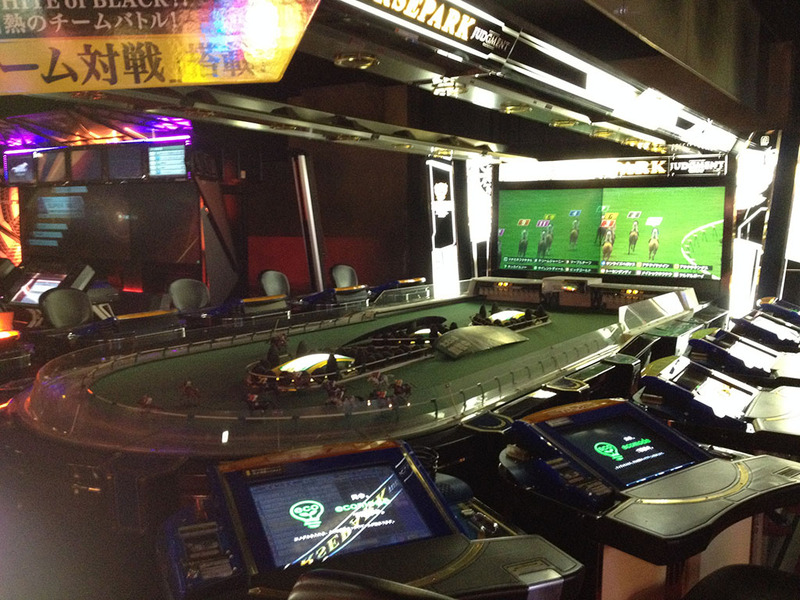 The second level was pachinko machines of all sorts, and some strange, gigantic video horse-racing games. 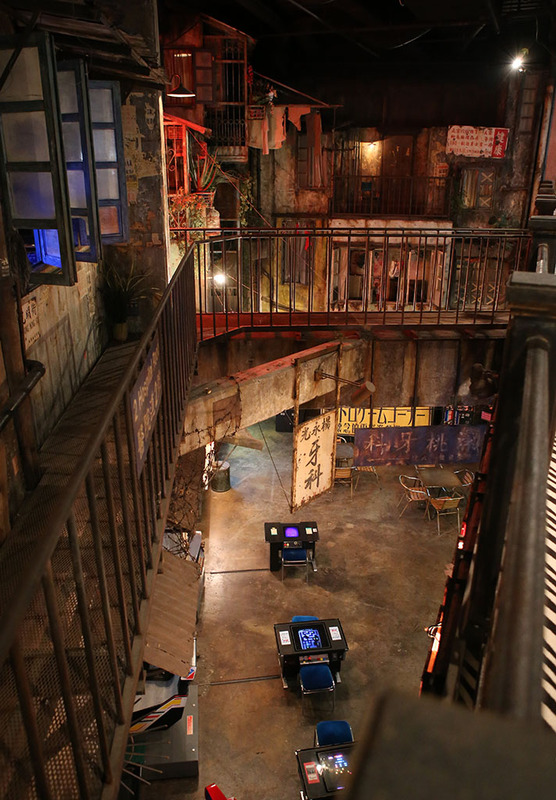 The third level was the traditional video arcade machines you’d expect. 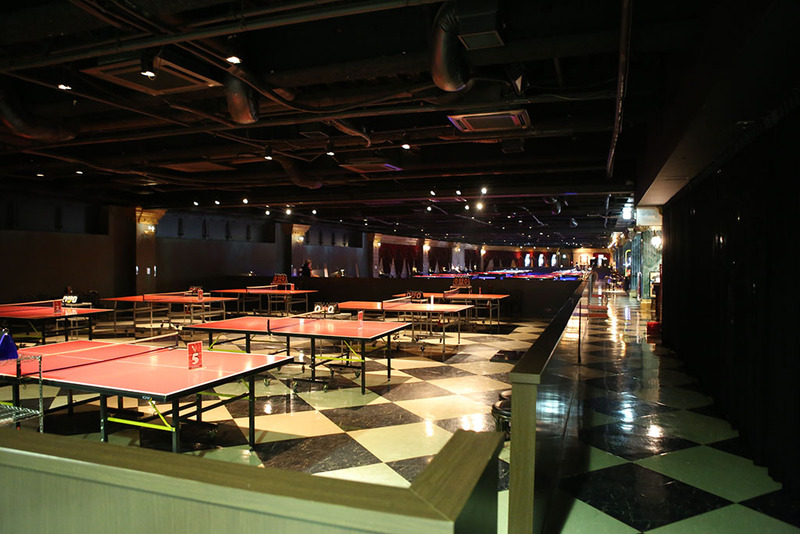 The fourth level was a field pool and ping-pong tables and dart boards being used by some very serious looking characters. 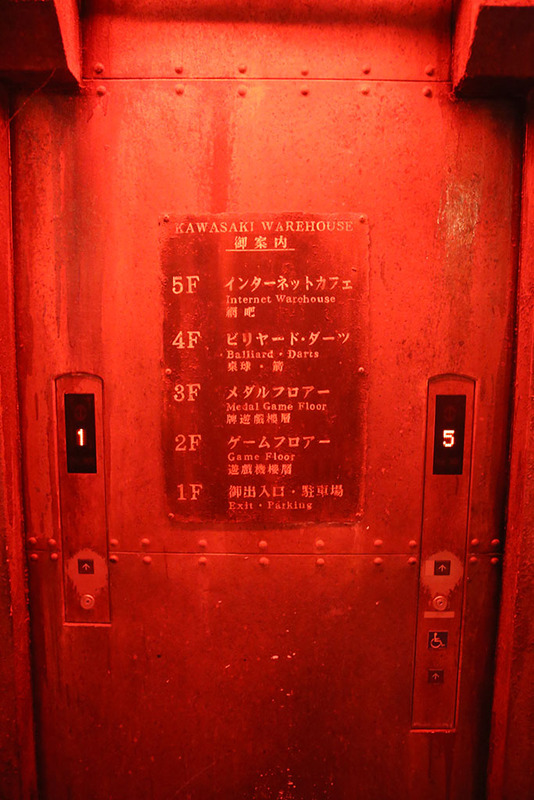 The fifth floor was some kind of private club area – so I couldn’t go in to check it out – but it looked a little swanky. The second floor’s games, however, were very impressive. 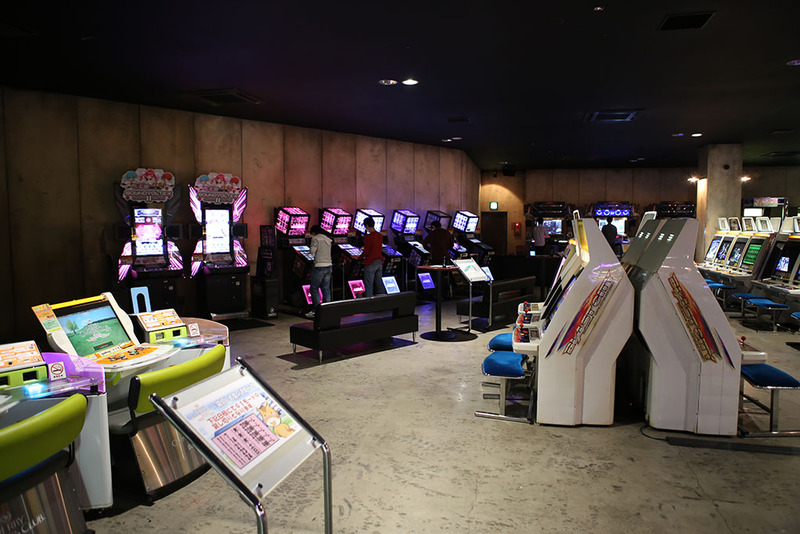 Here was a guy killing this game called Jubeat. You had to hit the squares that lit up with special icons in sequences as the music played. The icons changed color quickly after they appared, and I think you had to hit in time with the beat to give you perfect/good/missed scored points. This game is called BeatMania. It’s a fast-paced rhythm game you play on a very realistic DJ mixing panel. Some of the better players I saw were going at amazing rates – this was probably the *slowest* I saw someone playing it. This game is called Gunslinger Stratos. Looked a lot like a standard rail shooter game but with dual-wielded pistols. The graphics were really well done, but the real kick were the physical guns. On various parts of the handguns (sides/top/front/etc), they had little alignment rails with attracting magnets in them. 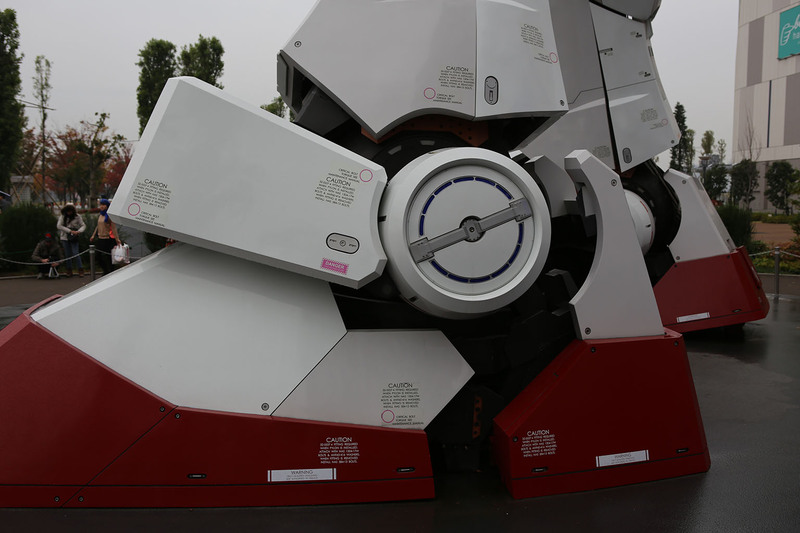 While you played, you could you could physically ‘hook’ the two guns together in different configurations: side by side, one on top the other, etc and get different power shots/effects. 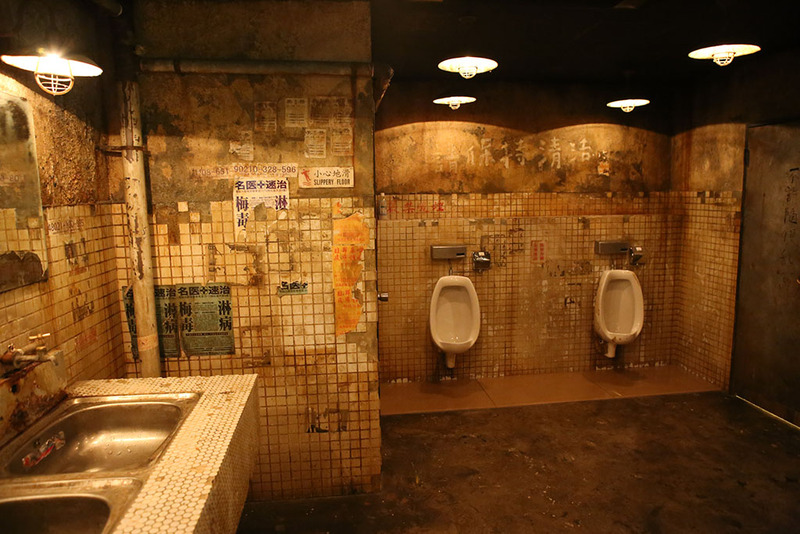 These things have apparently been getting really hot in Japan – P.O.D. (Panoramic Optical Display) systems. Right now, this one is set for Kidō Senshi Gundam: Senjō no Kizuna – Mobile Suit Gundam: Bonds of the Battlefield. You actually sit inside this cockpit and are surrounded by displays. 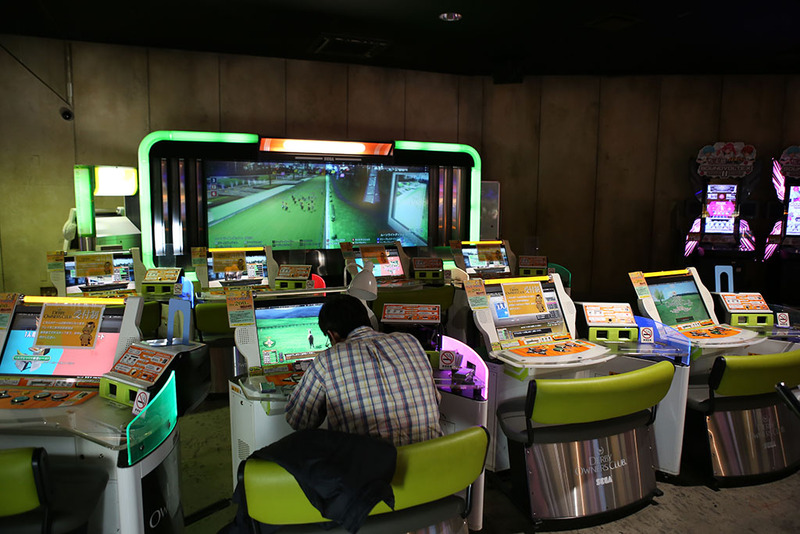 They’re apparently networked and you can play people across the country – or in the same arcade. If in the same arcade, you apparently even get in-cockpit voice chat. 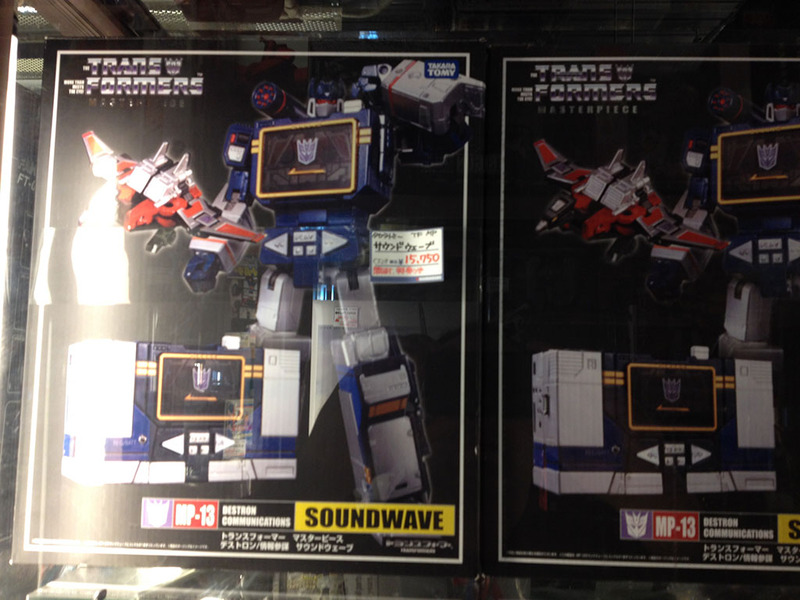 But at like 500Yen per play ($5), it comes with a steep price tag. I went back over to the Kawloon themed area and took some more shots. It was impressive. 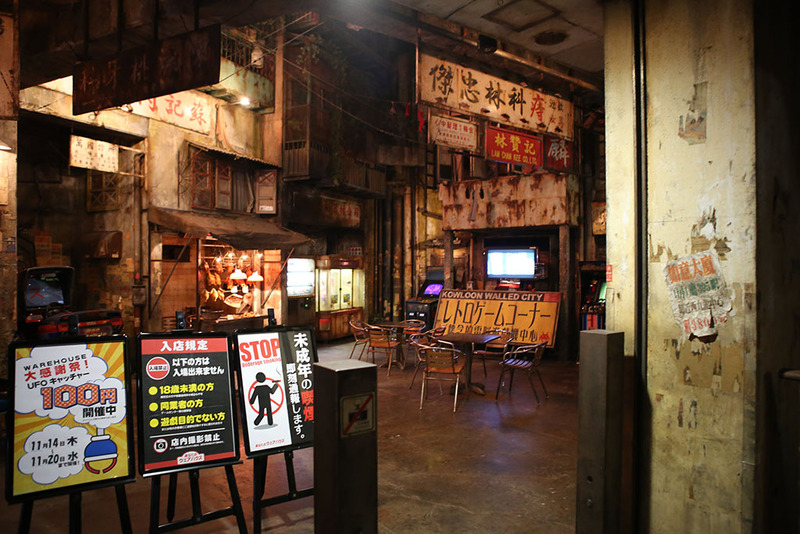 But one of the most impressive things was the back entrance to the arcade. 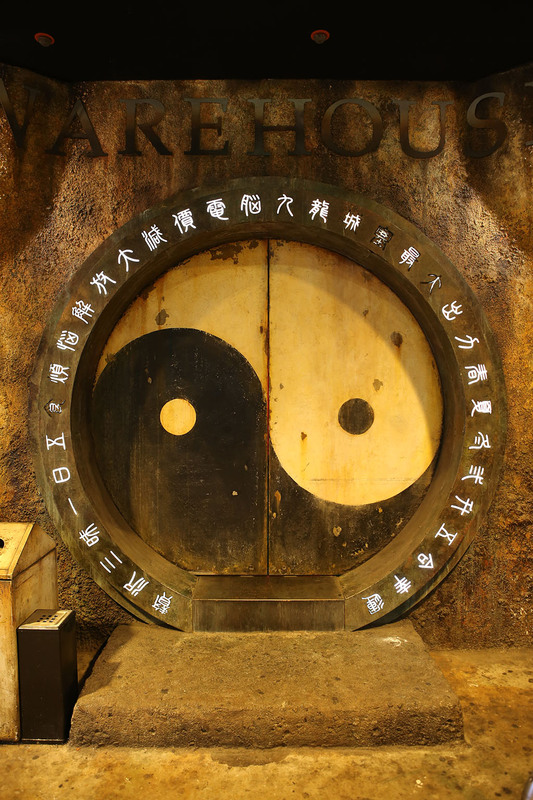 So, if you come in through the garage, you see this cool looking door, but when it opens…WHAT???? 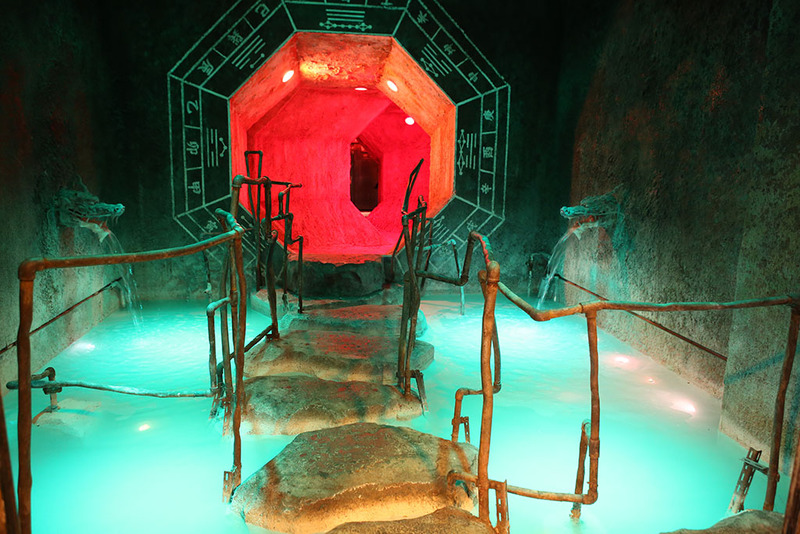 You get a cool little room with water pouring in from dragon heads and you walk across the rocks with rusty pipe handrail while funky ambient music plays. Here’s a video of the effect. 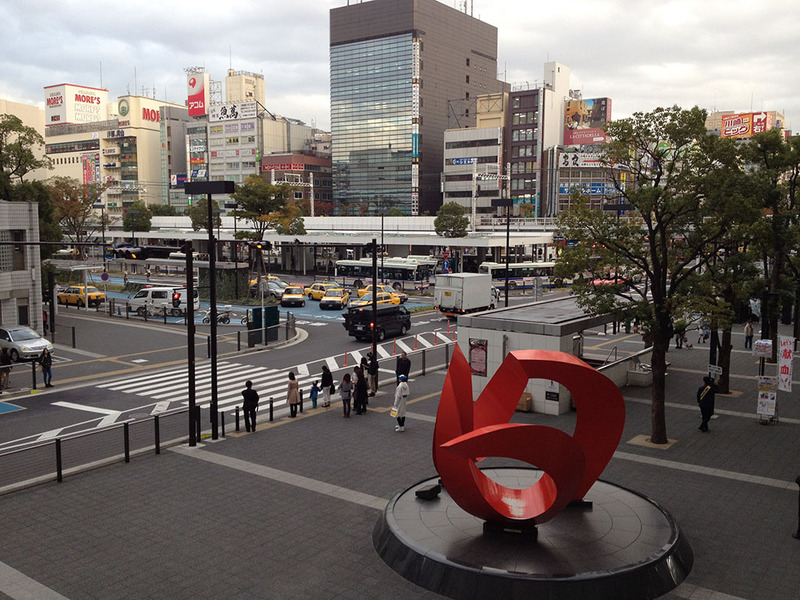 Got up moderately early as I continued to overcome my jet lag and went over to Shibuya station. 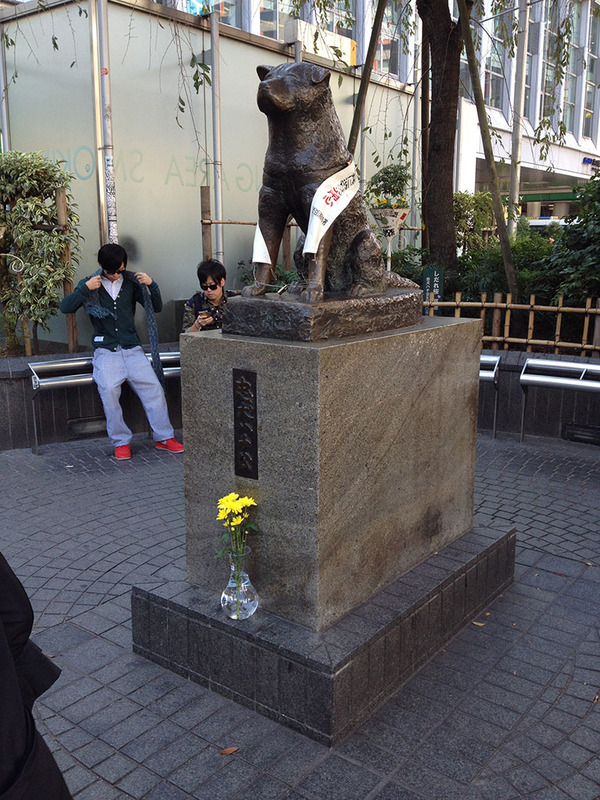 I got a better picture of famous Hachikō statue. 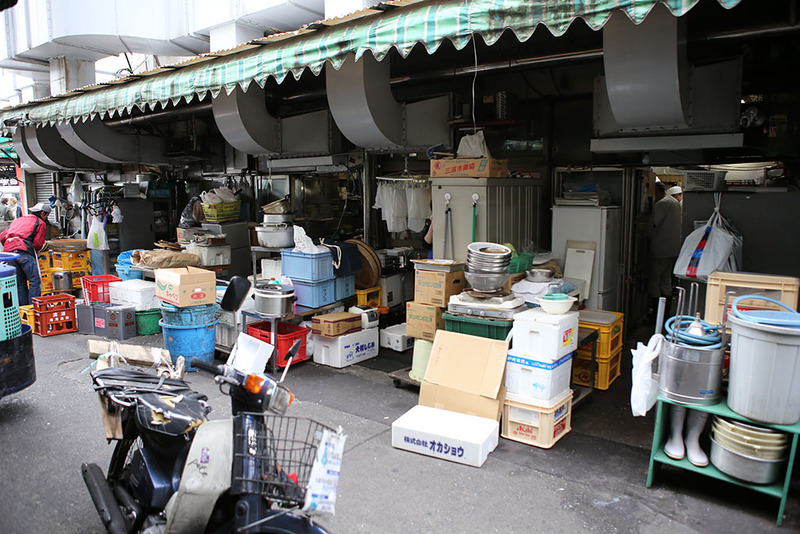 Then it was off to the Tsukiji fish market. 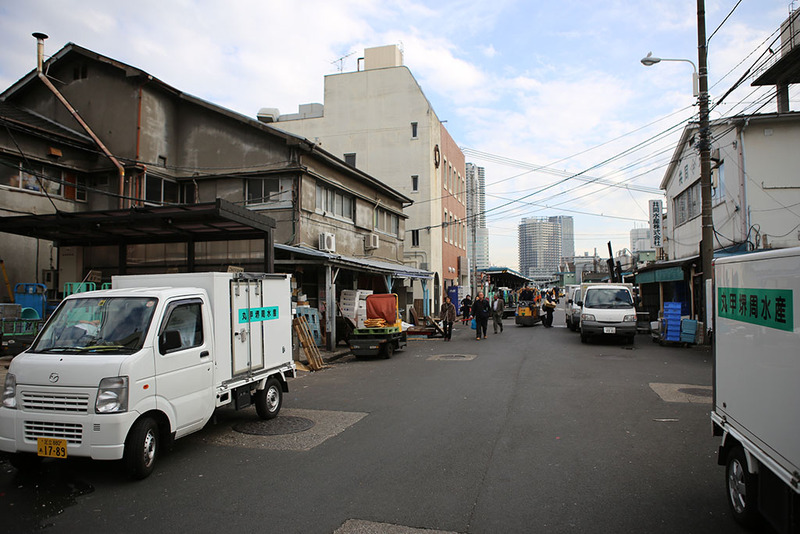 Tsukiji is arguably one of the most amazing fish markets in the world. 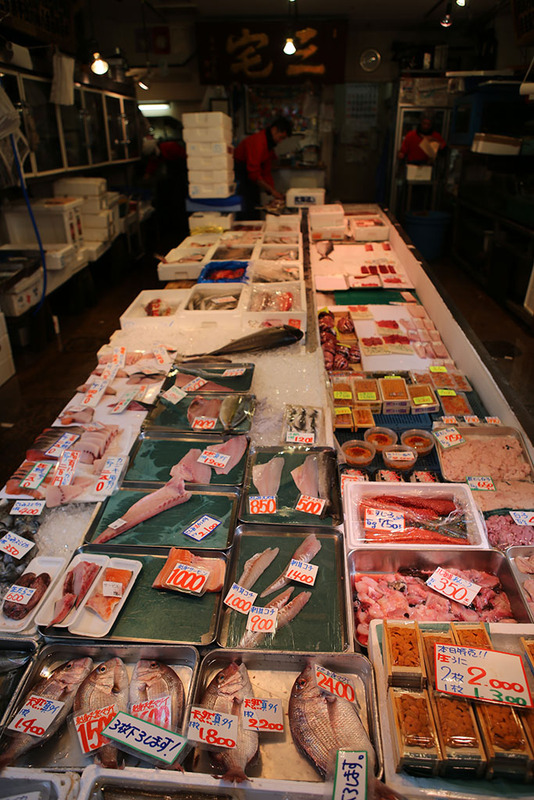 Every day, fishermen bring their nightly catches to the market. Madness ensues during the unloading and nearly instant auctions for the fresh catch of the day. They are usually well in swing at 4am sharp – so one has to arrive very, very early. I had several friends who braved the early morning madness. While they said it was a great experience, they didn’t know if it was really worth getting up that early for it. So, taking their advice and hoping for a nice full day instead of getting up insanely early then needing a rest mid-day, I went a bit later at 9am. Upon arrival, I decided to get some food. 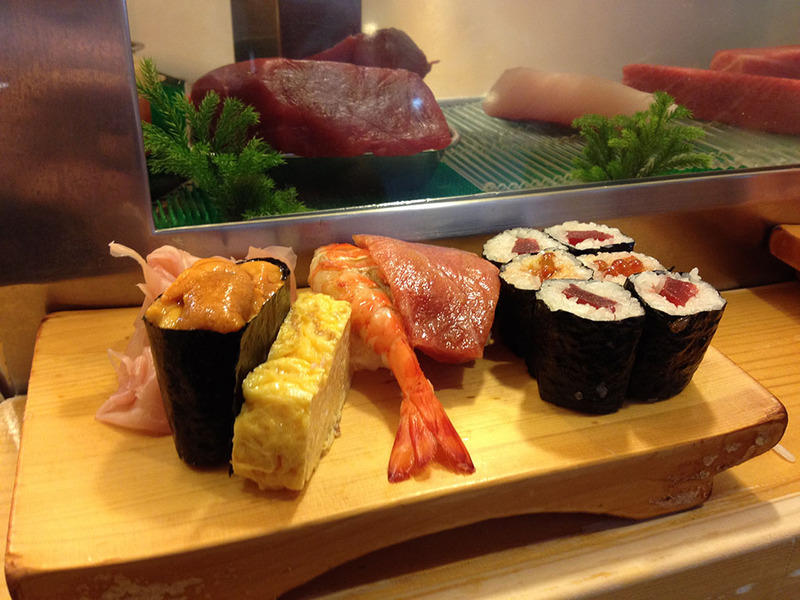 And why not have what is arguably some of the best sushi in the world? 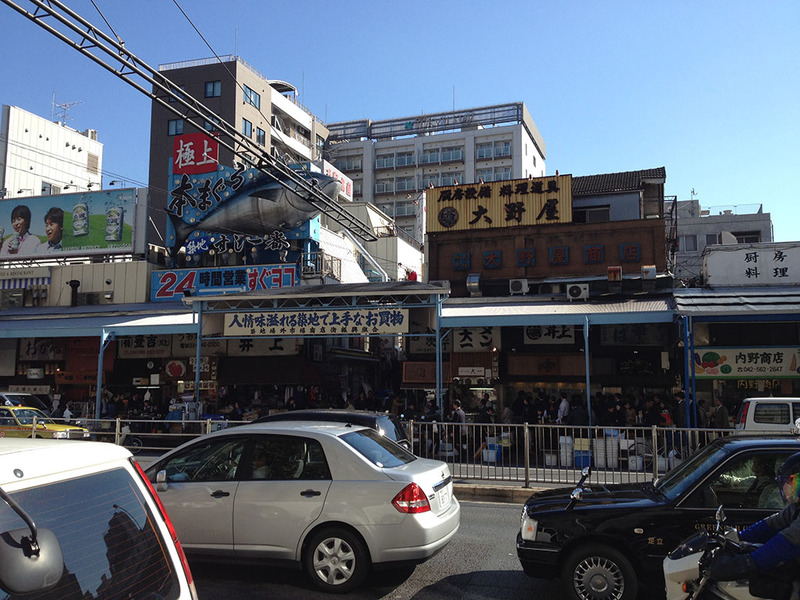 Here’s a picture of the lines outside Daiwa Sushi and Sushi Dai – two of the most famous and probably best restaurants in the market. 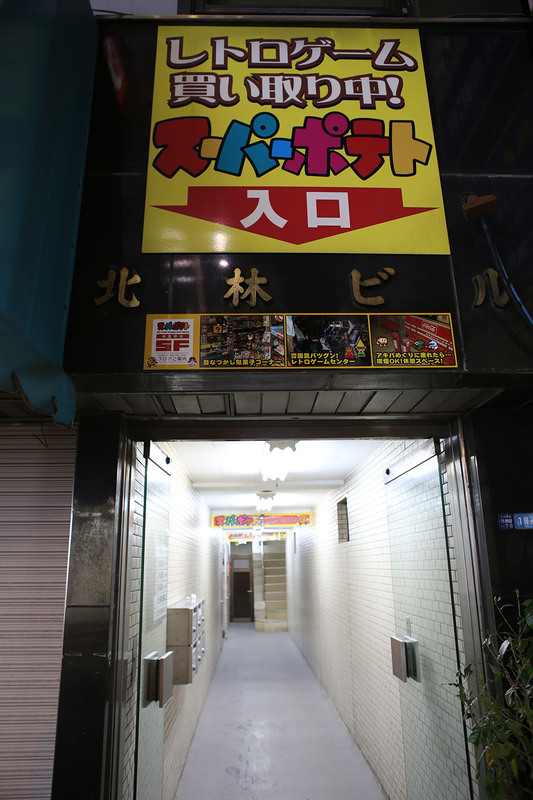 These two sushi shops are a father and son pair next door to each other. Sushi Dai is the father’s shop on the right and often has a 2-3 hour wait from the time they open at ~6am till 1pm when the close. 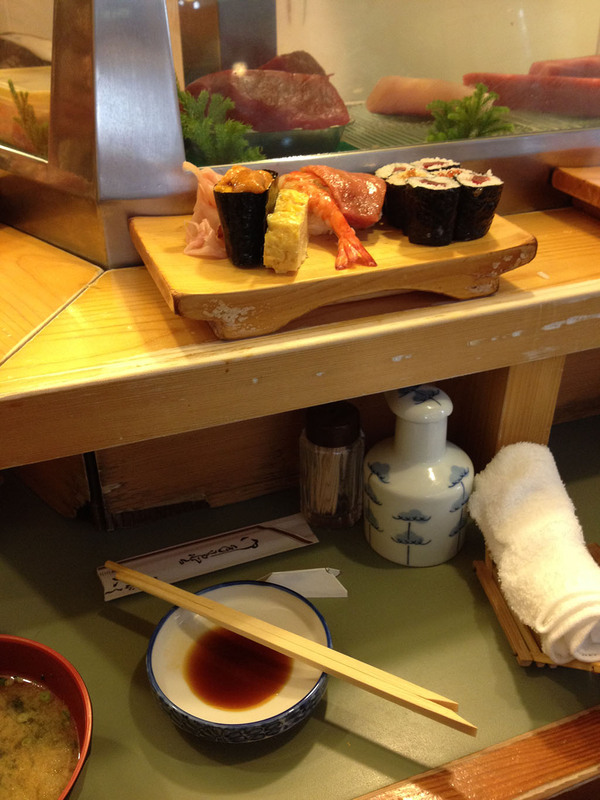 I opted for the son’s shop Daiwa Sushi on the left and waited about 30-45 min before I got a seat. I had a nice chat with two Korean journalism students who were working abroad in Japan. 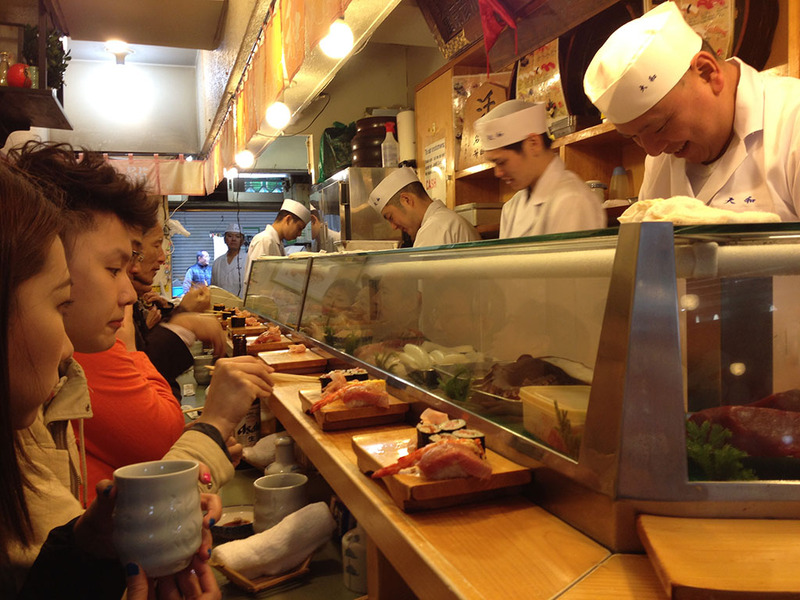 You take a seat at the very small sushi bar. It only seats about 12 people and the cooks are hard at work. I decide to take their 10 piece ‘set-menu’ option with the chef’s choices of the day. At about $35, it was also a pretty darn good deal too. I place my order and sip on my tea. The sushi arrives as you eat. As you eat up your first round, without even asking, the super-friendly sushi chefs simply leans over and delivers the next few pieces. I start working my way through the chef’s choices. Does it live up to the hype? Yes! You can tell this sushi is of another level all together. Since these fish were swimming in the ocean only 12 hours before, you simply cannot get much more fresh – and it shows. 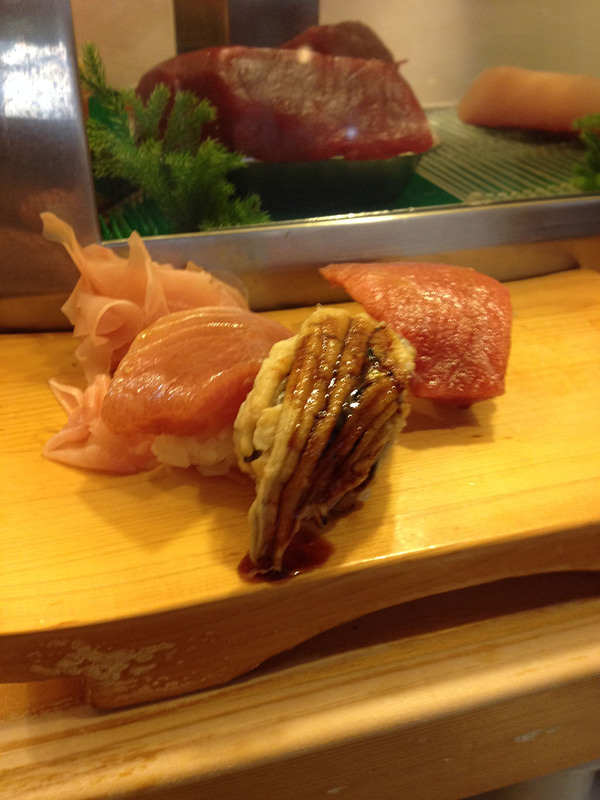 The tuna is particularly extraordinary as it pretty much melts on your tongue and barely requires you chew. Tuna (and other fresh fish) that has been stored or sits around tends to pick up more and more of a rubbery texture and looses it’s flavor as it sits/is stored. This had none of that and was of a very different melt-in-your-mouth texture. Each of the pieces was absolutely fantastic. In fact, I just kept ordering until I couldn’t have another bite. It was the best $45-$50 of sushi I’ve ever eaten. Upon finishing my food – you find that you enter in the front and exit out the back. As you walk back past the washing station, you pay a hurried lady in the back and find yourself in the alley in the stacks of preparatory materials. 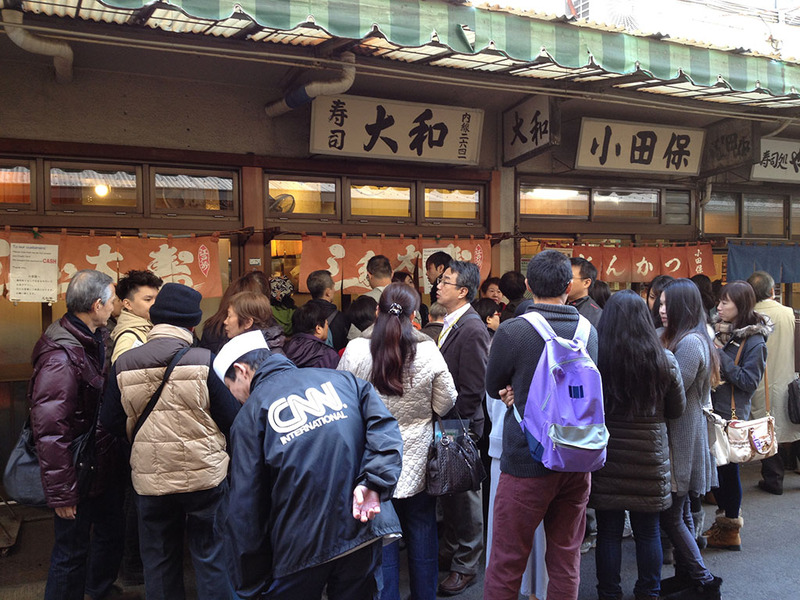 I make my way back around front, and find that the line for Sushi Dai has barely moved. Seems to be I made at least partially the right choice if the difference between the two is marginal. 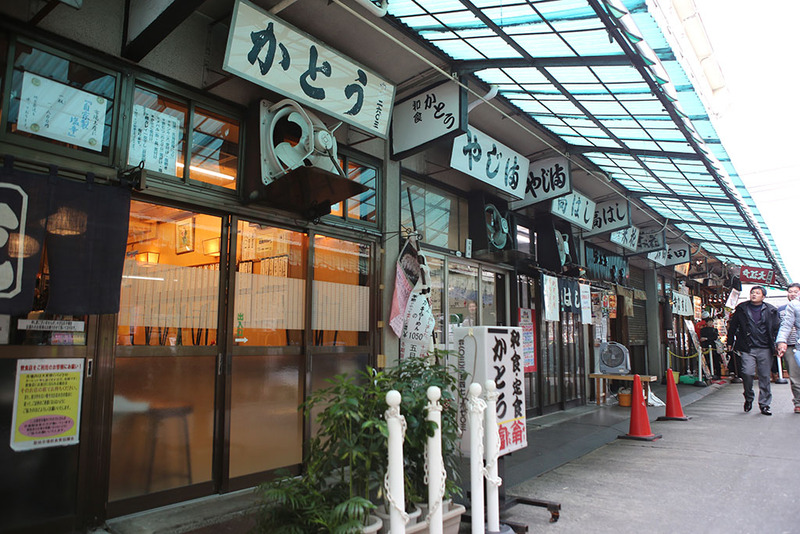 But this isn’t the only eatery in the Tsujiki area. 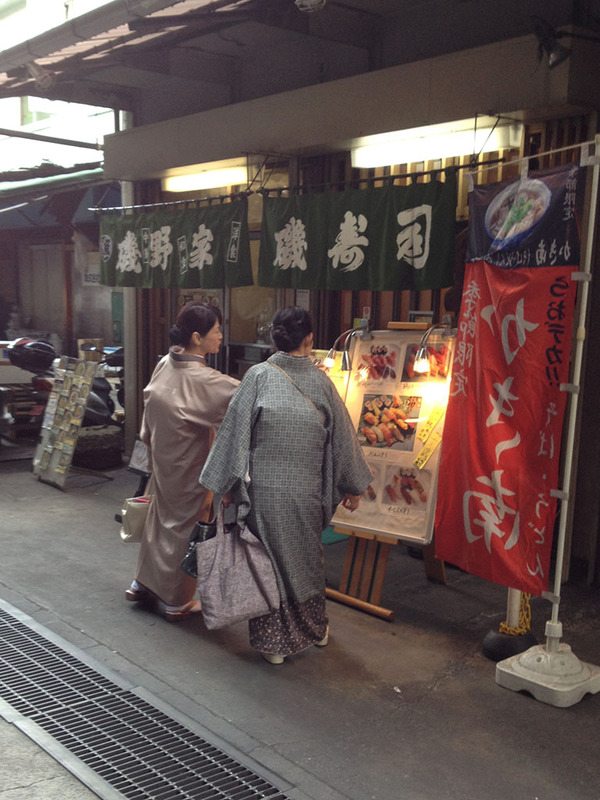 There are rows and rows of places serving sushi, yakitori and all other manner of food. 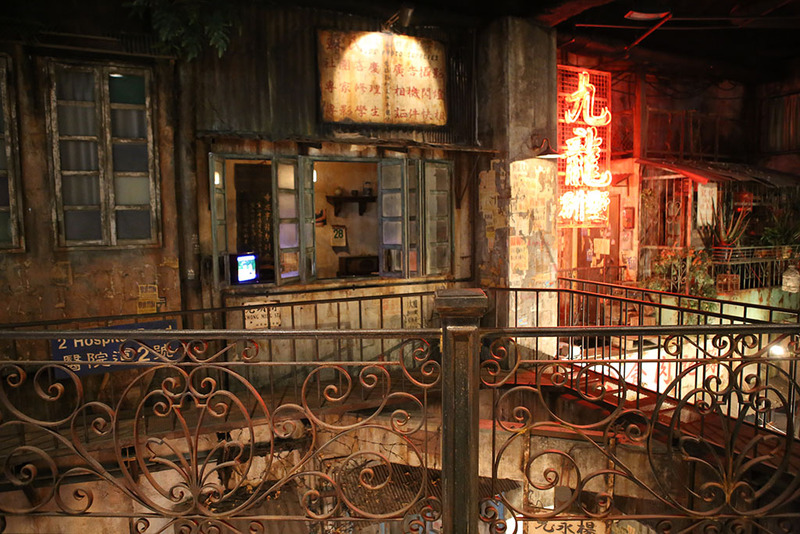 All of these places would blow your average eatery away in the states. 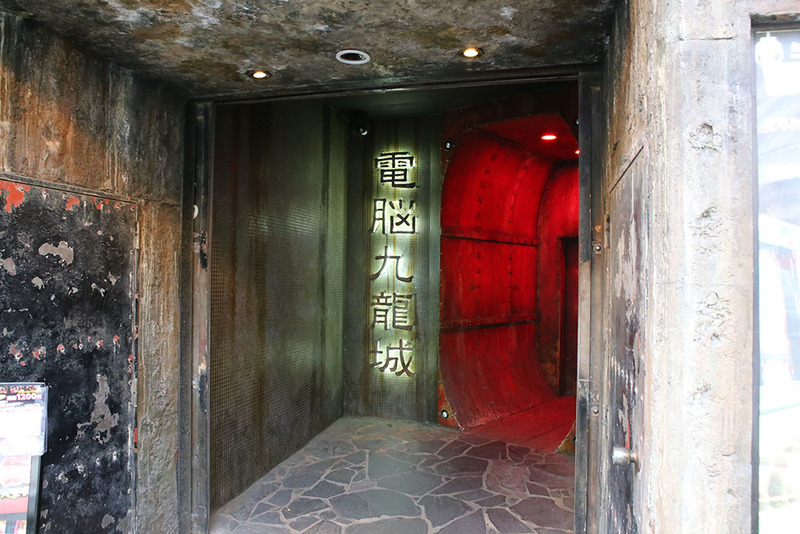 So if you’re pressed for time and can’t wait for Sushi Dai or Daiwa Sushi – definitely try one of these others out and you’ll probably get a 90% experience as well. But don’t stop there! 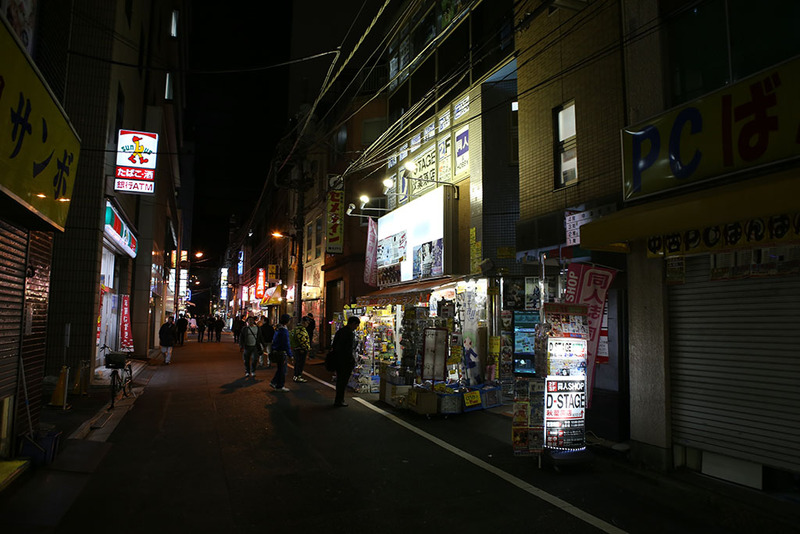 Keep going through the rows and rows of shops just north of Tsujiki. 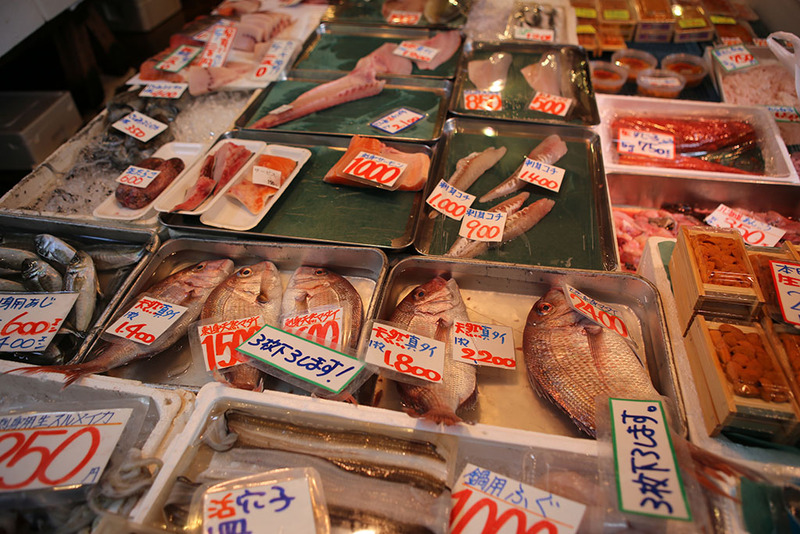 Shops sell things that just came from the fish hauls/sales a few hours earlier. 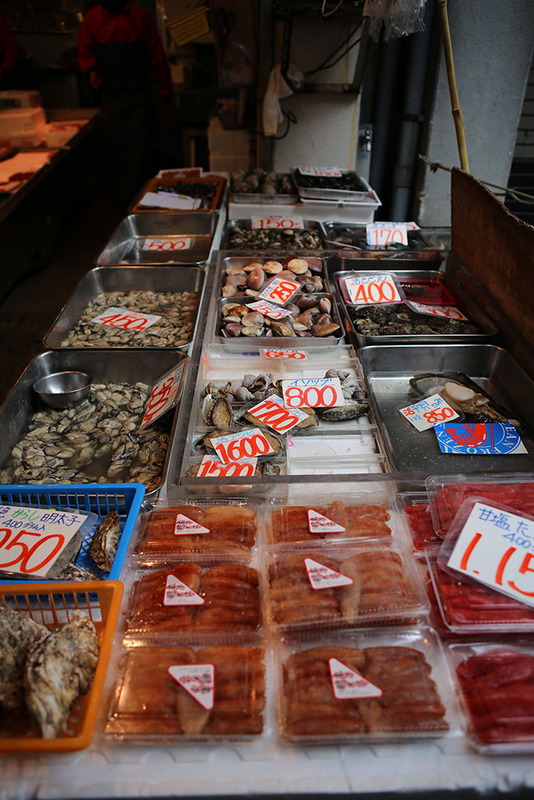 You’ll see just about every bounty from the sea there – fish, mussels, octopus, tuna, etc. 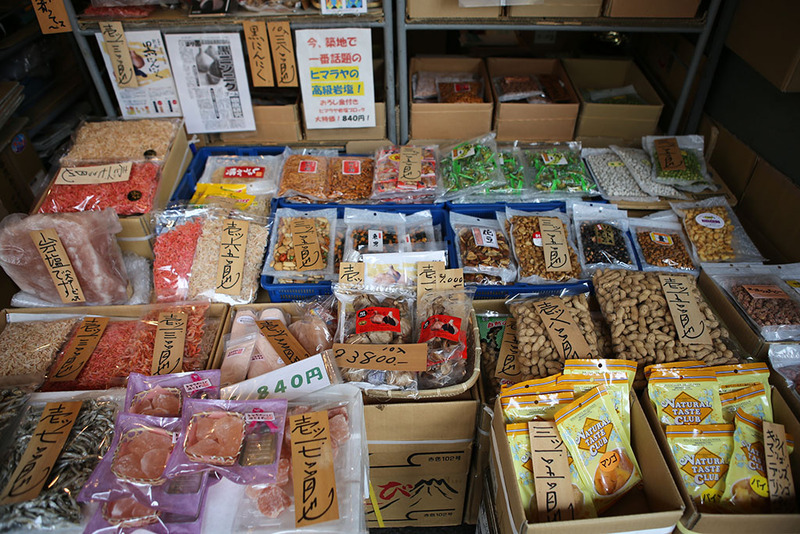 You’ll also see all manner of farm vegetables along with nuts, fruits, and all kinds of things I wasn’t sure about. It’s absolutely worth a walk through and wish I’d actually spent more time there. But the shops weren’t all fish and food. 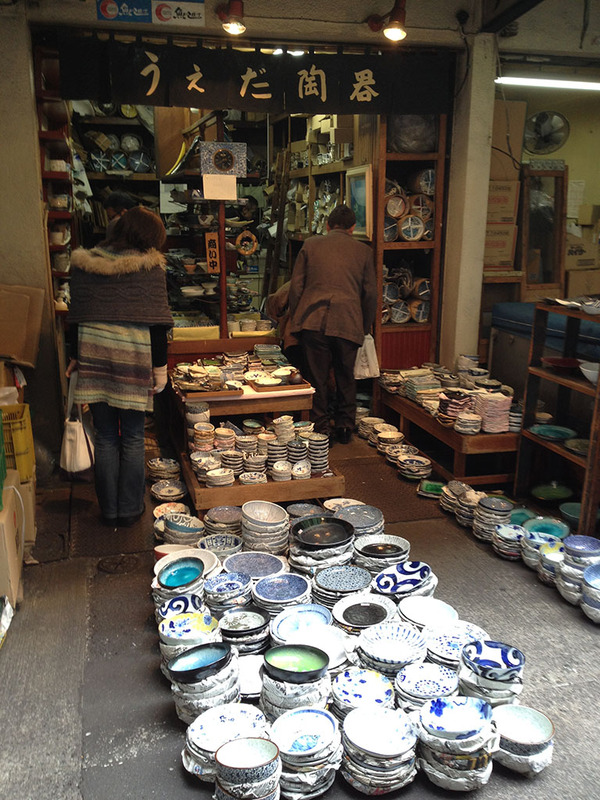 There were also pottery salesmen as well. I picked up a number of very cheap dishes and had them packed well. We’ll see if they survived a ship back to the United States when they arrive here. Here’s another amazing find. 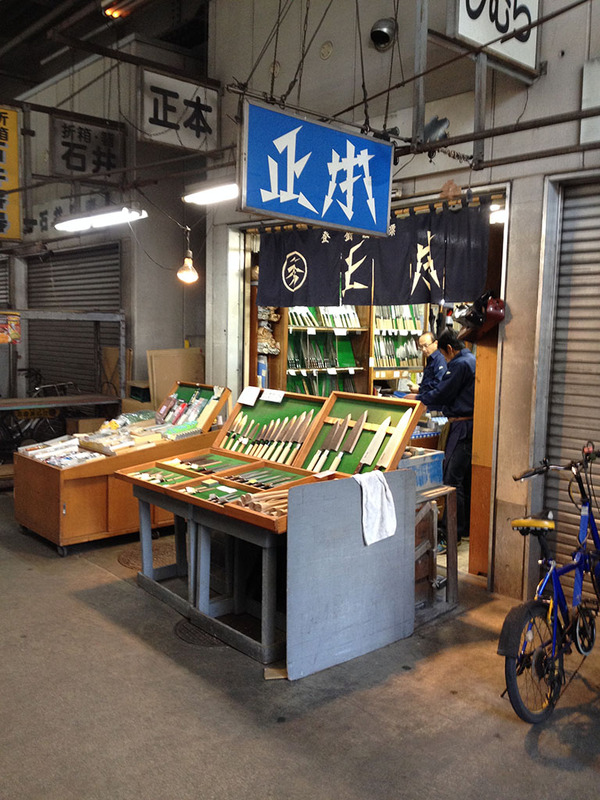 Masamoto knives is hidden among the stalls. Unfortunately, they were sold out of a great number of their knives when I went, but I picked up a beautiful 9.5″ specimin for ….well… a good bit of money. But you are getting just as much of a piece of art as you are a working tool. I am anxiously awaiting it’s arrival as I had it shipped back to myself. 10″ knives aren’t the most clever things to bring in your carry-on luggage. 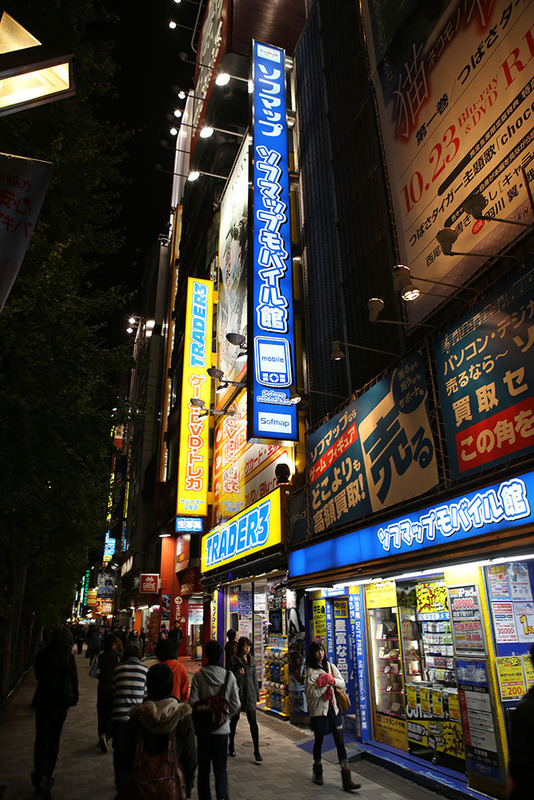 Next set of stops were all along the main street of Akihabara. Shops till you drop. Seriously – I spent almost a whole day here and felt like I didn’t even scratch the surface properly. 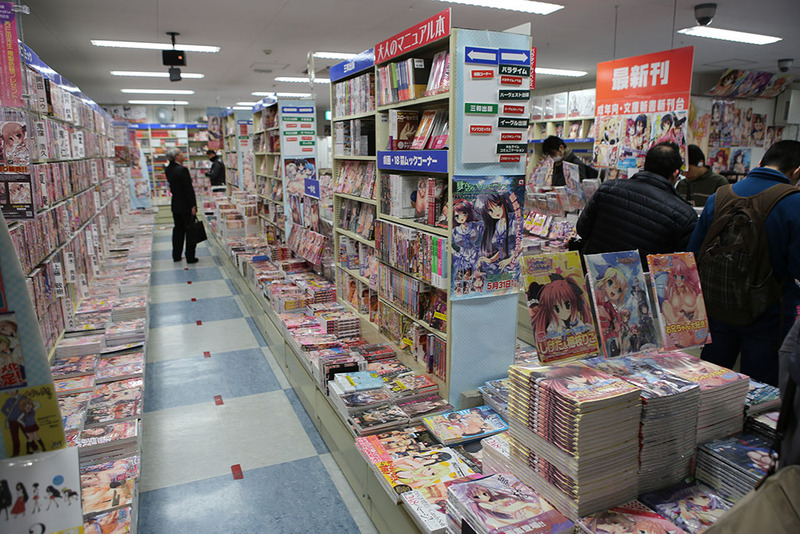 Since I don’t read Japanese, I started culling the manga stores – thought I did drop into one or two just to see how amazing they were. Yep – floor to ceiling, wall to wall. I think it would take a lifetime just to read what was in one of these stores. Onwards. Store after store. 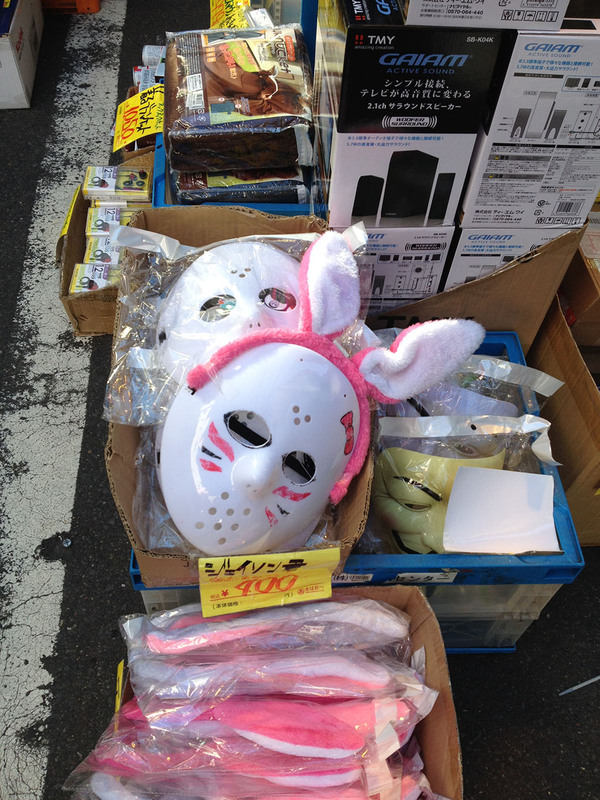 You would certainly find interesting things – like R/C Toilet seats and pretty bunny hockey masks. There were plenty of new/used DVD/Blu-ray stores and found a few amazing gems. 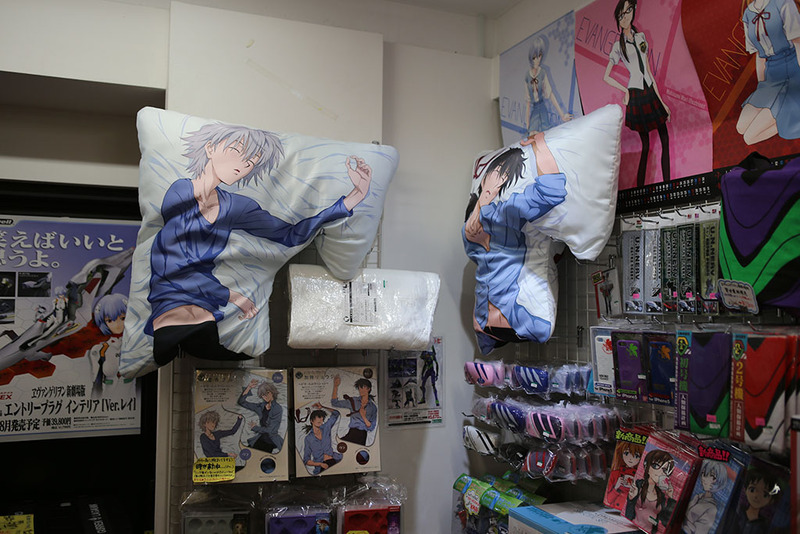 OMG – almost bought these. 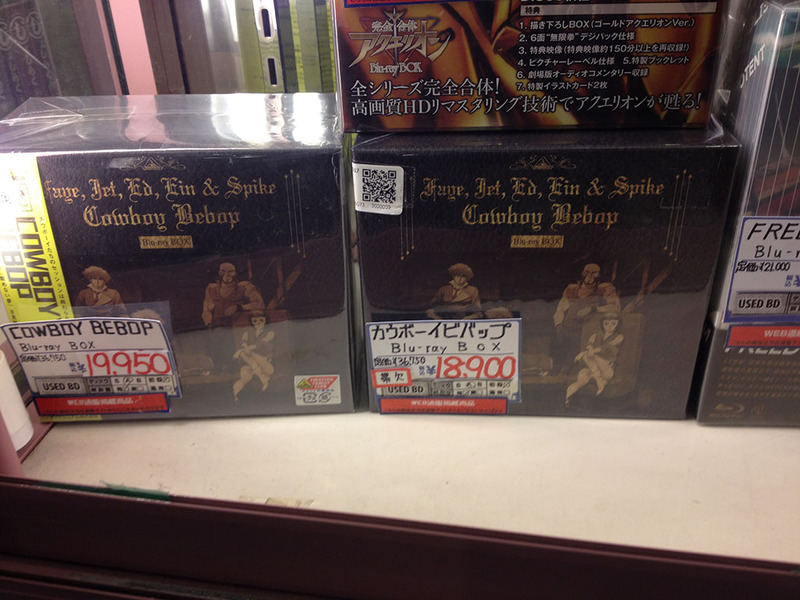 They had a few copies of the limited edition Blu-ray Cowboy Bebop series that had never been released in the US. 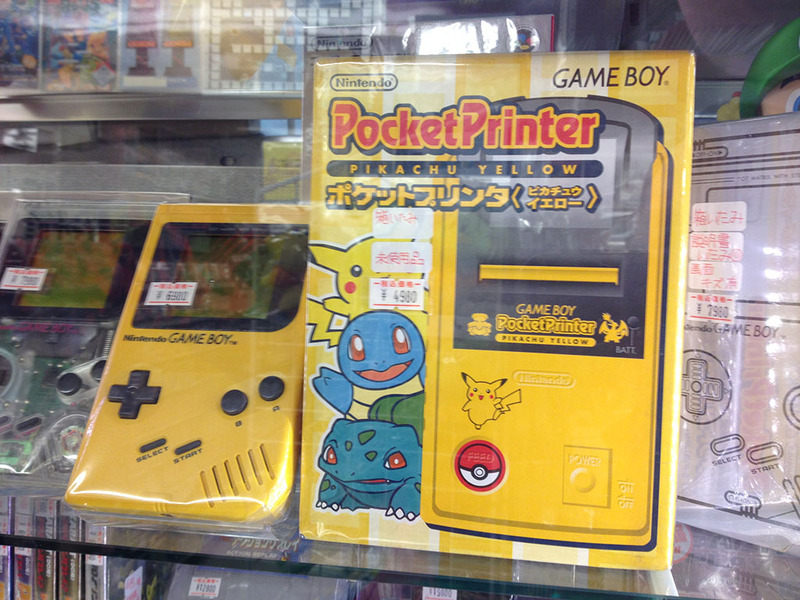 Yeah, and the price really is 18,900 yen – or about $190. 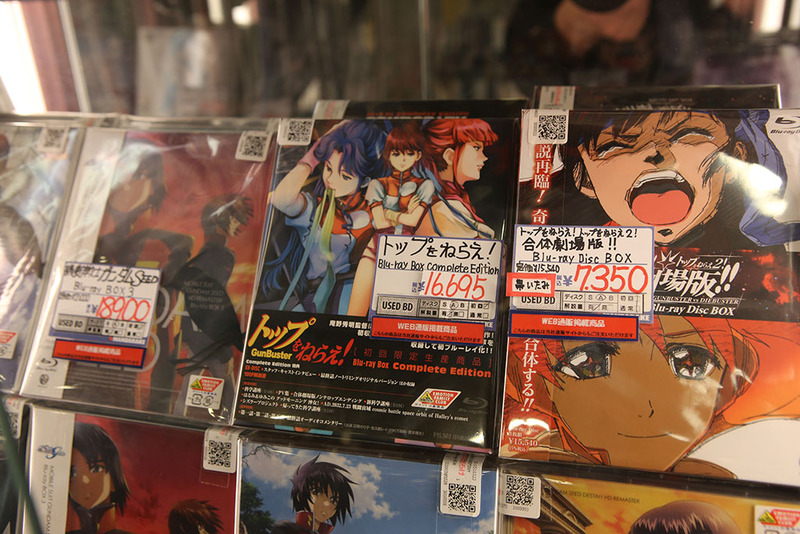 They also had Macross Plus and Gunbuster! on blu-ray – also never released in the US. 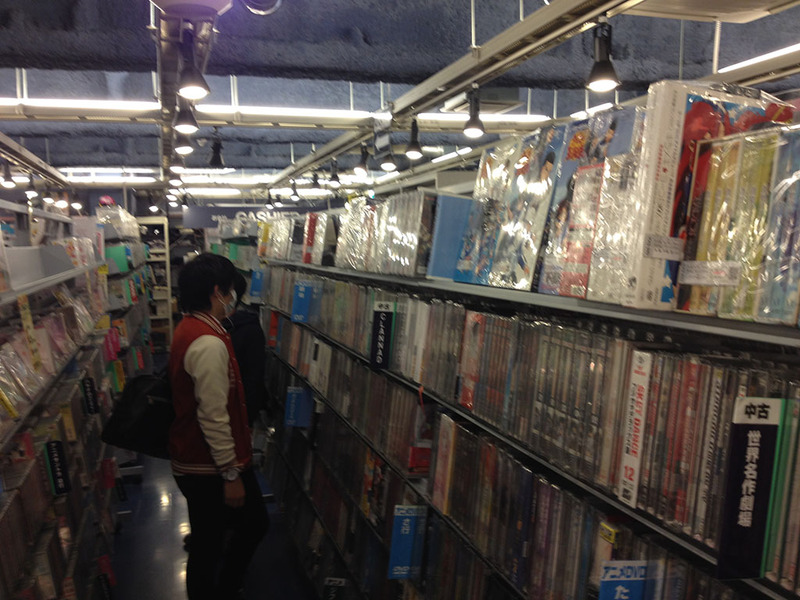 Ugh – it was so painful to see all these great anime series and not be able to justify the price. I also had to remind myself these were mostly region coded for Japan and they were usually subtitled in Japanese and Chinese only. Still, I did pick up a copy of Only Yesterday on blu-ray. I had to mail it back to myself, so we’ll see how that works out when it gets here. 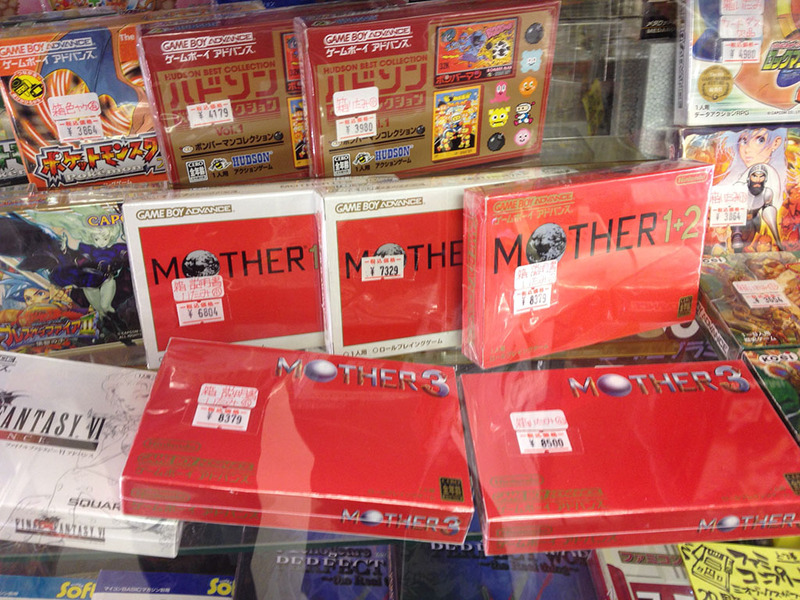 Other shops sold new and used console games. 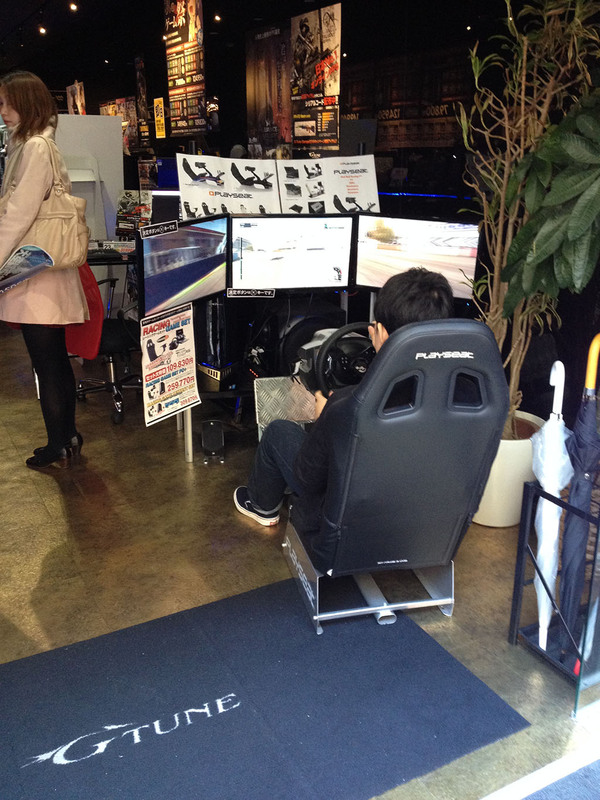 Nothing too new there, except for the fact many had a whole floor was dedicated to PC dating simulators. These are fairly popular with women. 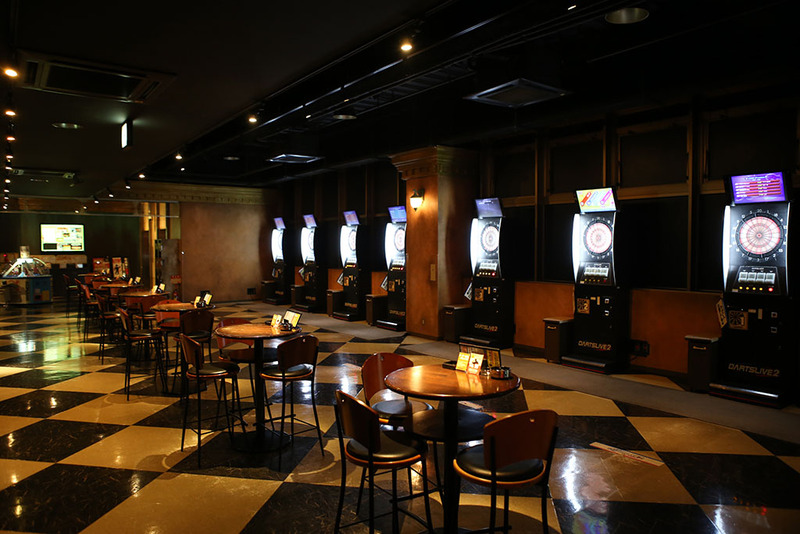 These games usually depict scenarios of high school or other situations in which you interact with other characters getting points for getting on dates with the right characters and performing dating tasks. It was actually amazing to see that there were literally HUNDREDS of these games. The fact many stores had a whole floor to them was surprising. 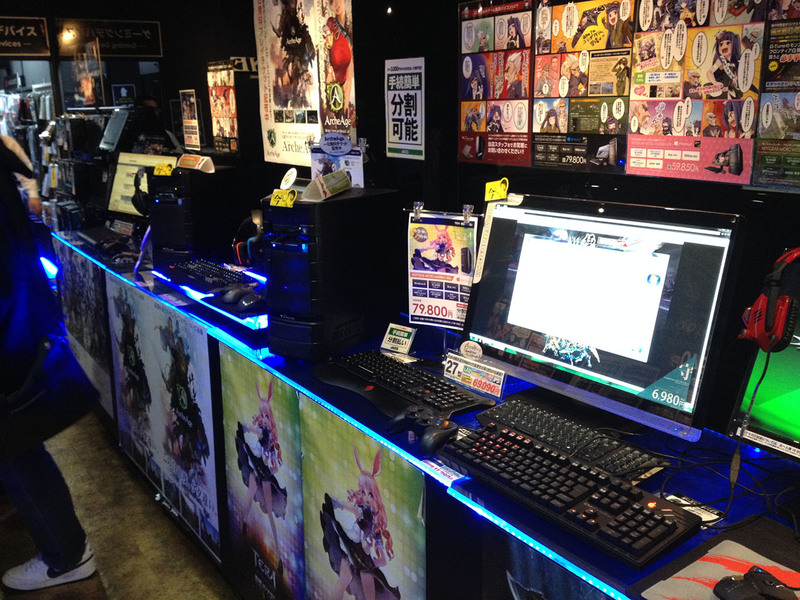 Guess it’s a genre of PC gaming I never knew was so popular in Japan. 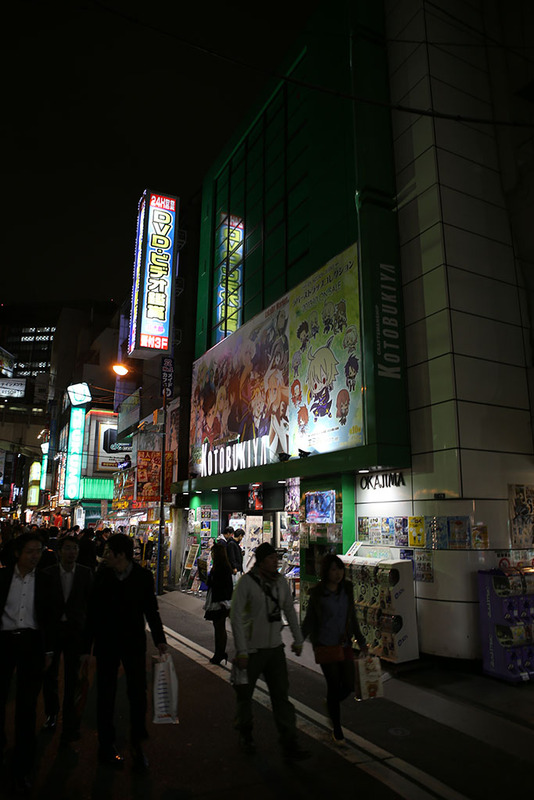 Unfortunately, I couldn’t put any pics of that up, because the other half of the most stores that had the dating simulators held Eroge games. Often they were mixed on same floor. (Eroge games are near, to fully, pornographic). After wandering down the main street and killing hours of wide-eyed wonder, I started returning to my starting point via the next block over. This was less flashy, but no less awesome. 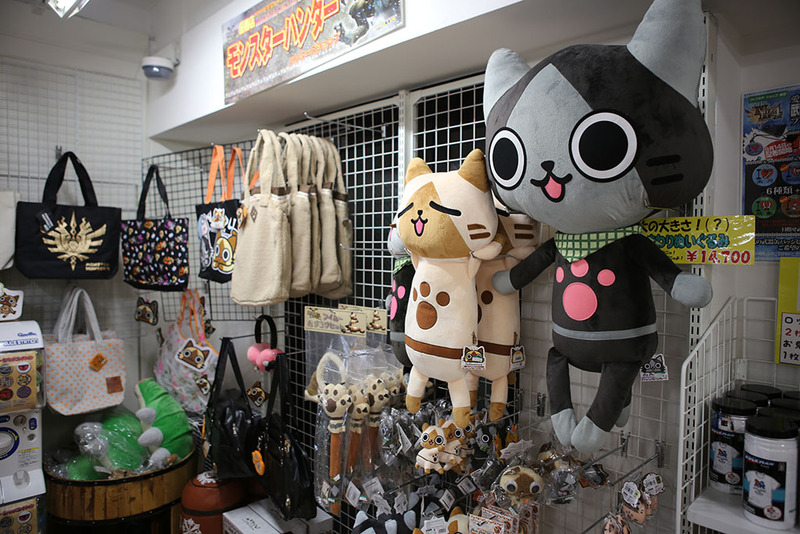 There was a larger cross-section of stores. 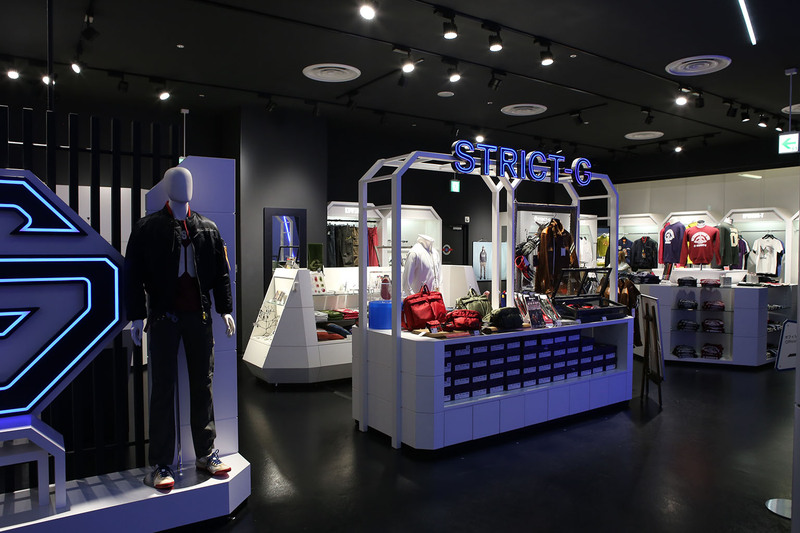 But up first is one of the first must-hit of the stores. 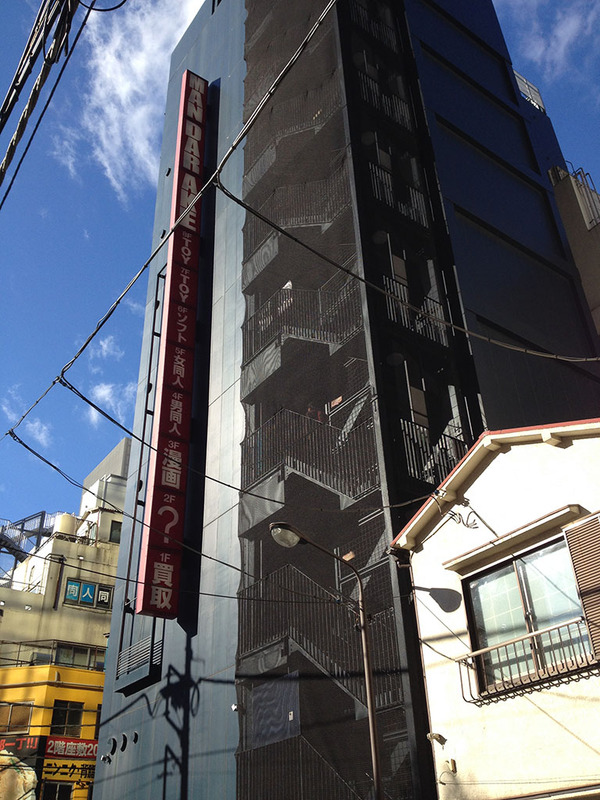 This black obelisk is Mandarake and well known must-hit spot. They have over 7 floors of geekery. 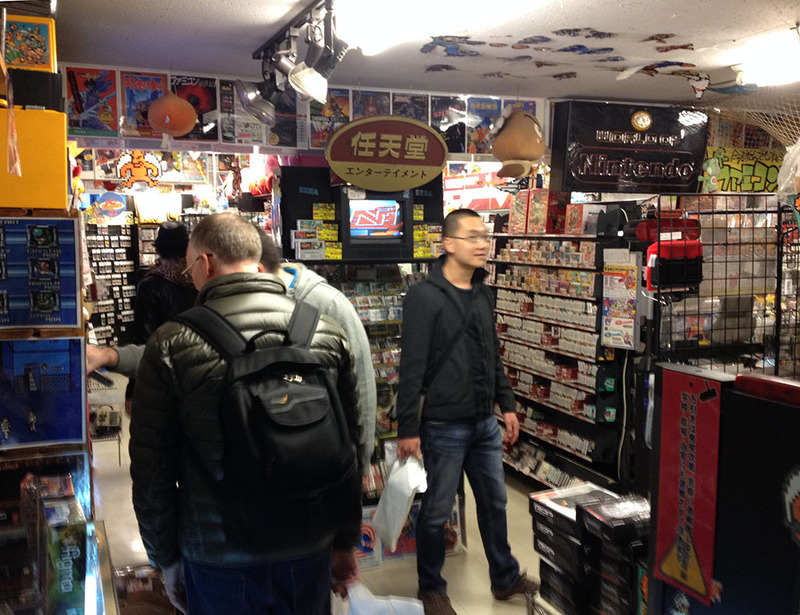 The shop is primarily known for collectable and rare toys, but also have anime, manga, collectable card series, and movies. How about these? 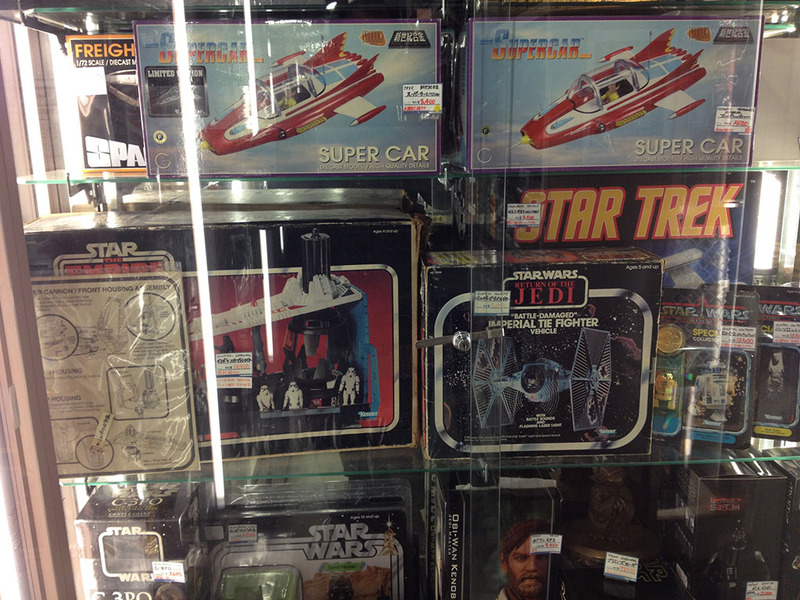 Original boxed Star Wars and Transformers toys. 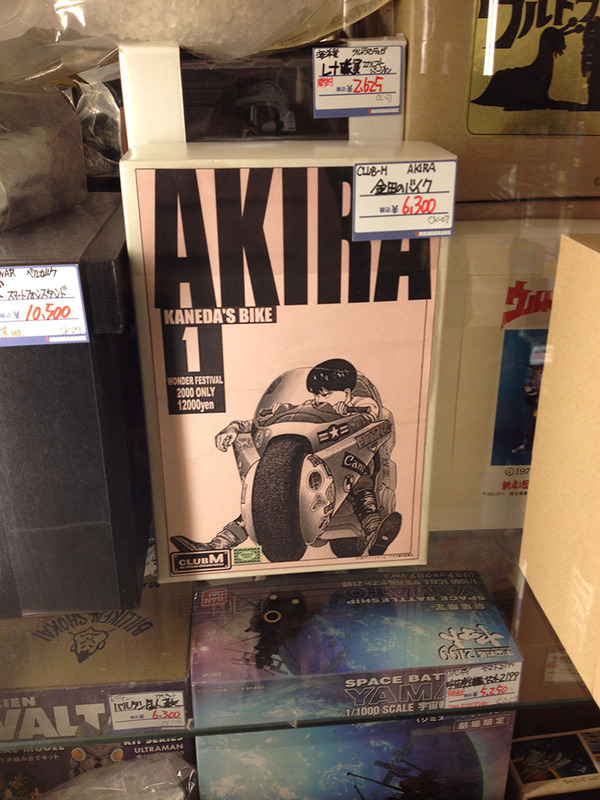 Original Akira promotional kits, etc. If you have a fond childhood toy memory – they have one of them there somewhere. It was amazing – but do have to admit some of the prices weren’t the best. 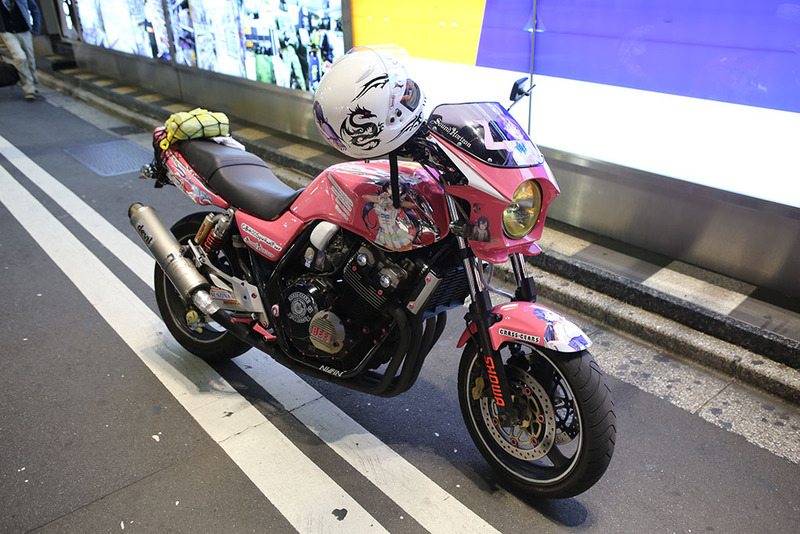 You can find slightly better prices on eBay or Yahoo Japan auctions for more common items, but they do have some one of a kind and extremely rare items that likely will never be found anywhere else. 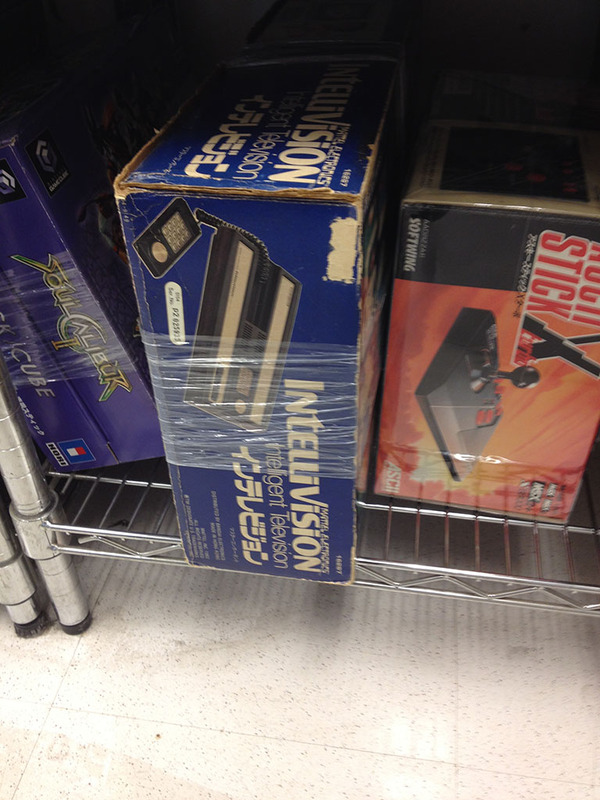 Another thing you’ll notice right away is that the used items are in absolutely amazing condition. 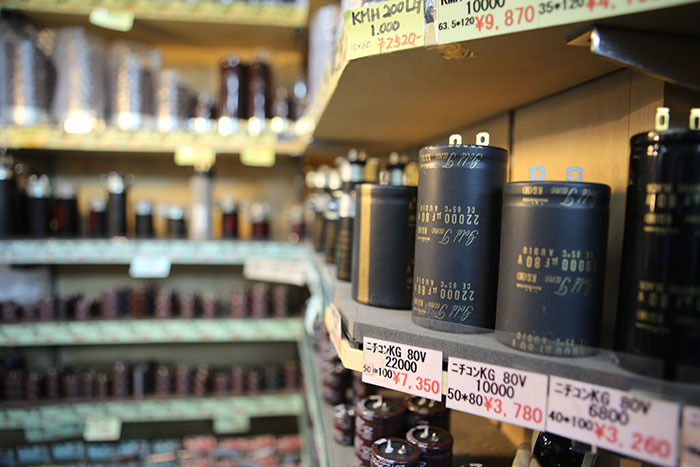 The Japanese grade used items and an item needs to be exactly as good as new to get an A grade. 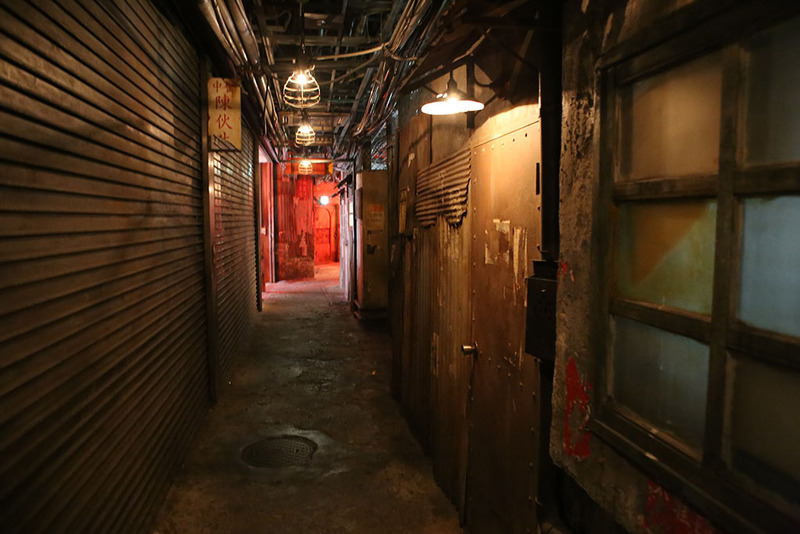 Amazingly enough, things that would qualify as A grade here probably wouldn’t even hit a B in Japan. You rarely even see a C – people simply don’t want them. Collectors here take amazing care of their items. 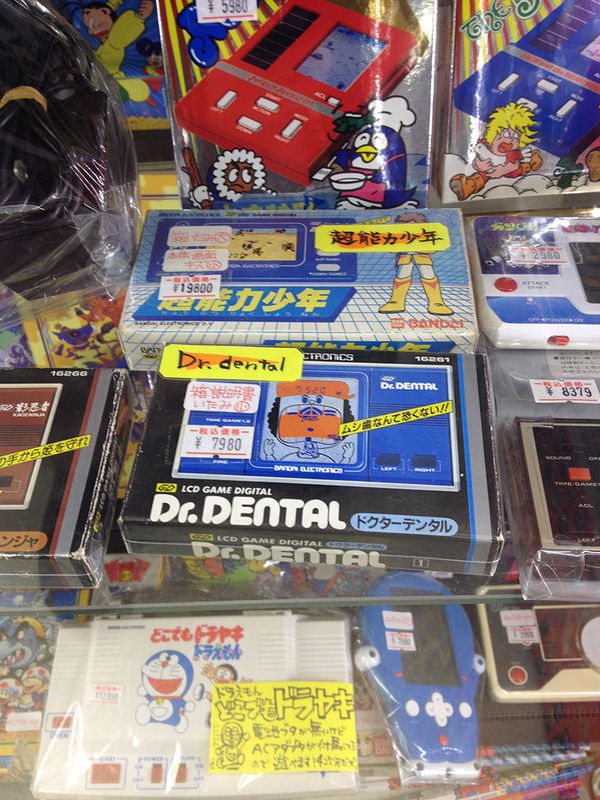 If you want absolutely pristine collectables – Japan is the place to go. 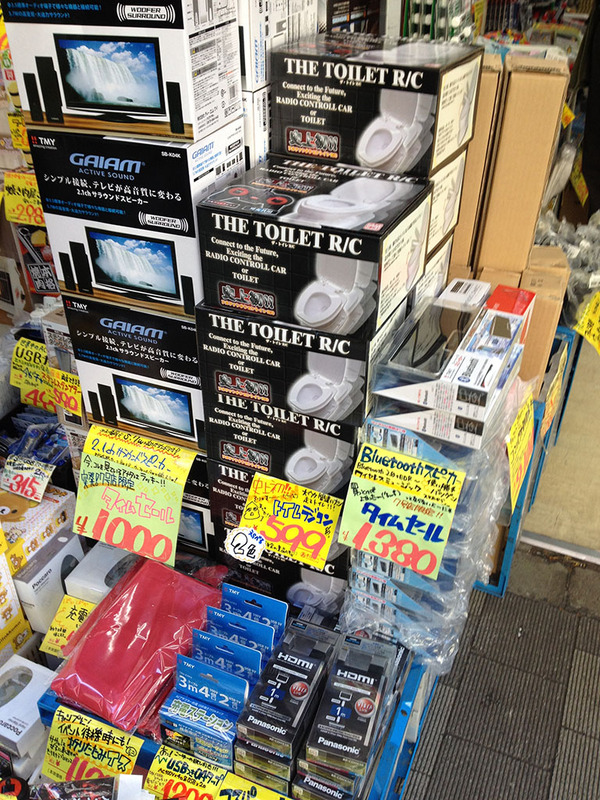 I walked a bit further down the street and low-and-behold, a PC shop! I had passed several small computer parts stores along the way, but this was different. 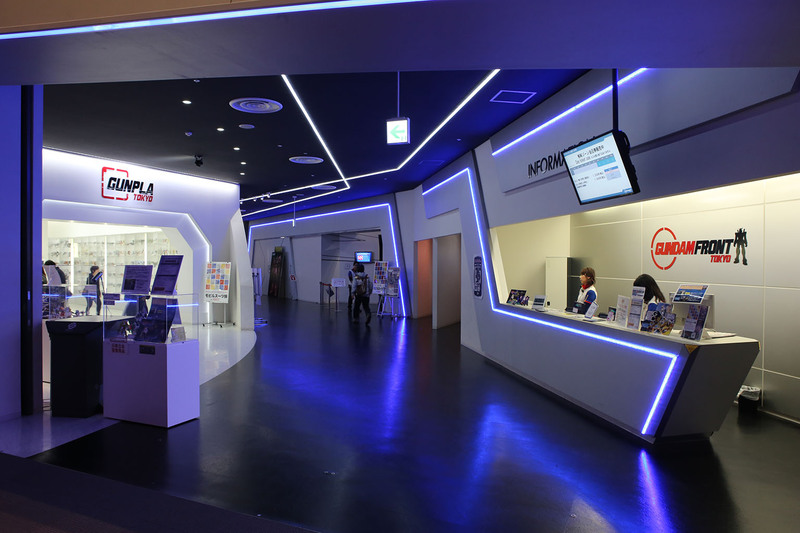 This was more of a glitzy retail store that had fancy, fully-built PC’s. 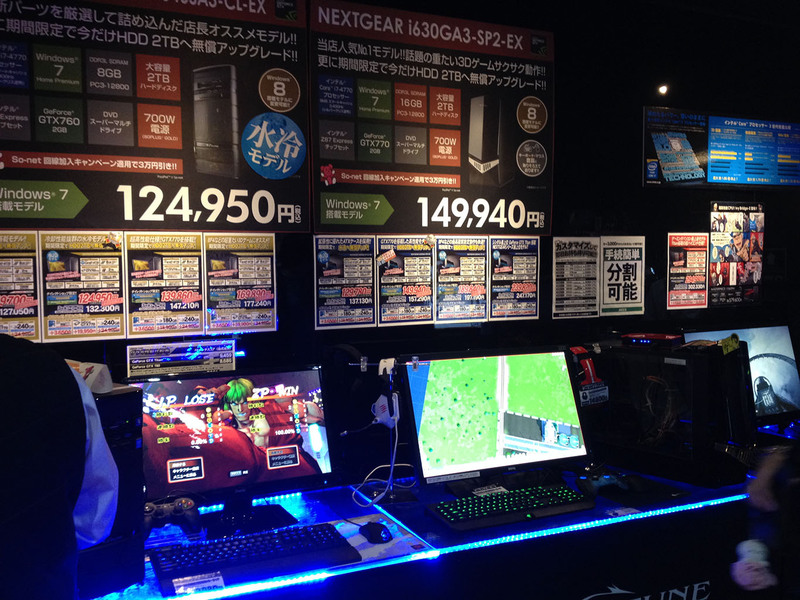 This is somewhat surprising considering the fact many consider PC gaming in Japan to be a nitch market. 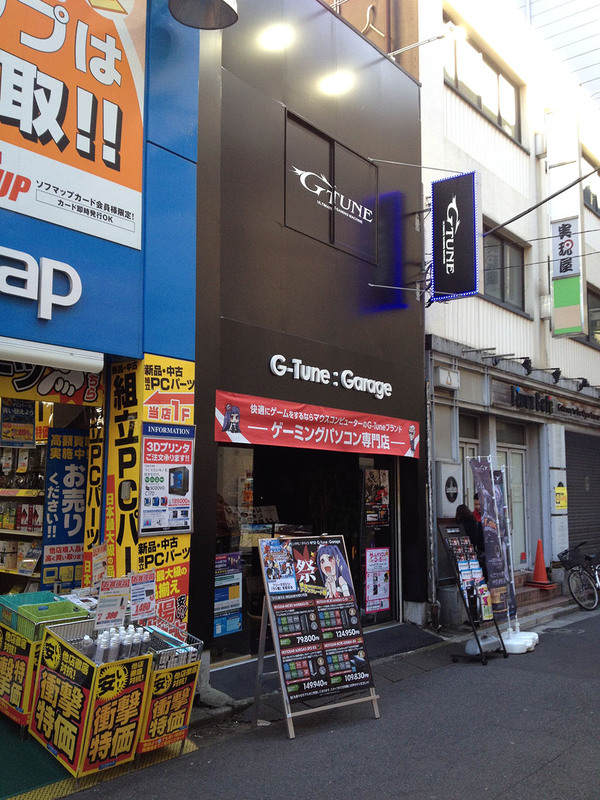 G-Tune, however, is apparently a growing brand in Japan as I had seen ads for them several other places during my travels as well. They had fully spec’ed out systems that were clearly well-thought out configurations. They were clearly focusing on the gamer market with these rigs. For about $1200, you got a fully loaded PC with a slick looking case/keyboard/mouse. 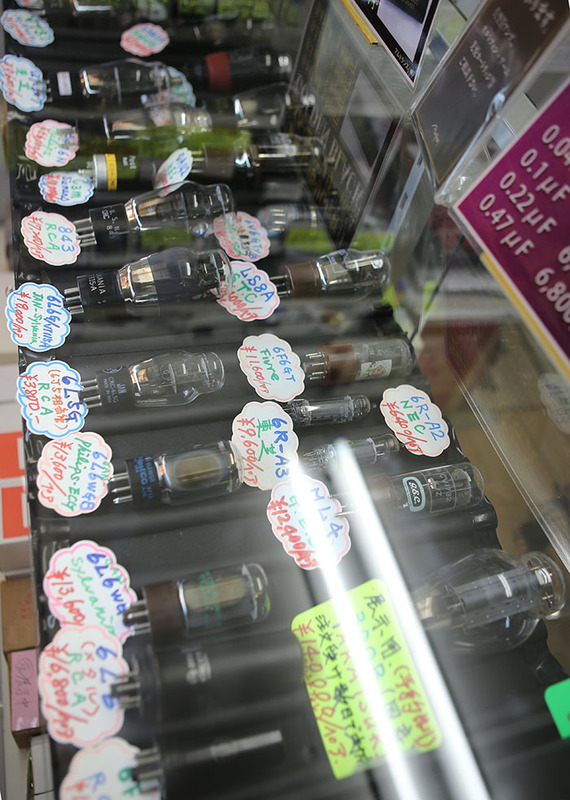 While a bit high, the prices were in the range of what one would expect for a higher-end ‘premium’ line like this. Interestingly enough, despite the fact the Japanese are notorious about adopting the latest technology – almost none of the systems had Windows 8 on them. They came with Windows 7 by default, with an option to buy Windows 8. 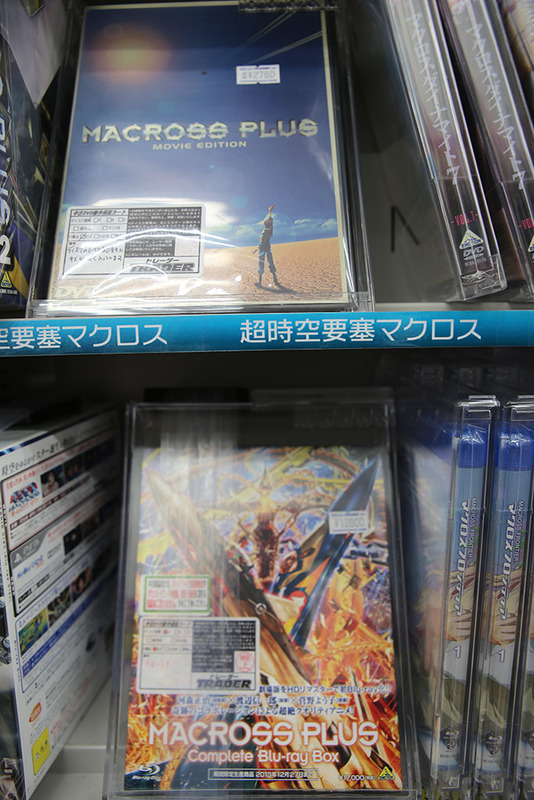 May people have panned Windows 8 a terrible desktop OS, and apparently the Japanese gamer’s market agrees. Next down the road is the amazing Super Potato. Down this innocent looking hallway is a gateway to amazing things. 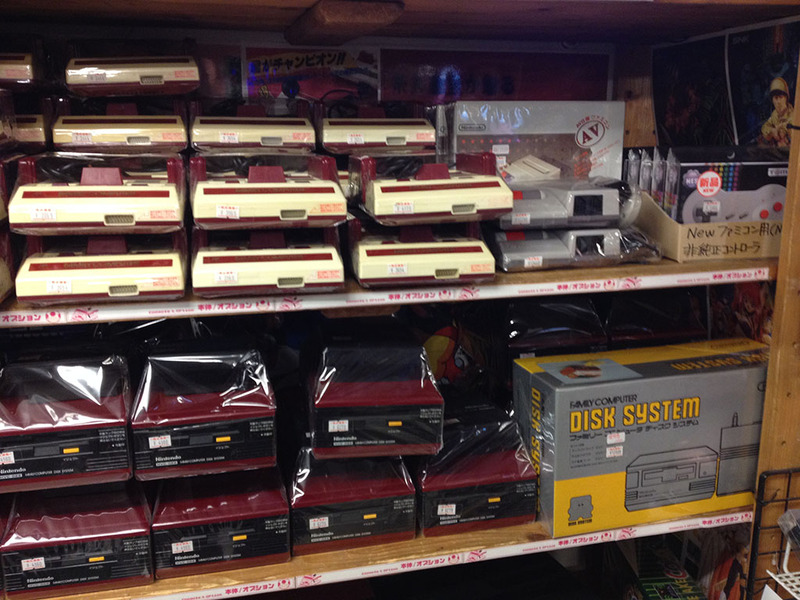 Floor after floor of amazing retro gaming goods. If one is careful, they can find some amazing items, deals, and take them back to the US. I found an original copy of Rez for Dreamcast for $20. 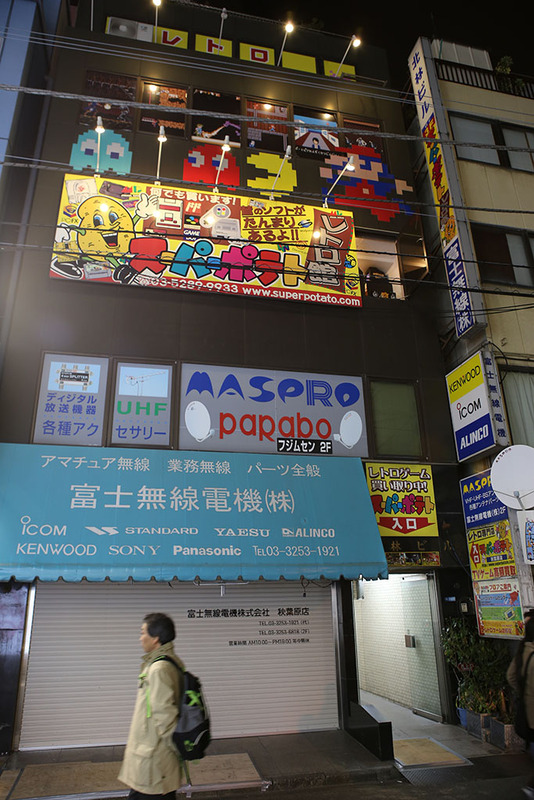 You need to be a bit careful because Super Potato has become a little more known to the tourist crowd so the prices aren’t necessarily the best. Still, amazing stuff. You also run across interesting things like this. 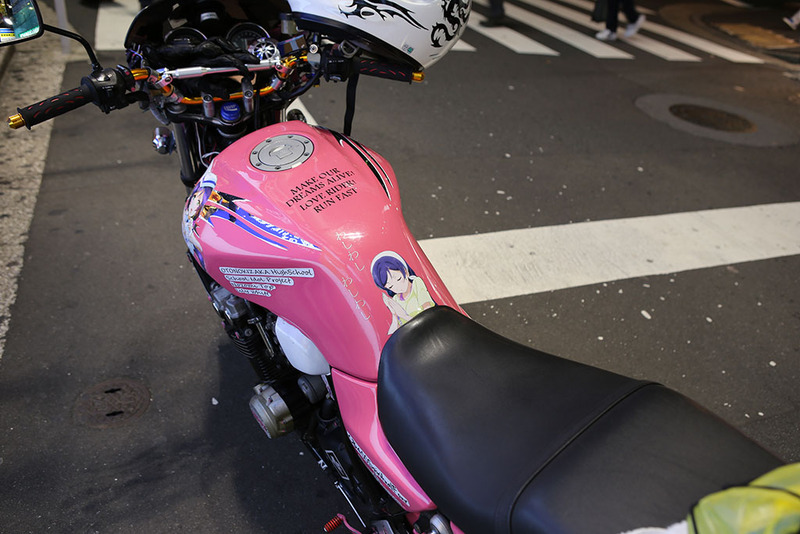 This guy’s bike was done up pink Anime style. 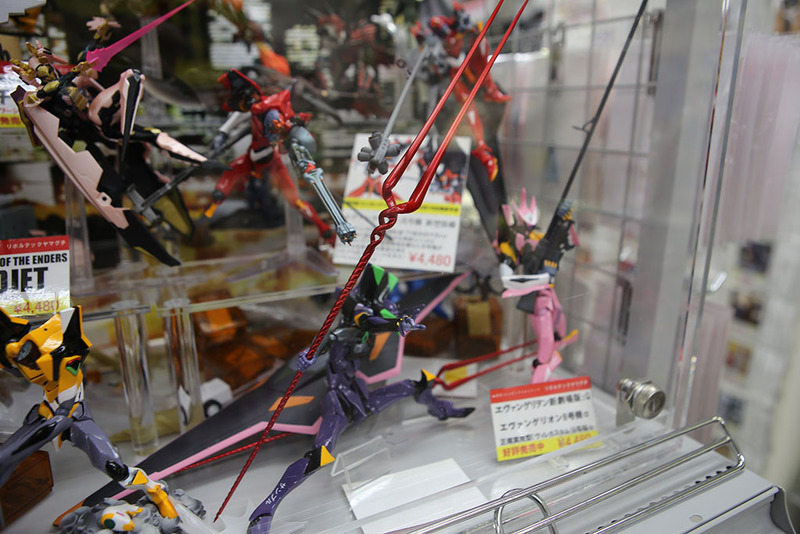 Next major hit down the road was an unexpected gem – Kotobukiya. 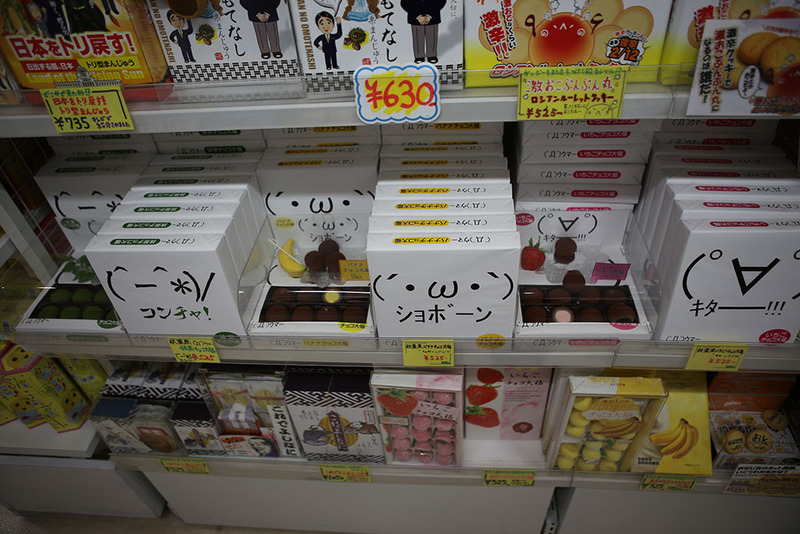 The first floor had some pretty standard Anime stuff – cutesy dolls, emoticon chocolates/candies, and man-shaped sleeping pillows….er…what? 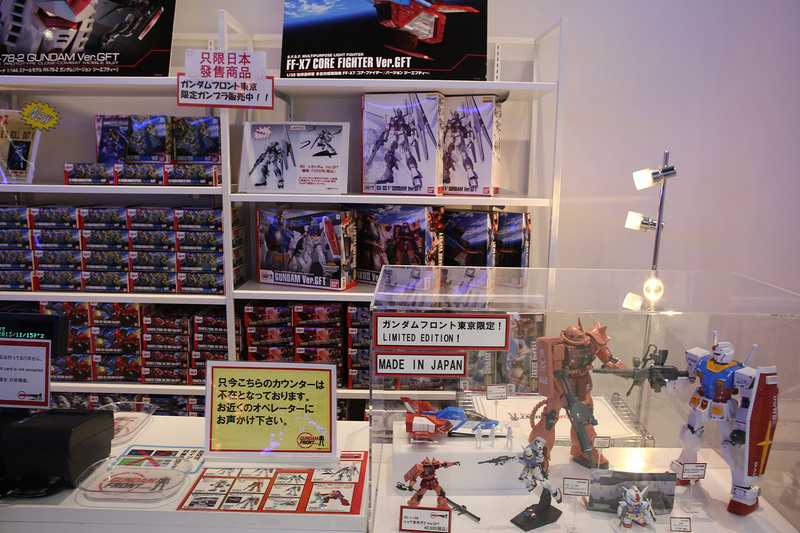 The second floor was amazing models and kits. 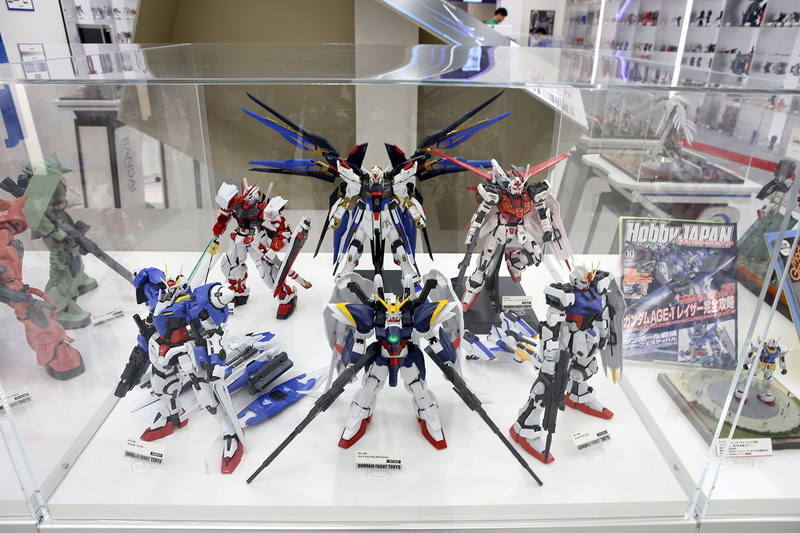 Kotobukiya apparently has a whole line of it’s own model kits (order-able overseas by the way). I have to admit these were pretty amazing. 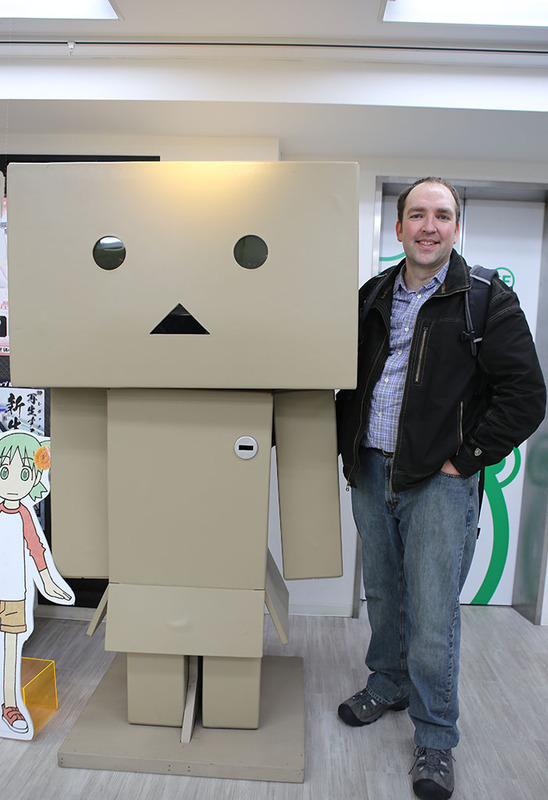 They also had this life-sized Danbo from the Yatsuba series. The third floor got a little weirder with dolls. 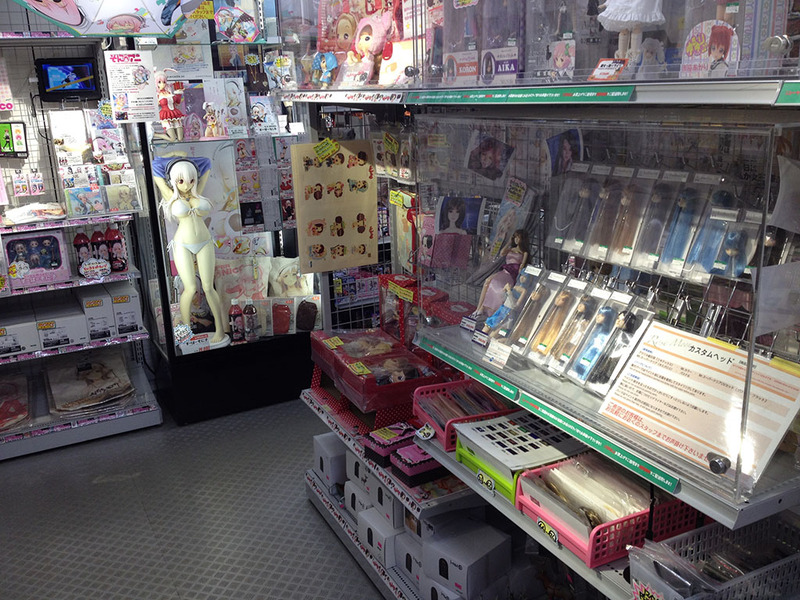 One sub-genre of Otaku culture is dolls. This floor had clothes, mannequins, wigs, and everything you’d need to make hyper-realistic dolls. While I recognized the craftsmanship, the dolls themselves kinda creeped me out. By now, it was getting dark, and I reluctantly headed back towards the train station with sore feet from a day of beating the pavement. But wait, what’s this? 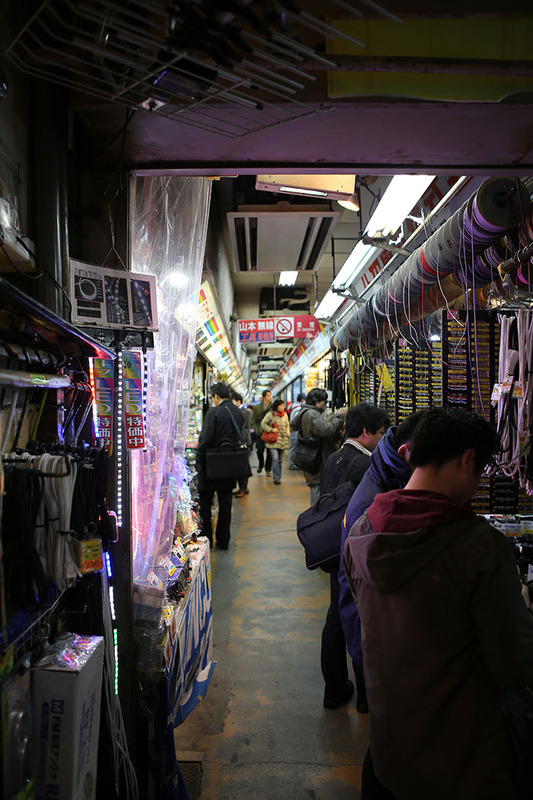 On my way back, I found some of the very old roots of Akihabara’s past: actual electronics. 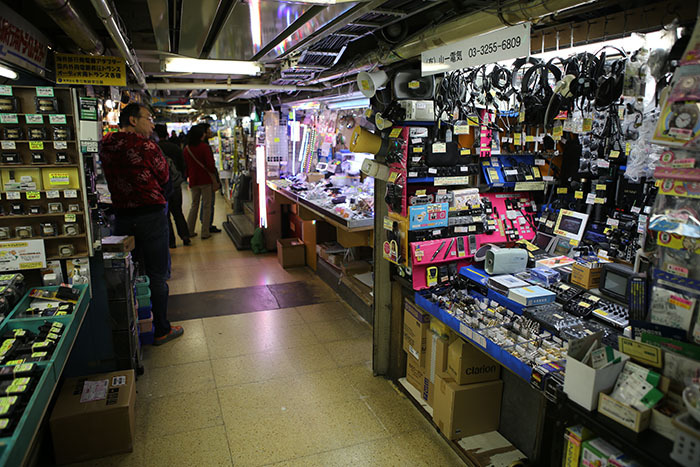 Down a very narrow opening between two buildings, and directly under the train lines, I found this little maze of electronics dealers. 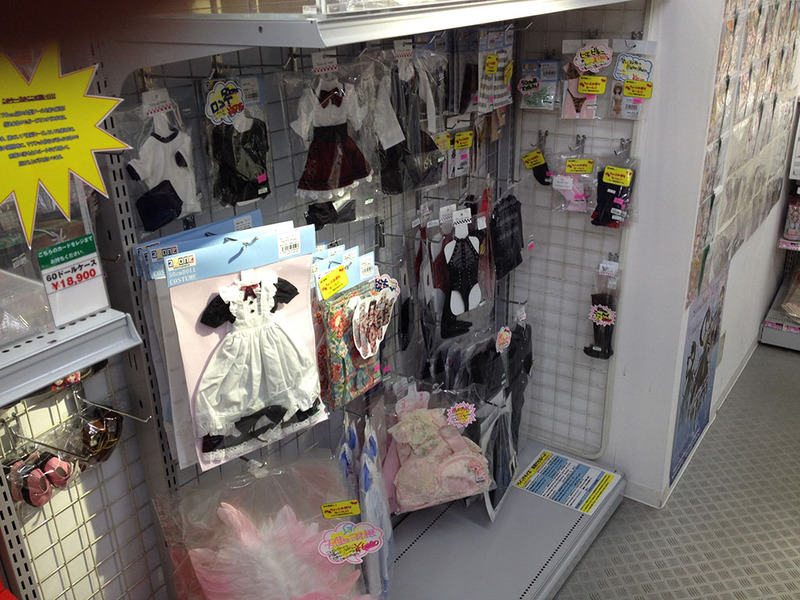 Store after tiny store – most specializing in something very specific. 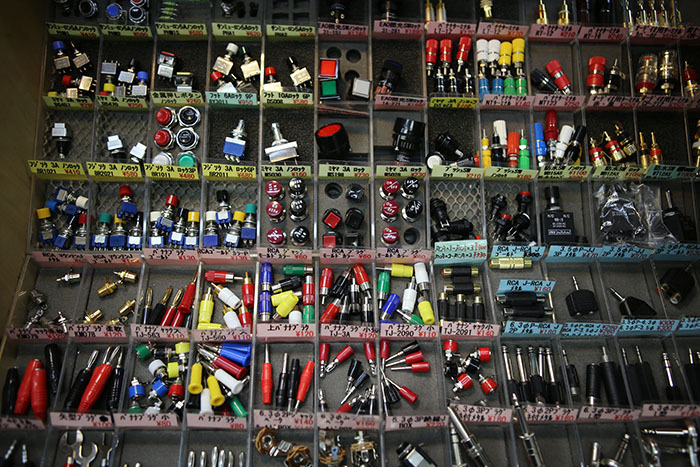 Vacuum tubes, capacitors, resistors, switches, surveillance cameras, multi-band radios, led lights. 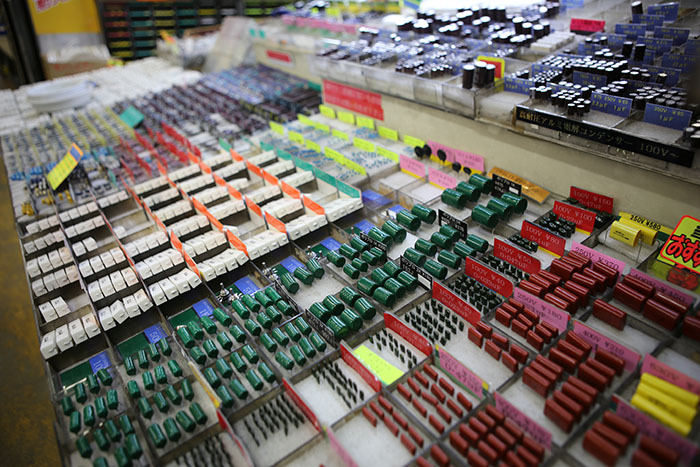 You name it – it was there somewhere (well, I didn’t see any Nixie tubes, but they were probably there somewhere). 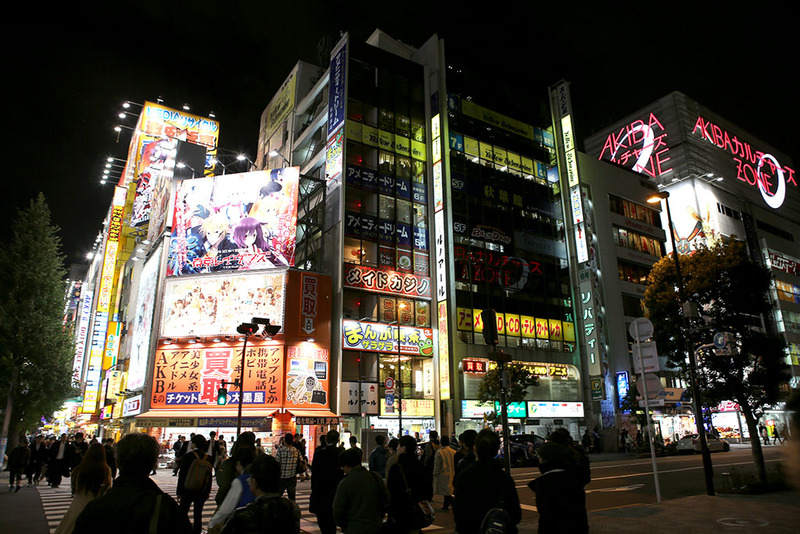 Finally, before hitting the train, I decide to stop by two famous eateries of Akihabara. 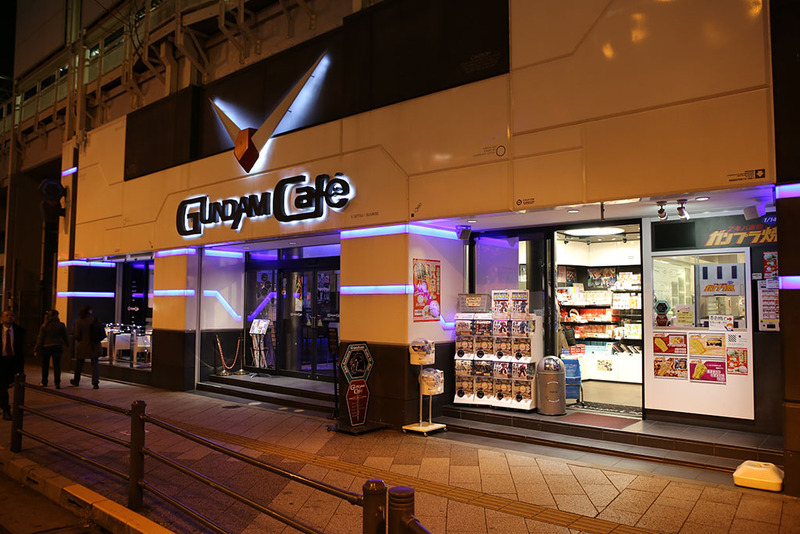 AKB48 and the Gundam Cafe. 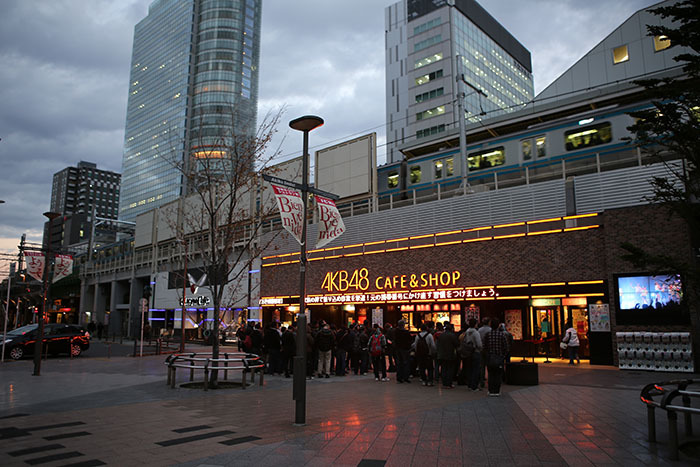 AKB48 is a cafe dedicated to the girl-band by the same name. This throng of fans was waiting outside for their dinnertime opening. 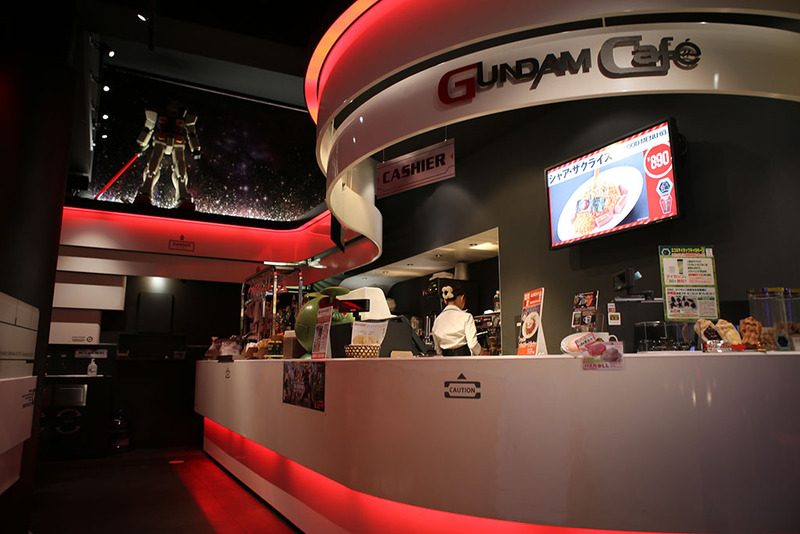 I however, was interested in the Gundam cafe. When I, I was told drinks were on, but food service hadn’t started yet. In about 10 minutes it would, however. 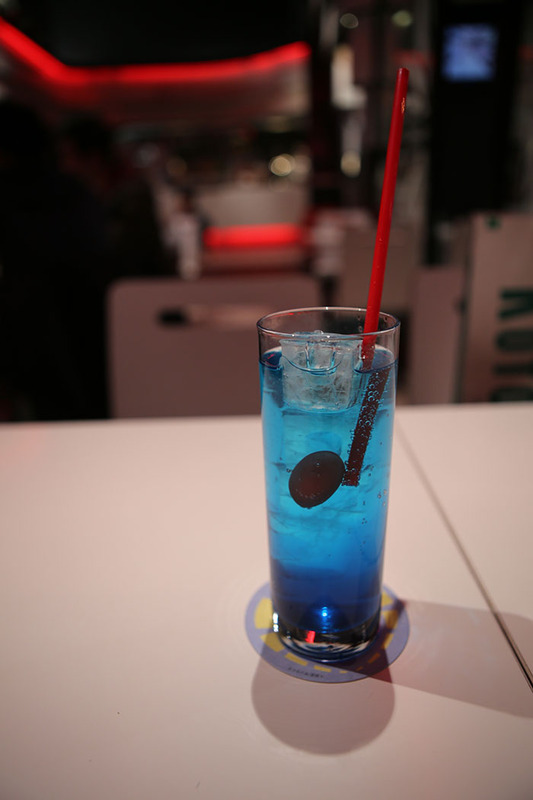 This was fine by me as I grabbed one of their signature Gundam drinks and found a table to rest my weary bones. This one was themed after a particular gundam wing that I forgot. It was very good and refreshing after that day of walking. As I’m sitting there, it suddenly hits the dinner hour and this happens. 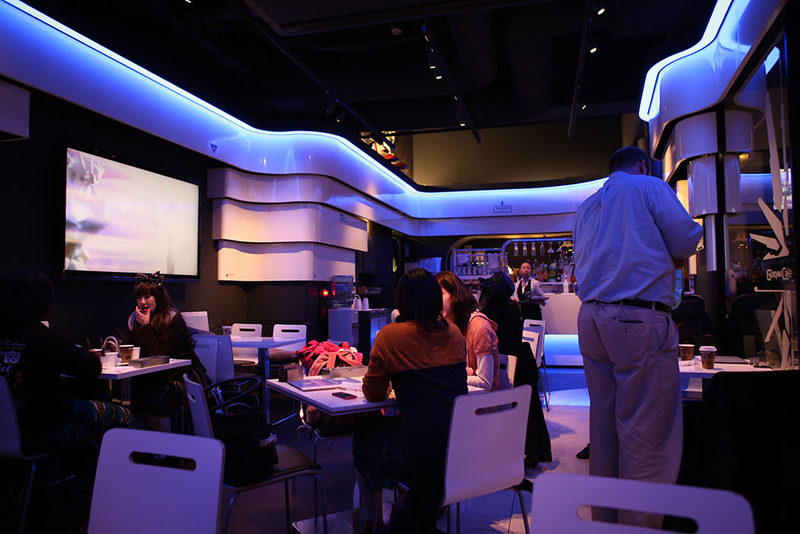 The lighting in the whole place turns blue, and I can now order some food. I got a bowl of classic Gundam aka White Mobile Suit.Notice the shaped noodles? Crazy. I also meet an interesting local guy who I had a great friendly conversation with. Turns out he works on his own video encoding system and was taking a break while his machines crunched on a batch of video processing. 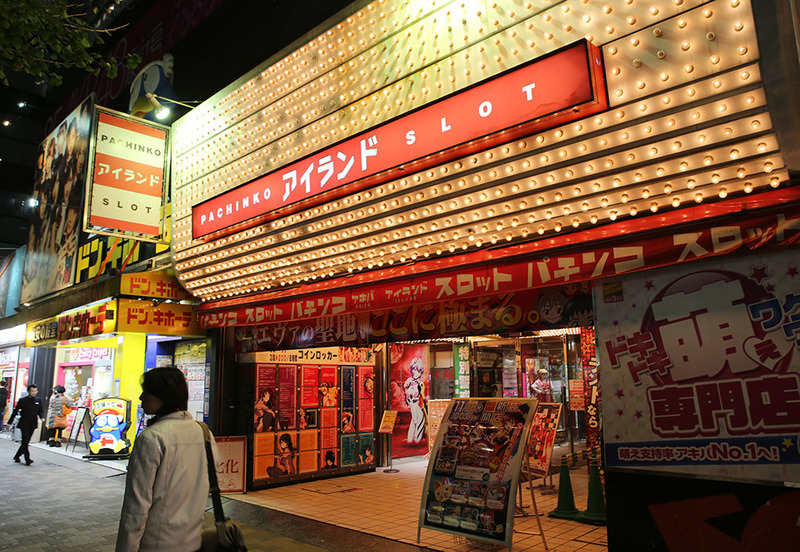 We talked of the differences between being ‘hard’ or ‘soft’ Otaku and the different kinds of Otaku. He was a little older, and was ‘hard Otaku’ on Ultraman, Thunderbirds, and geekery of that era. I said I was more of a soft anime Otaku fan and we talked about some series we both liked. Very enjoyable dinner and we traded making paper cranes for each other. Turns out, I seem to make them very differently than the way Japanese do. Interesting.